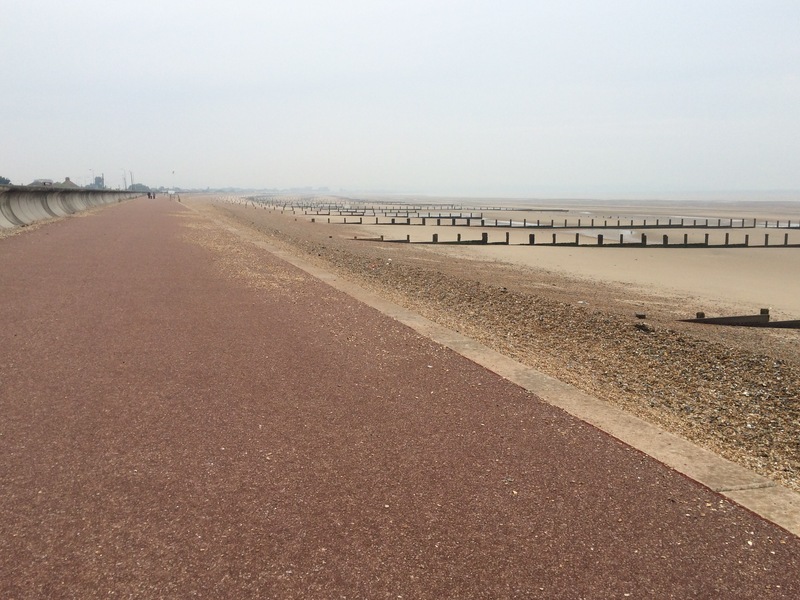 I set off along the sea front to Dymchurch and then on to Hythe. 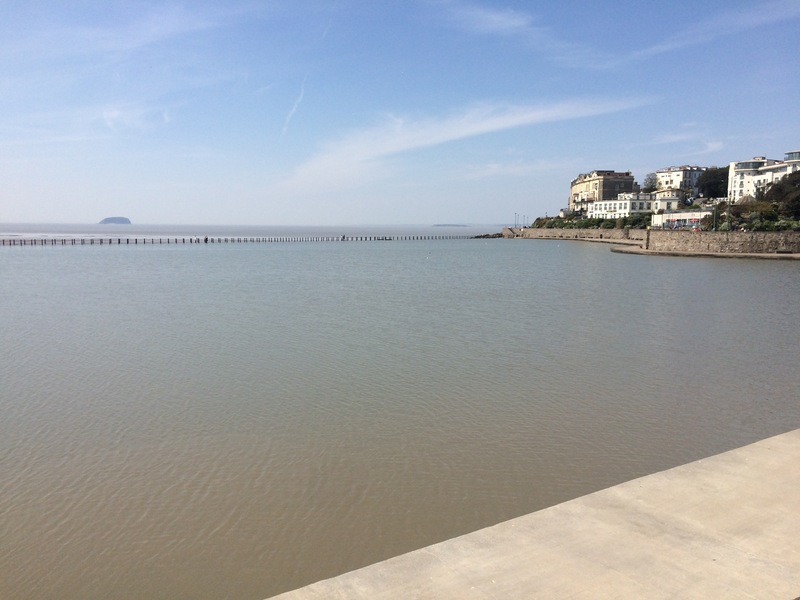 It was another grey day and the sea front seemed to go on forever just with changes to the type of promenade; concrete or Tarmac, raised or beach level, wide or thin. 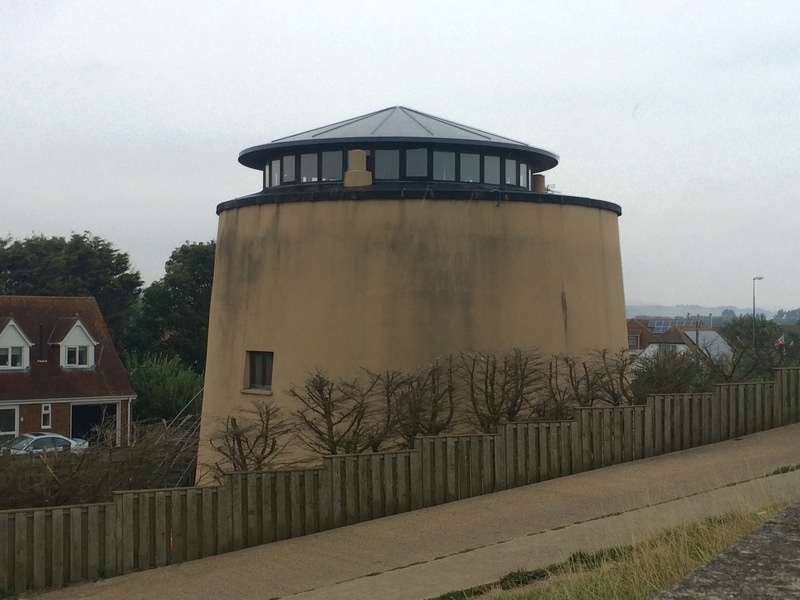 I passed a lot of Martello Towers today, all looking slightly different depending upon their current usage or decoration. 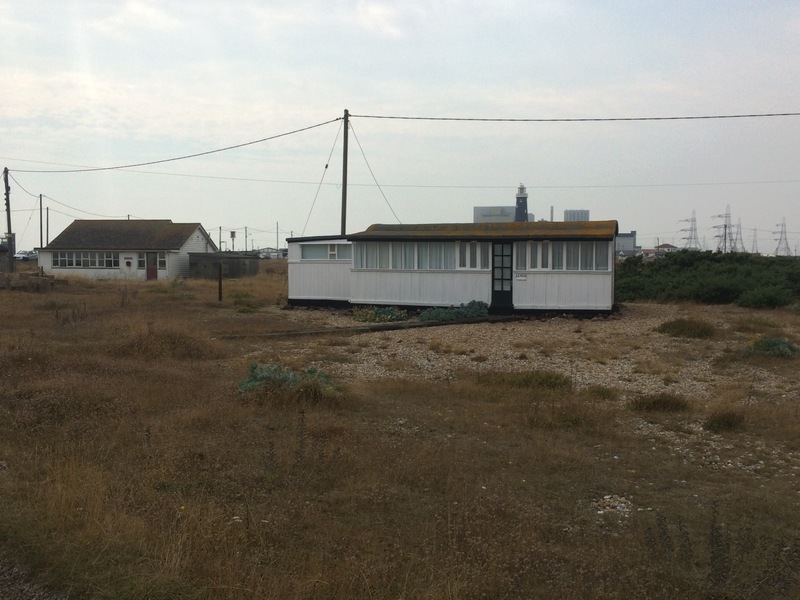 I passed along the fronts of St Mary’s Bay and Dymchurch, neither places looked particularly appealing. 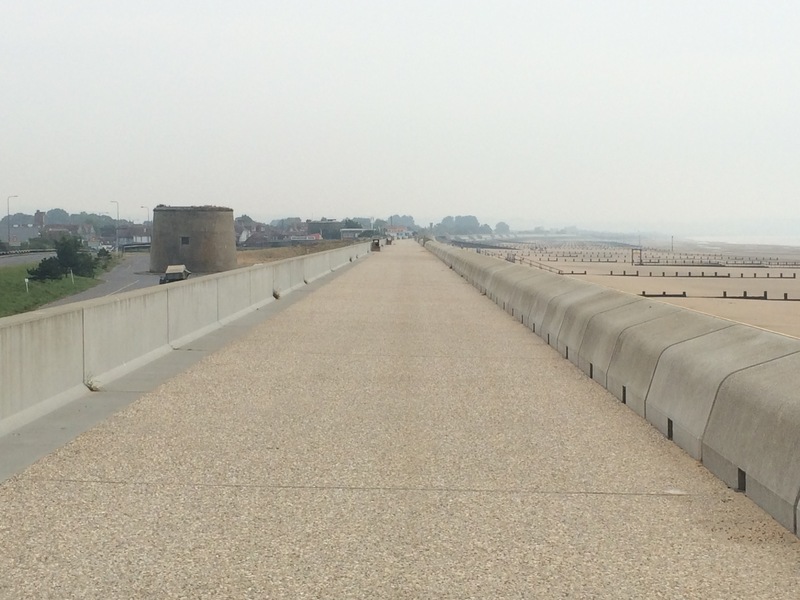 another promenade, another Martello Tower, it must be Dymchurch! 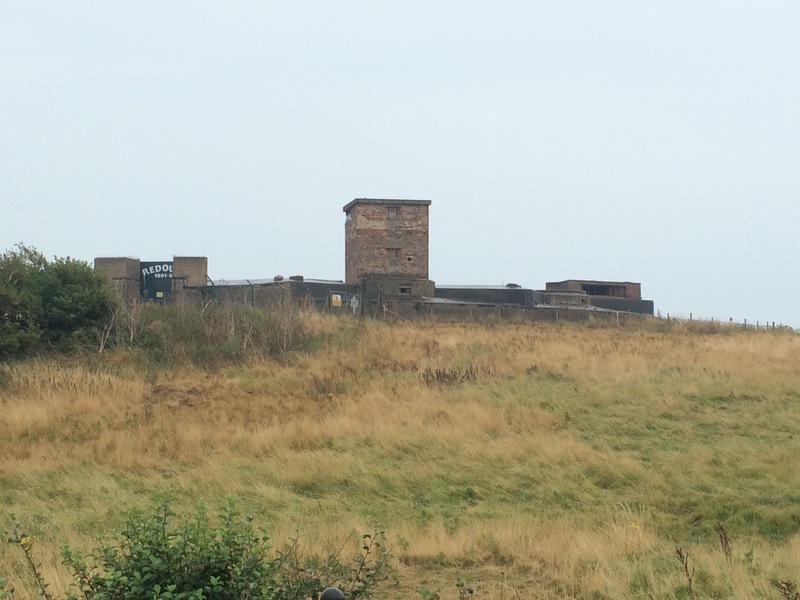 Halfway between Dymchurch and Hythe is the Dymchurch Redoubt, which was originally a depot built in the early 1800s to service the 21 Martello Towers in the short stretch between Rye and Hythe. 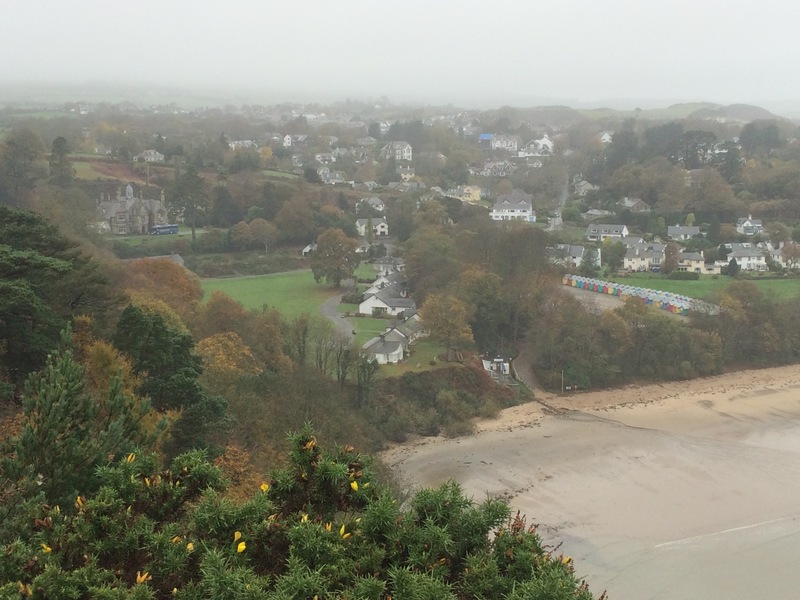 It was a very grey day and heavy rain and winds were forecast, hence I had started early. 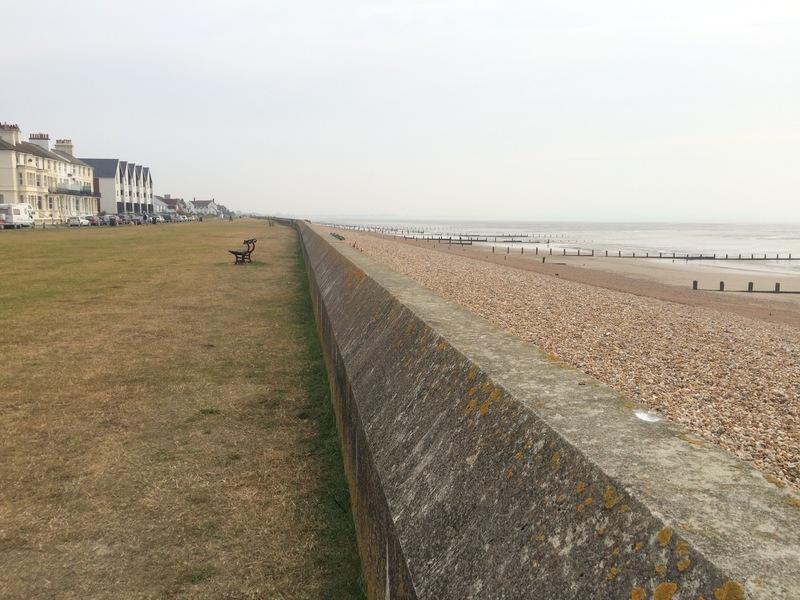 I caught a bus for 2 miles along the main road from Dymchurch Redoubt to Hythe as the footpath was pushed off the sea front by Hythe Ranges and followed the main road. 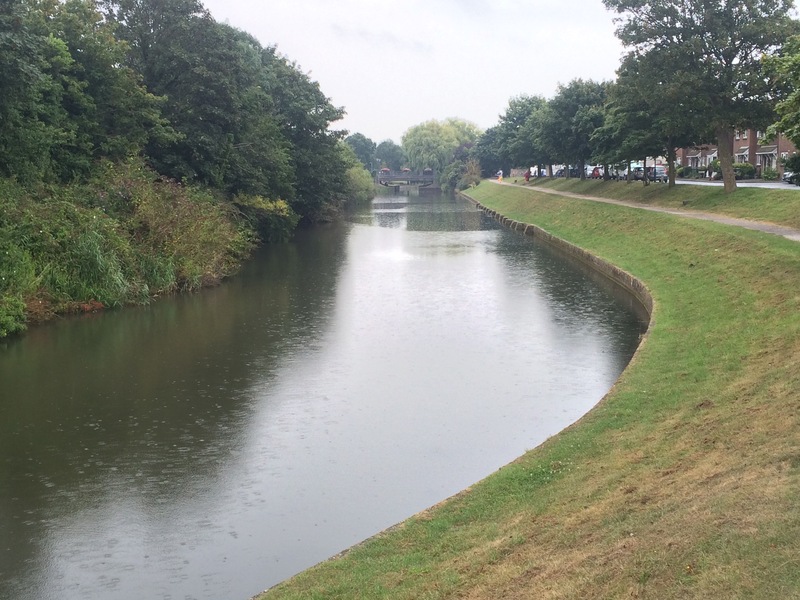 In Hythe I found the Royal Military Canal again, as it cut out the the sea. 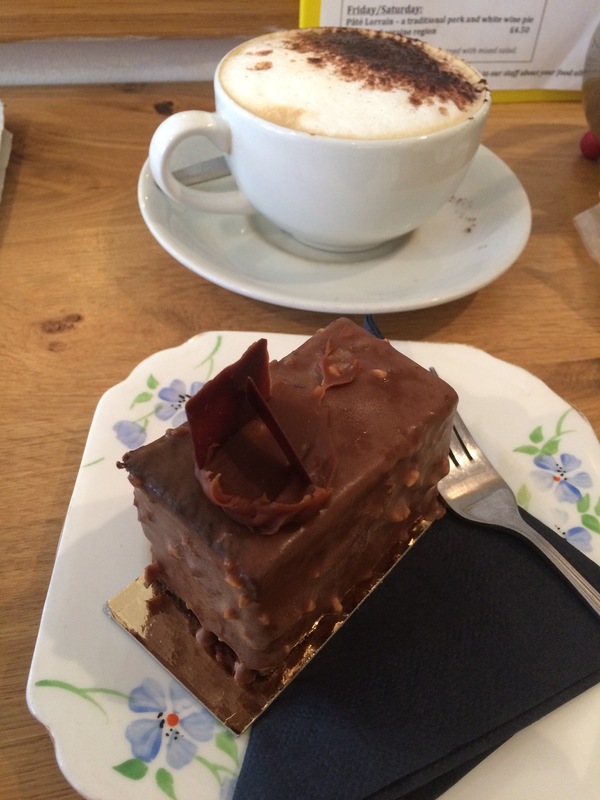 The town centre was quite nice, with lots of independent shops, and I stopped at a lovely French Patisserie for coffee and a fancy cake as it had just started to rain. 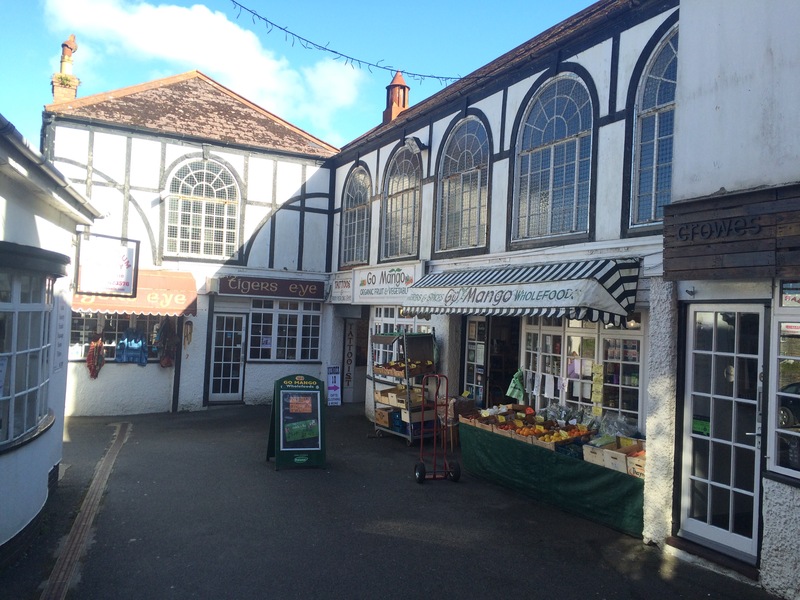 Hythe labels itself as “the jewel of SE Kent, where the countryside meets the sea”. 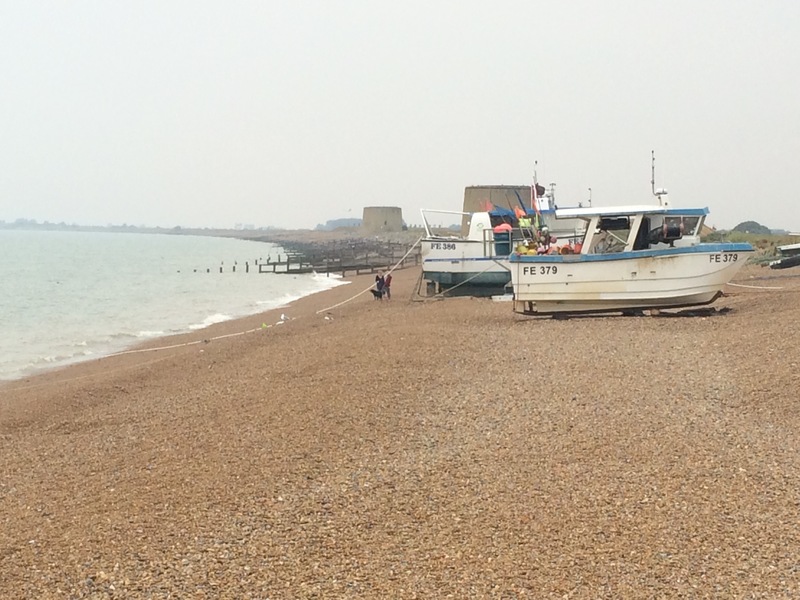 Like Hastings, Hythe also had a fisherman’s beach. 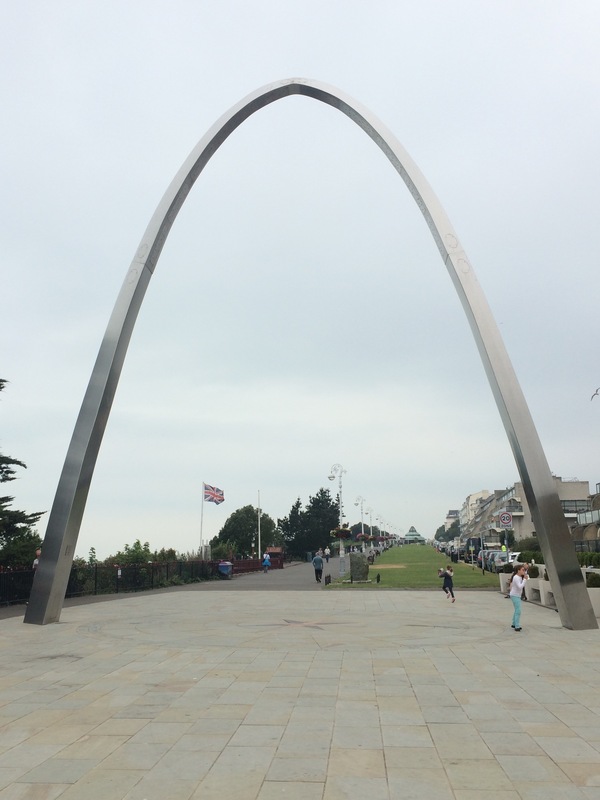 It had stopped raining when I set off along the promenade to Folkestone, but it was very cloudy and only a matter of time before more rain fell. Fortunately, by the time it did, I would be ensconced in my hotel room for an evening of relative comfort watching the Olympics on television. 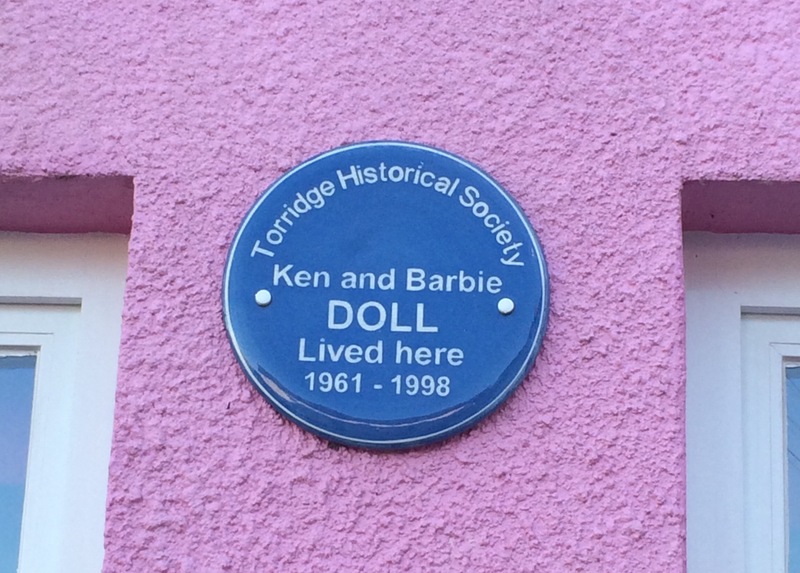 Folkestone has been a popular seaside resort since the 1800s (presumably after everyone stopped worrying about Napoleon invading). 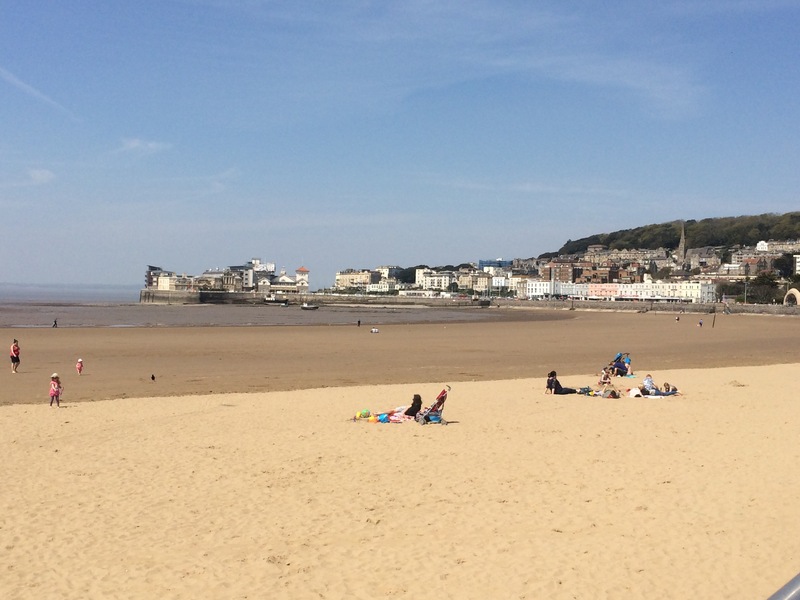 It has the requisite beach huts and promenade but sadly no pier. Its pier was opened in 1888 and demolished in 1954. In the meantime it was the host for Britain’s first ever recorded beauty contest, in 1907, that was one by Netty Bainbridge. 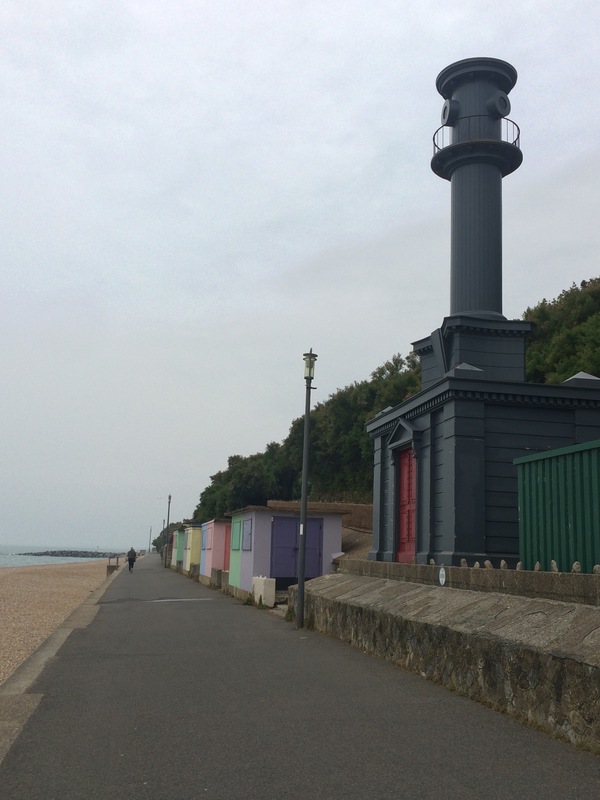 Folkestone is built on a cliff and so I found myself walking along the promenade at the base of the cliff. 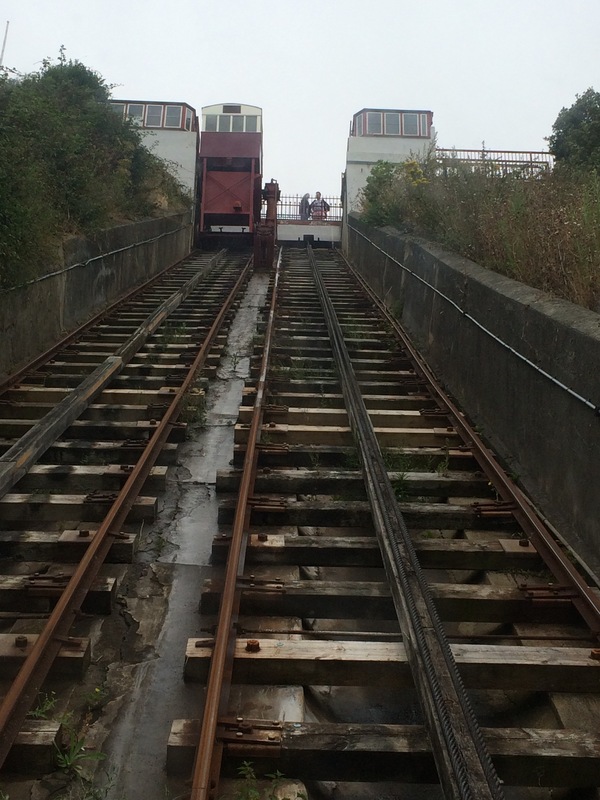 I didn’t need to walk up the cliff road as I could get the Leas Lift, a water balance cliff lift, up to the top. I walked past a few big hotels and through the main, soulless, shopping centre to get to the post office where I should collect my next set of maps. Yet again I was let down by the Post Office (for the 3rd out of 5 times) as their staff don’t even know what services they provide (despite previous phone calls and assurances). It was incredibly frustrating and I struggled to retain composure. The smallest things can seem soul-destroying on this sort of trip, and an extra 2 mile walk to be so frustrated was not a good end to my day. Fortunately there was a Waterstones in the town centre so I had to walk there and buy some more maps. I arrived at my hotel feeling miserable and lonely, and definitely not in the mood to be messed around with a sub-standard room (my wifi didn’t work so I had to move rooms after I had carefully strewn all of my wet kit and tent all over the place). It was just not my best afternoon. Roll on tomorrow! I packed up early and headed off to catch the bus back to Rye, arriving before 9 am. 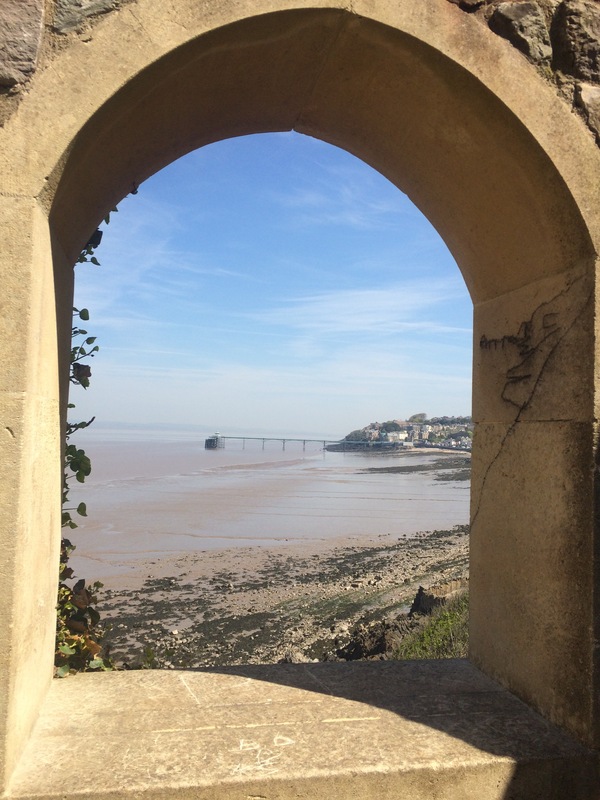 This gave me chance to wander once more through the town in the quiet of the early morning and to stop for a big breakfast in a cafe. I admired the view from Ypres Castle atop the hill and walked through the last remaining landgate built in 1329 from a grant by King Edward III to fortify the town. 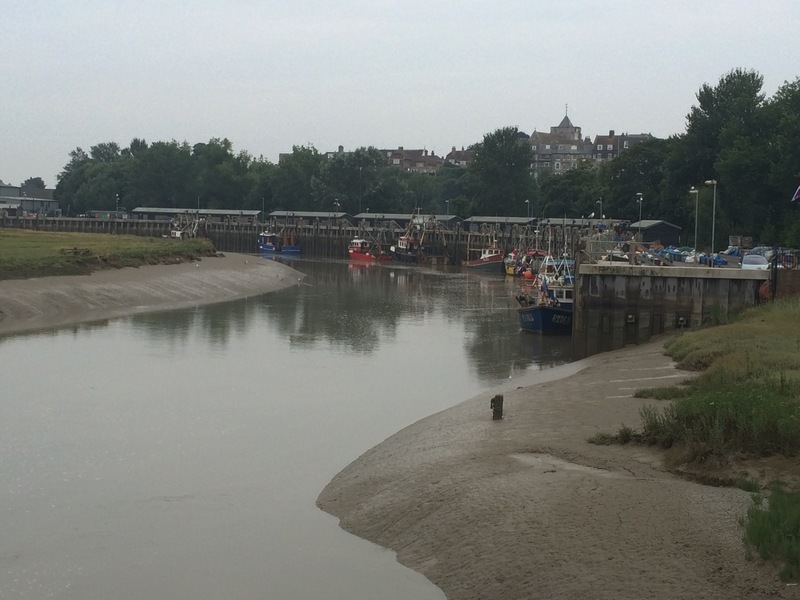 Then I dropped down to the River Rother, crossed the bridge and headed for Camber. 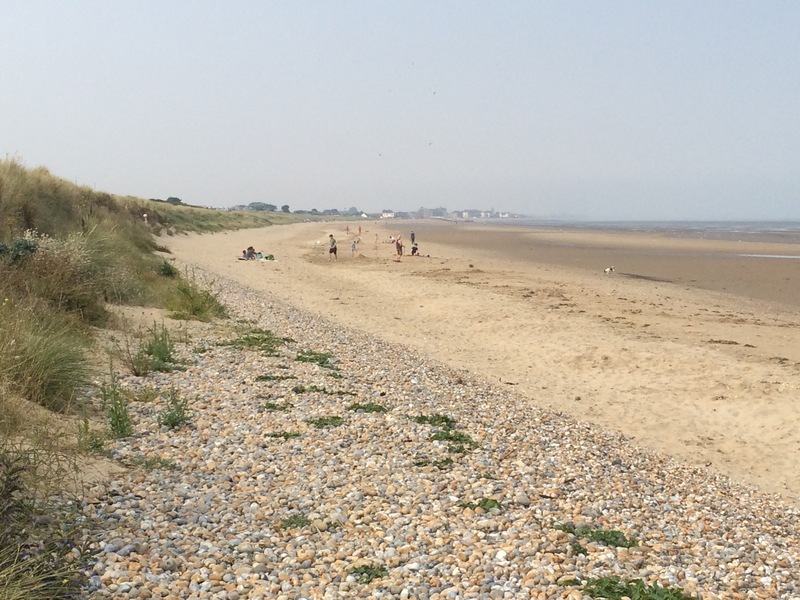 Camber Sands was the first sandy beach I had seen since Littlehampton; most of the South East coastline being shingle. 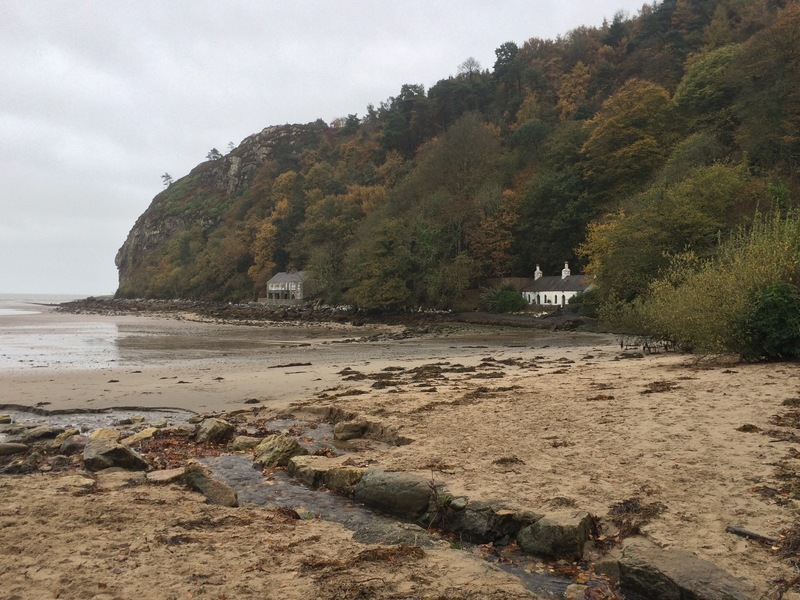 The sandy beach was lovely (although a couple of weeks later I found out how lethal the currents can be when sadly a few people lost their lives swimming here). 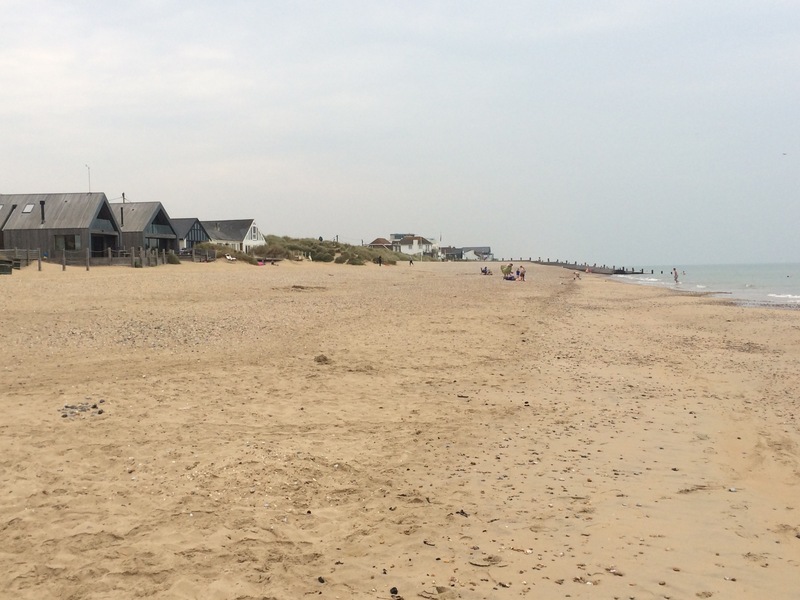 I walked past some lovely houses built at the back of the beach, one of which I had spent a night in (thanks Nicki) a couple of years ago, and been swimming in the sea 2 days before Christmas. This time I didn’t stop for a dip. 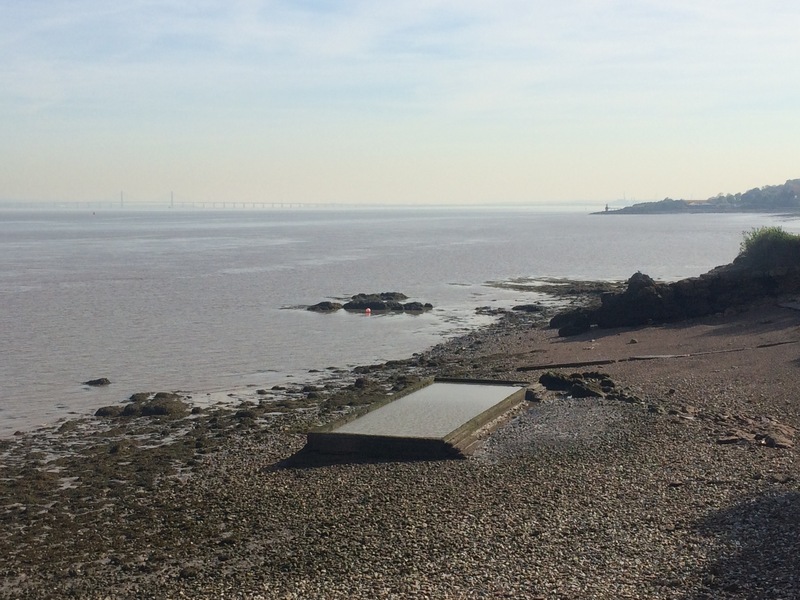 Rather than walk through the deep sand I climbed onto the sea wall to walk to Jury’s Gap, where I was forced inland to Lydd as there was no way across Lydd Ranges. 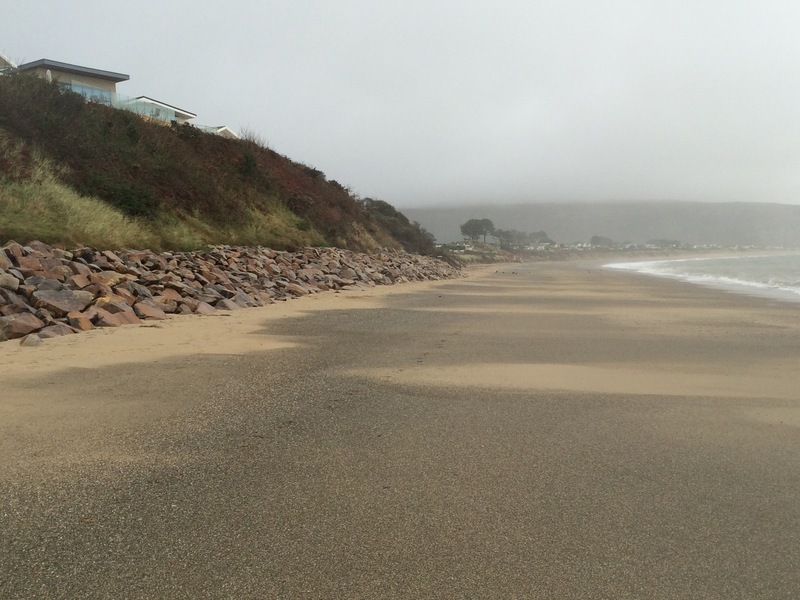 The sea wall was part of a new coastal defence scheme and only opened in March 2016. 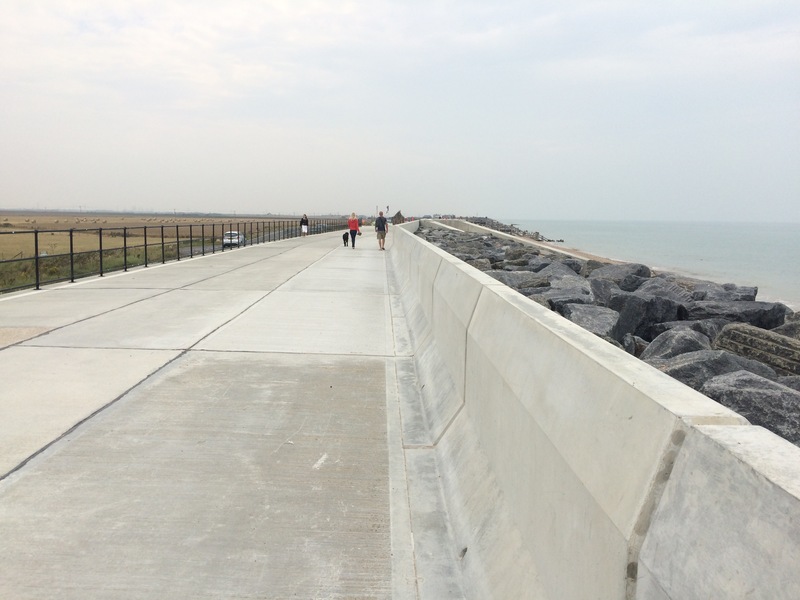 It is designed to protect 1,400 homes and businesses across the low-lying marshland, sandwiched between the sea and the Military Canal. 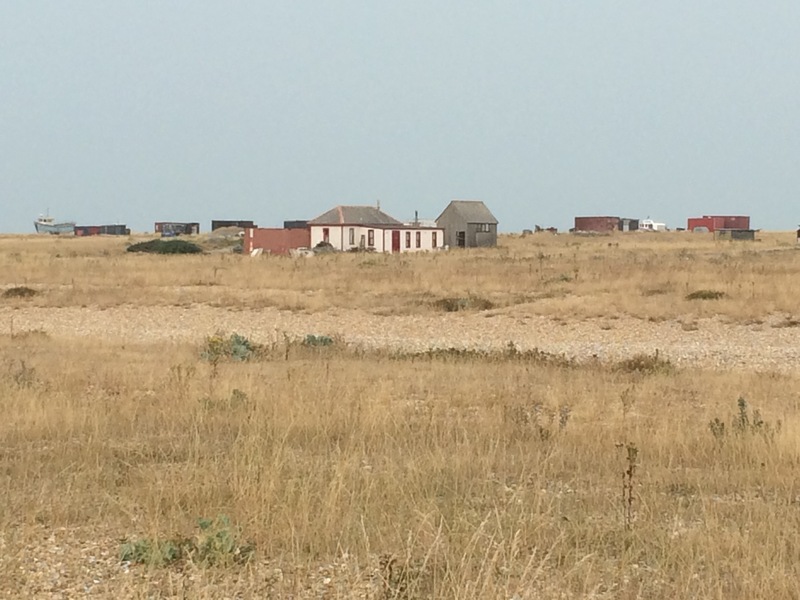 It was going to be a boring, hot walk alongside the road to Lydd so I cut out about 3 miles by catching a bus. It saved me about an hour and carried across the county border into Kent. 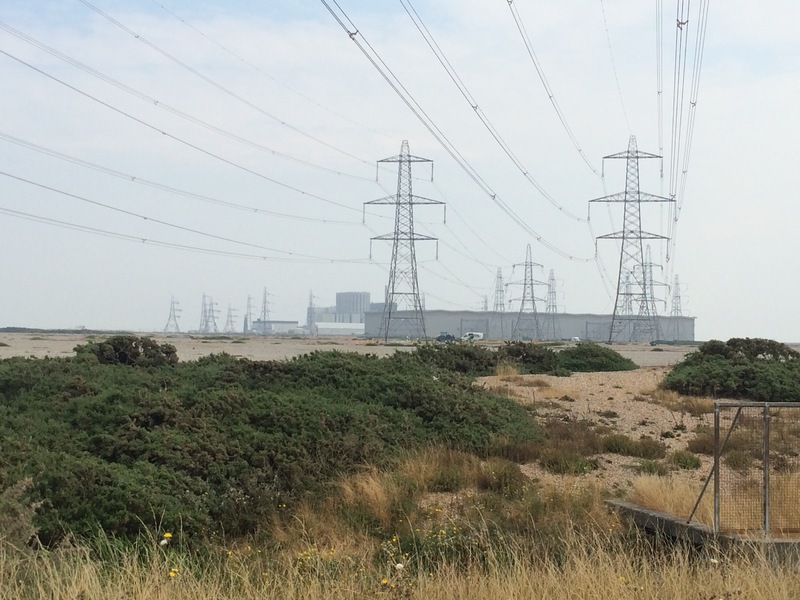 From Lydd I followed the huge overhead power cables that tracked over the ranges and led me across Denge Marsh and Denge Beach to Dungeness. What an eerie place! 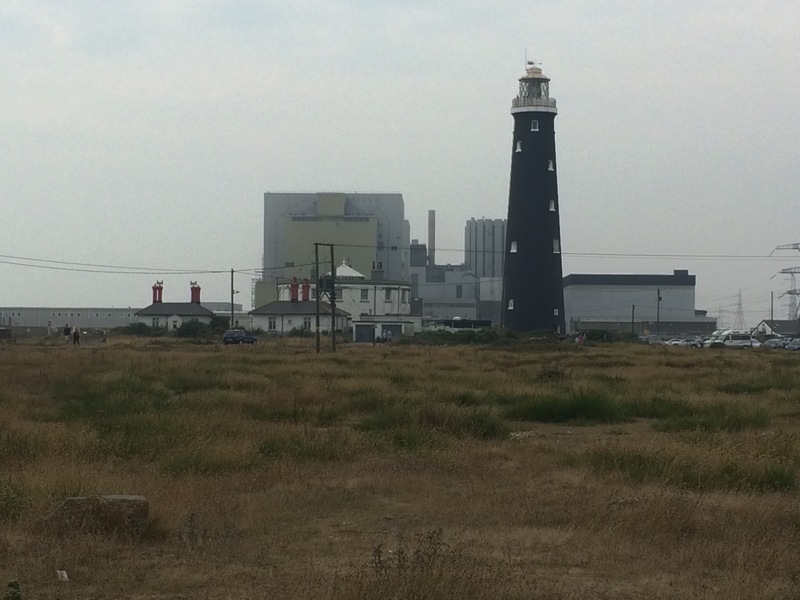 I could hear gunfire on the Lydd Ranges and stopped to ask for guidance from a guard to check that I could reach Dungeness Power station following the road/track I was on. I passed a strange, dilapidated farm in the middle of the ranges and in the shadow of the power station pylons. As I walked past it there was a flock over a hundred gulls (I tried to count them) swirling high overhead and I thought I might have walked onto the set for a horror film. Very odd. The landscape was so desolate and wind-blown, and of course the main ingredient on the ground was shingle. 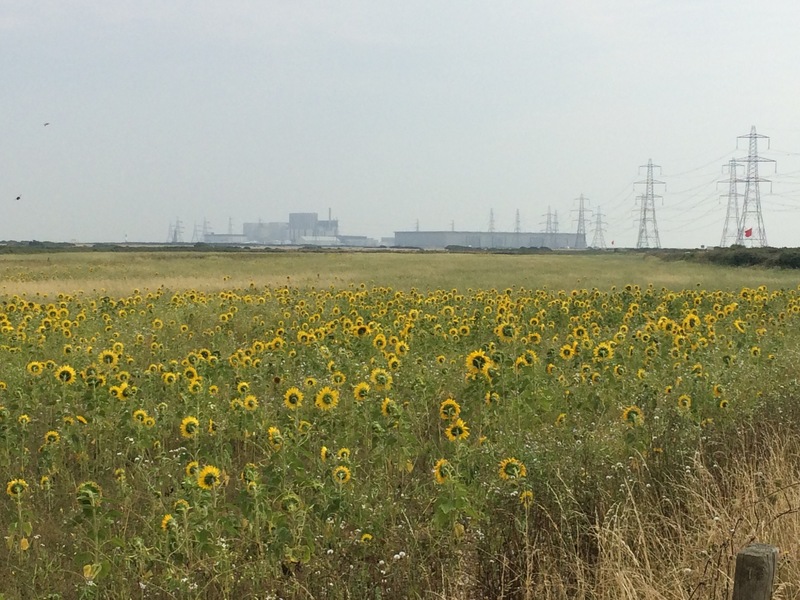 I knew I was walking towards a power station because the weather had turned grey and overcast. 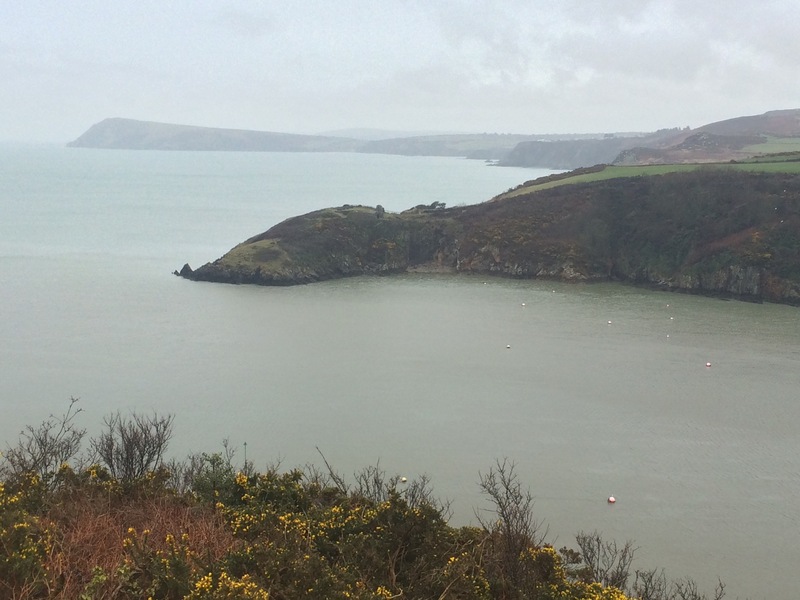 This surreal landscape was enhanced by a grey sky, a grey landscape and a grey sea. I had ventured into another world. 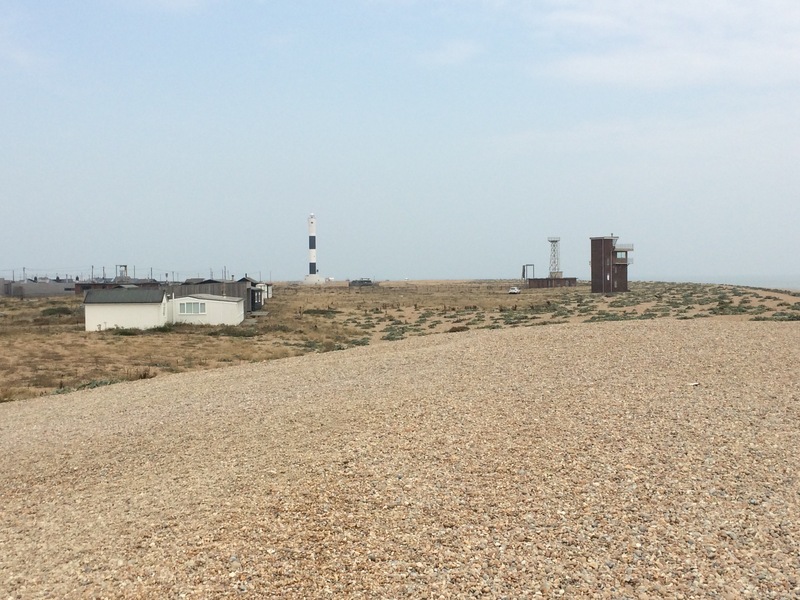 arriving at Dungeness…it’s another world! 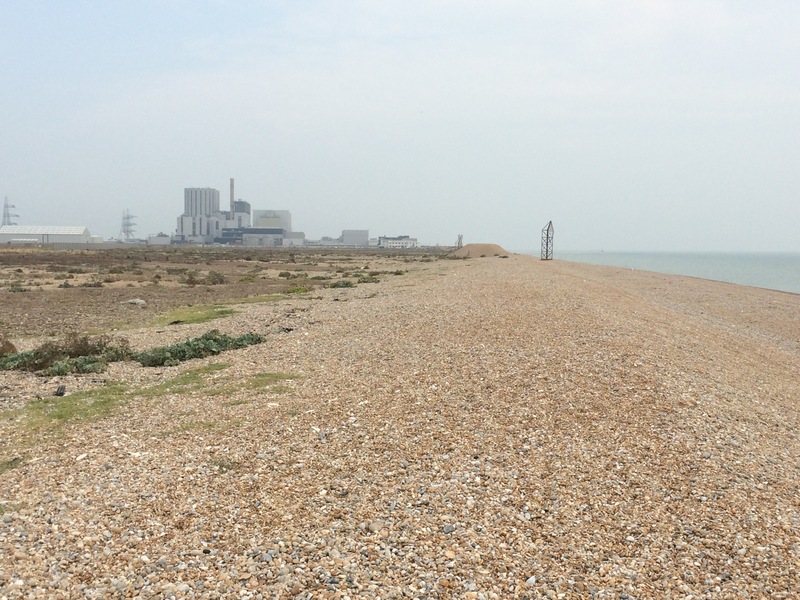 I had to endure some walking across the shingle to reach the power station and then the settlement of Dungeness. Weirdly, on the beach in the middle of nowhere, I passed several groups of people. 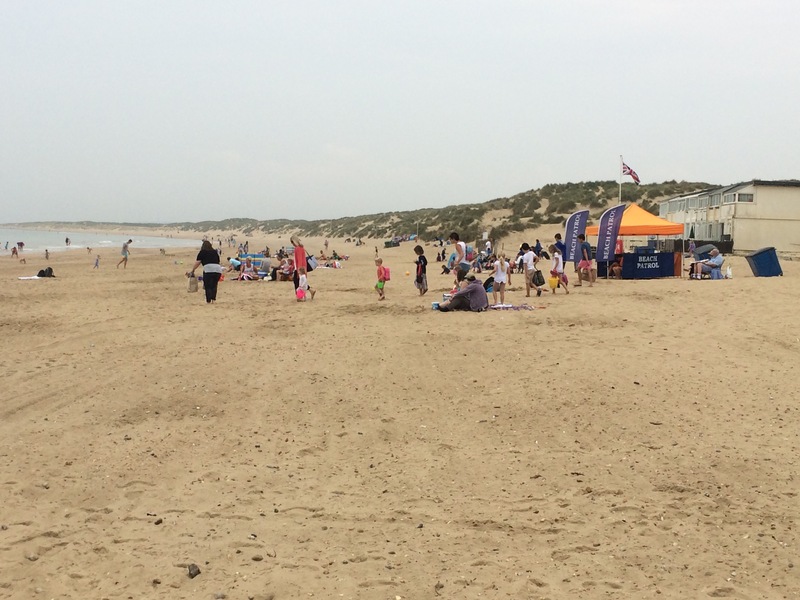 There were the usual fishermen casting their lines from the beach and then there were several Asian families enjoying a day out. No one even looked at me so there was no opportunity to engage in conversation. Perhaps if they had I might have seen their red, alien eyes and been immediately extinguished (or maybe that just happens in the movies). 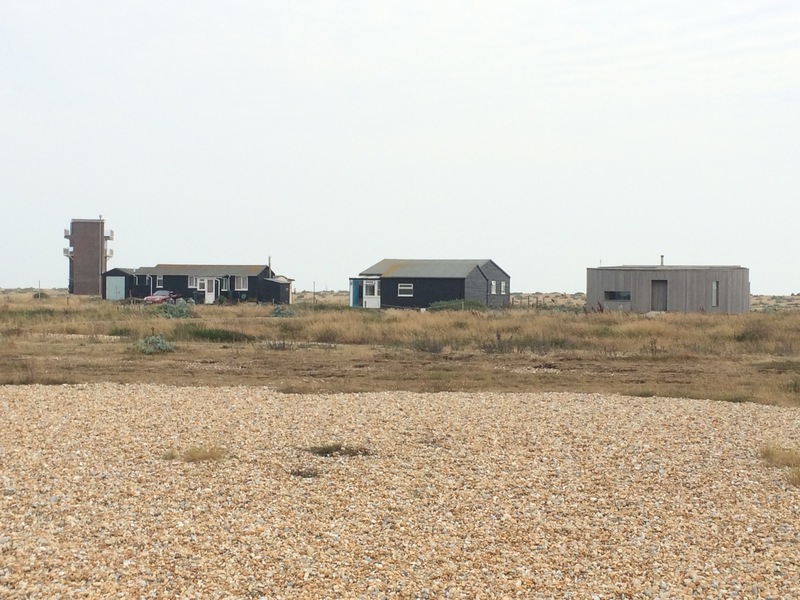 I arrived at Dungeness, a strung-out town built on the shingle at the point of land where the West Road meets the East Road (these are the names given to the stretches of sea, they are not land-based roads). It was a place with an other-worldly feel to it so I felt compelled to stop at the Britannia Inn for fish and chips. 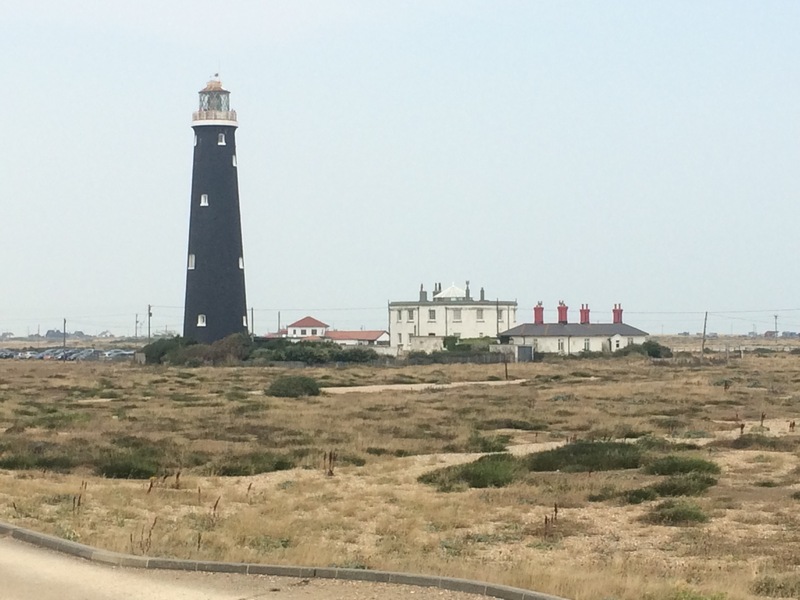 Dungeness is a popular tourist destination and I had just missed a coach load of tourists. I could have paid to climb up the lighthouse; however, it didn’t seem worth it when everything around was grey and indistinguishable today. 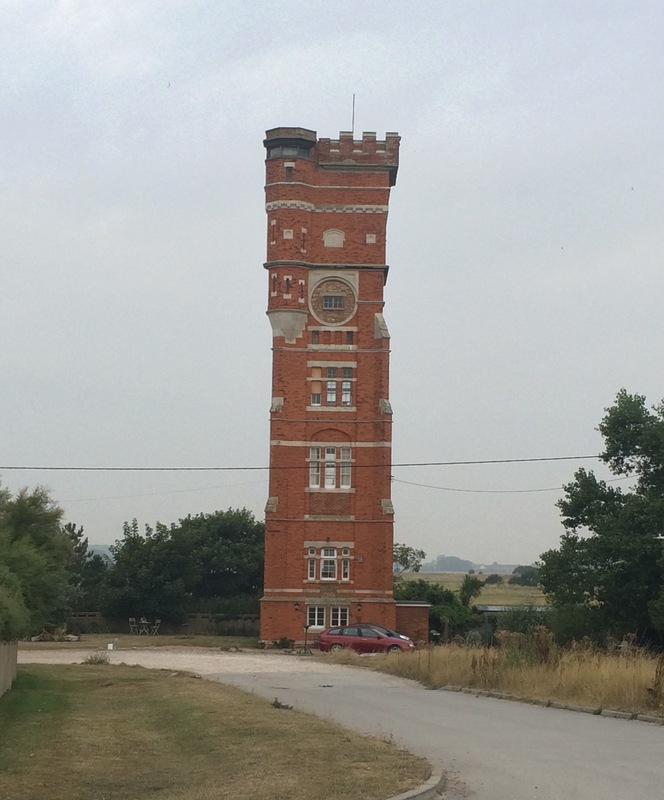 …was this one Queen Victoria’s personal railway carriage? 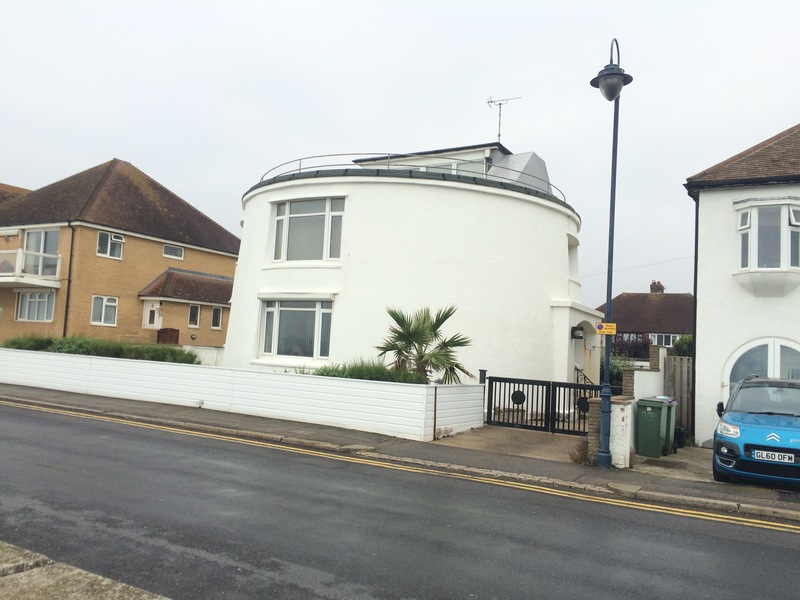 Some of the houses had been given “Grand Designs” makeovers and looked quite futuristic. It seemed like such a strange and fascinating place to me. 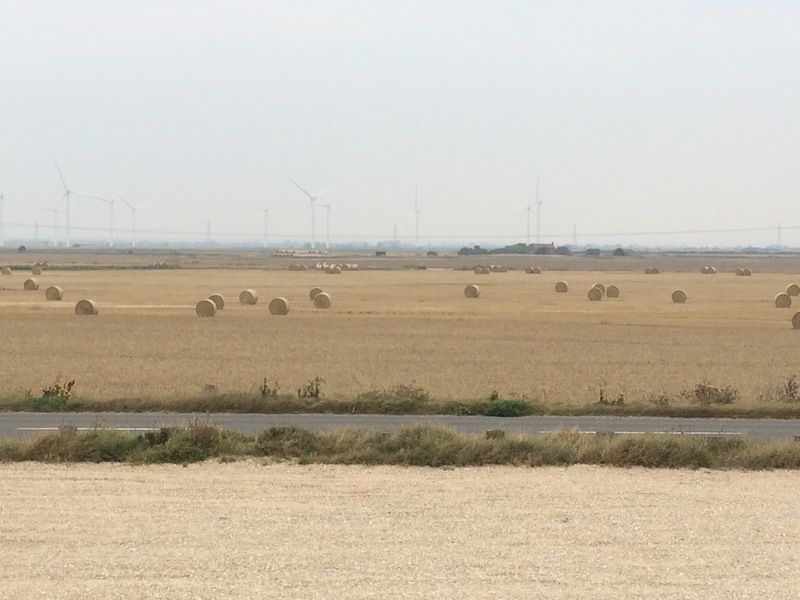 I turned North and walked along the road to Littlestone-on-Sea, the seaward extension of New Romney. 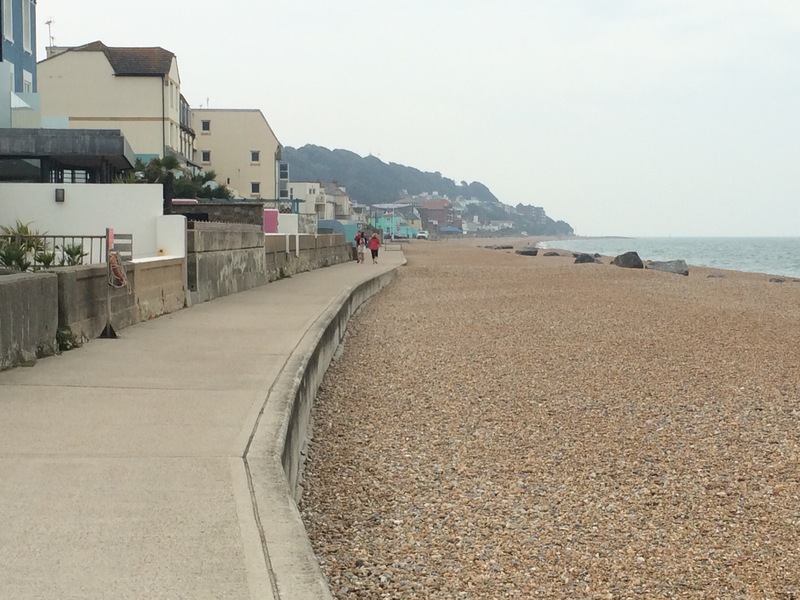 I walked along the road because the other option was to continue across the ever-widening shingle beach. 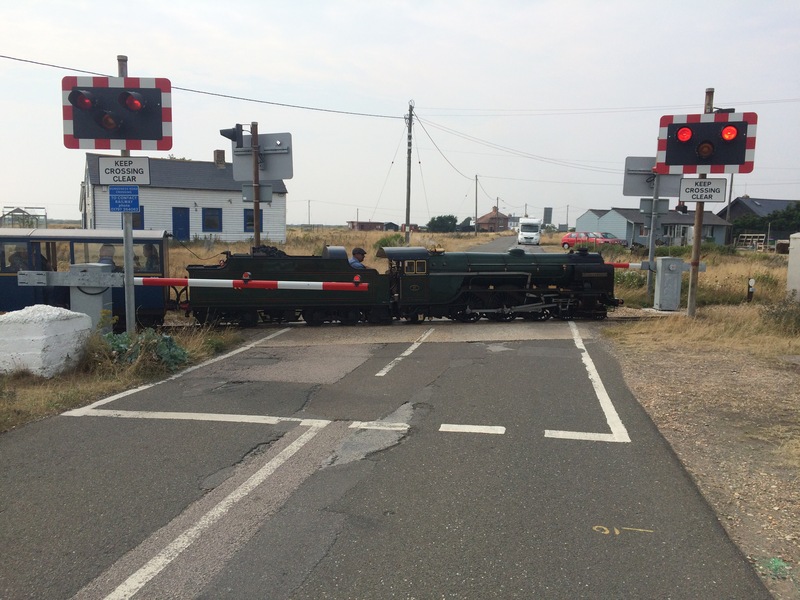 I suppose I could have caught the miniature steam train that travels from Dungeness to Hythe along the small-gauge railway line behind the houses that line the road. Such an odd place. 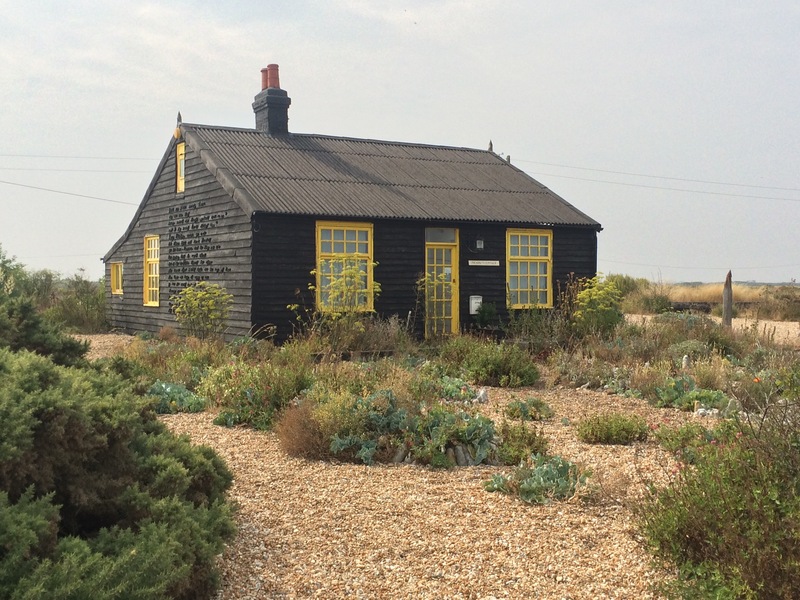 Behind the houses and the railway line was the Dungeness National Nature Reserve, one of the largest areas of vegetated shingle in Europe. This included old gravel pits, which were the habitat for bloodsucking medicinal leeches. I didn’t stop for a swim! 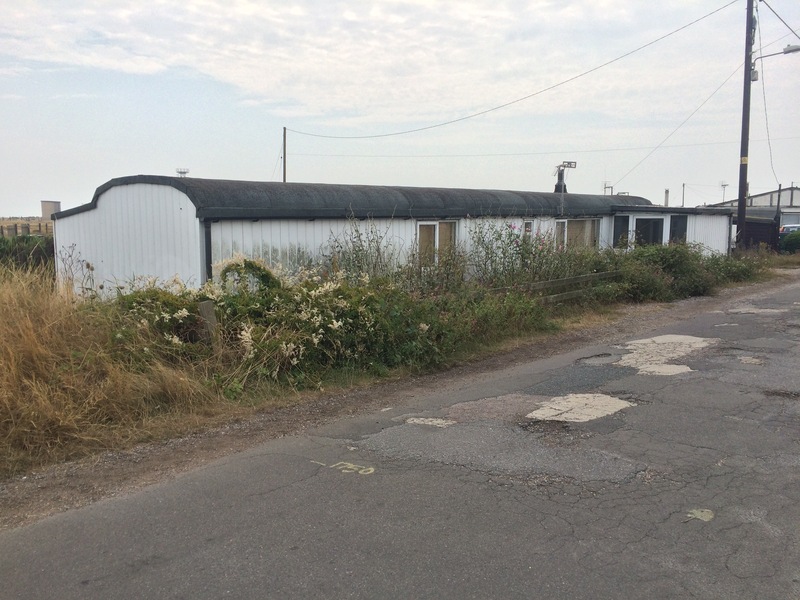 The New Romney Caravan Park was at the other end of the scale to the abominable place at Camber Sands. This one was run by an ex-Army man and he kept a small bit of grass for hikers, cyclists and the like who needed somewhere to pitch for the night. He charged me £7 and I was able to use the laundry and get a meal in the on-site bar. Perfect. 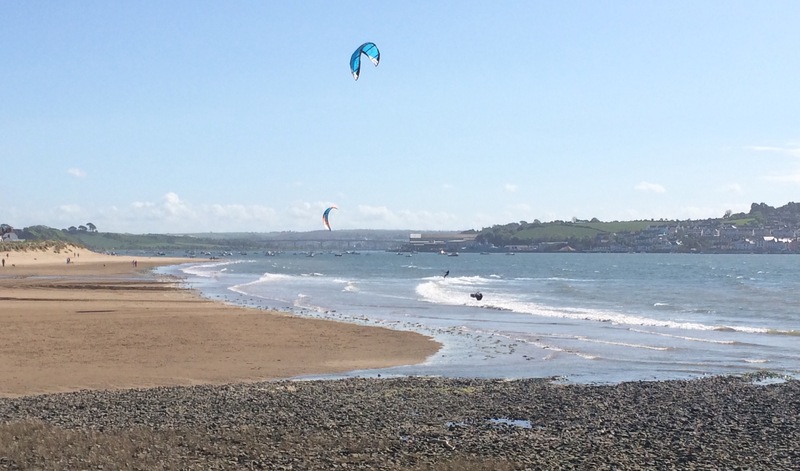 Today’s walk was going to take me up the River Taw to Barnstaple and back down the other side. 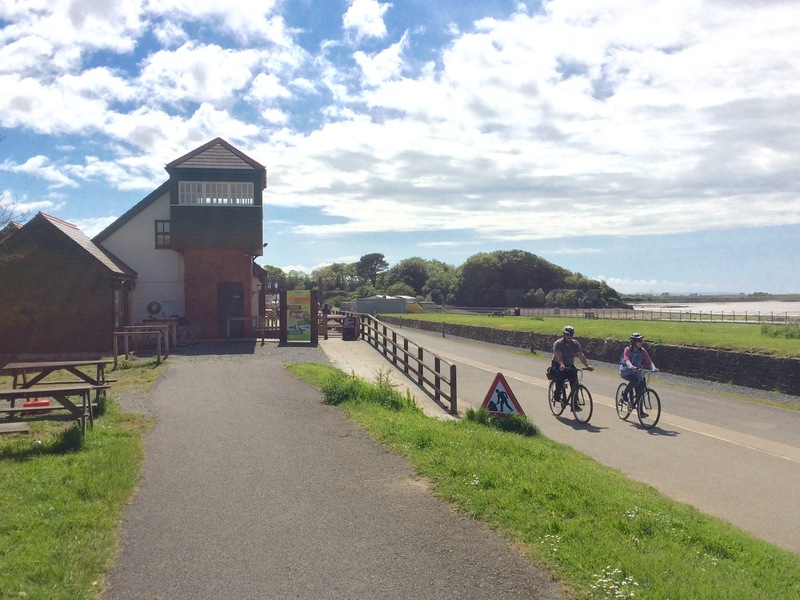 Most of the walking would be along the Tarka Trail, a Tarmac cycle path following the disused railway line. 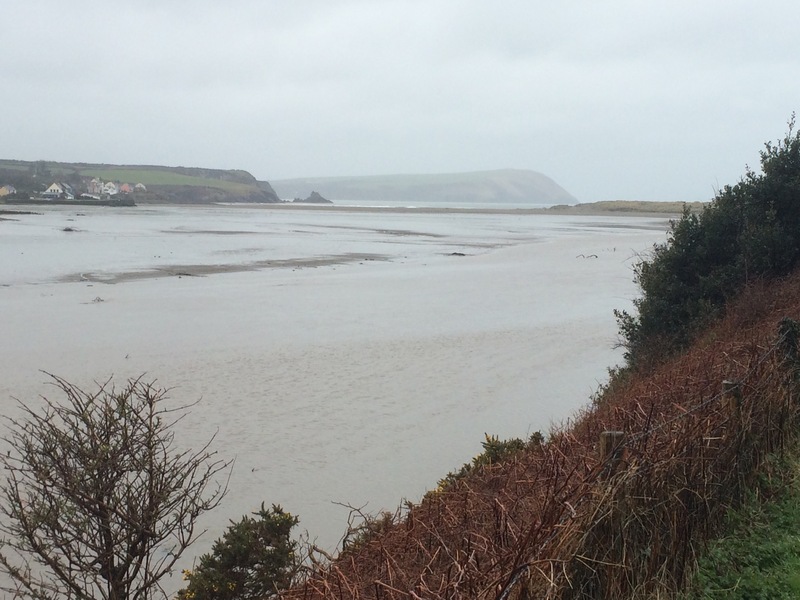 In order to get the most out of the day (and because it was raining when I left) I decided to get the bus along the North side of the River; that way I could fit in walking from Croyde to Braunton and also reach a campsite. 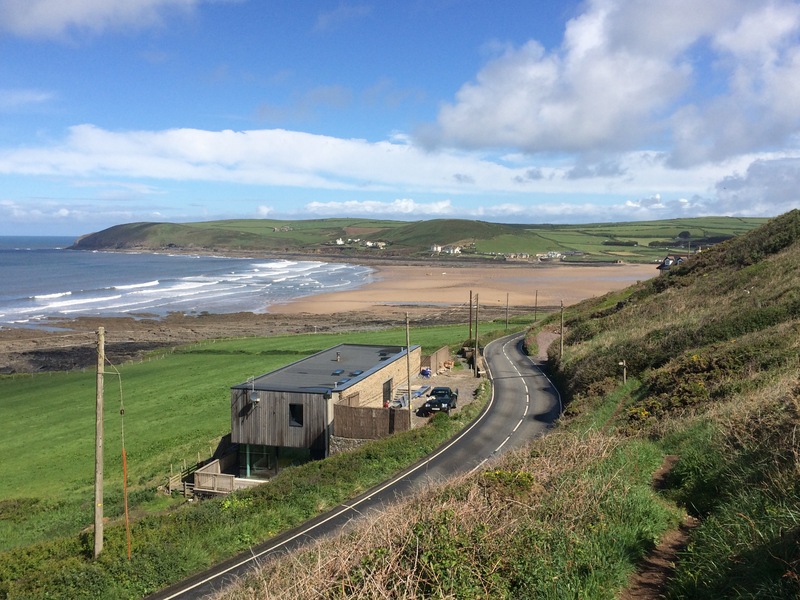 It took 2 buses to get to Croyde, into- and out of- Braunton. I started where I had left off on Sunday, on Croyde Beach. The rain had stopped and the sun was coming out. 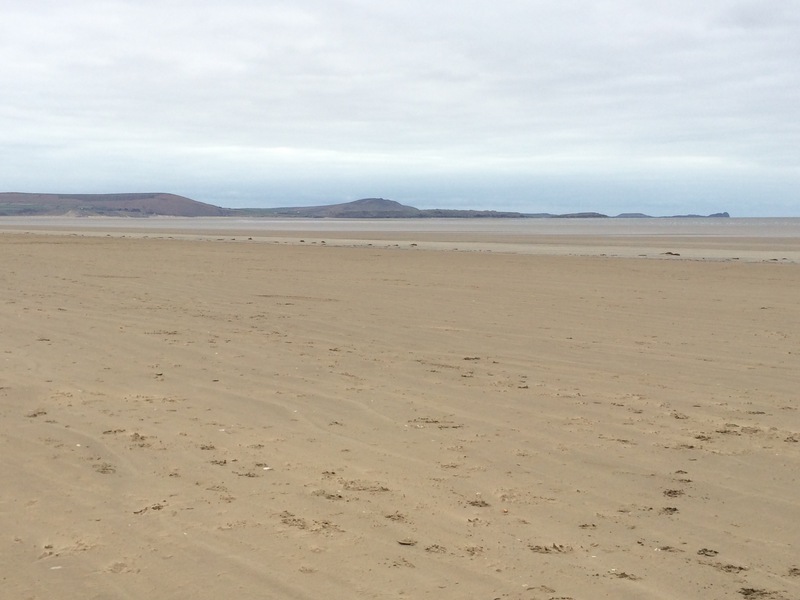 I walked around the small headland and came face to face with the big expanse of Saunton Sands, backed by Braunton Burrows. 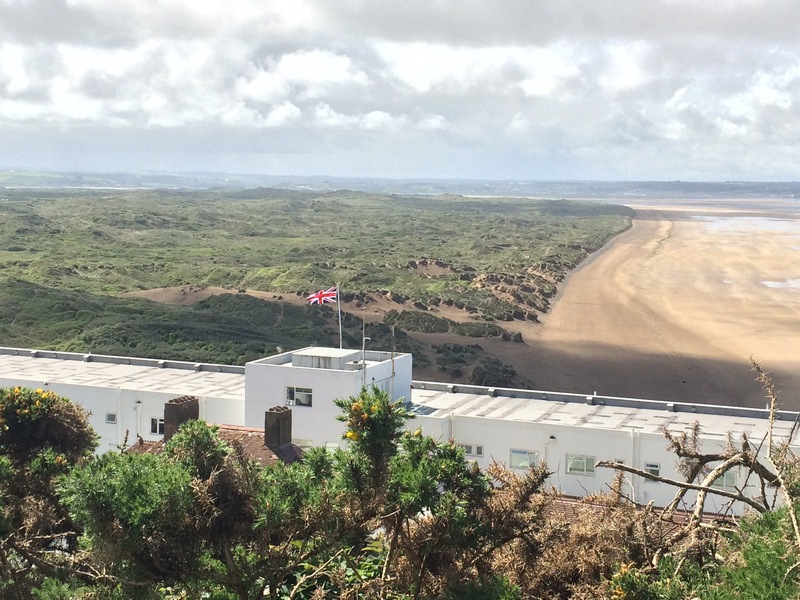 From the cliff, above the Saunton Sands Hotel, I could see down to the mouth of the River Taw estuary and just how enormous Braunton Burrows is; 1300 hectares of sand dunes at the heart of the North Devon biosphere reserve. 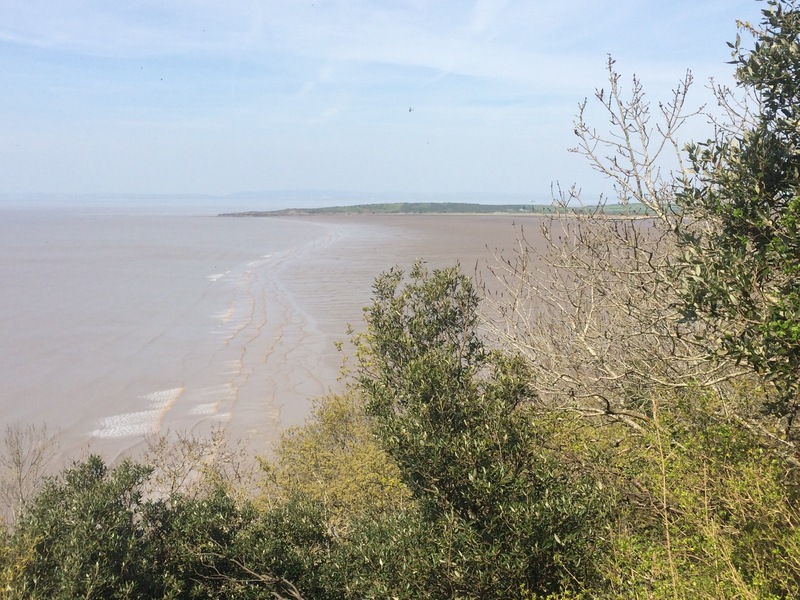 Naturally the burrows are a SSSI and are home to more plant species than any other parish in England. 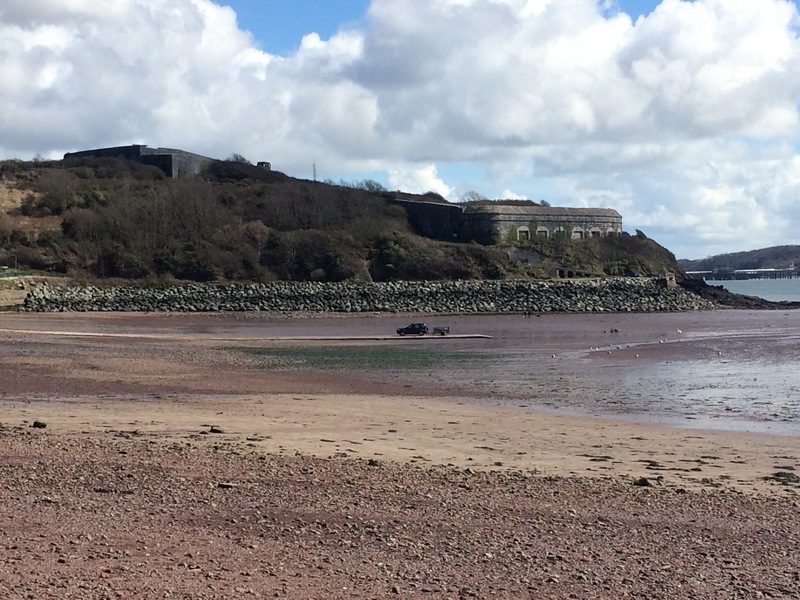 They are also a playground for the Royal Marines who are based next door at RMB Chivenor (another ex-RAF base I never got to!). There were a few surfers in the sea and the waves were pretty big but I dropped down from the cliff into the burrows. 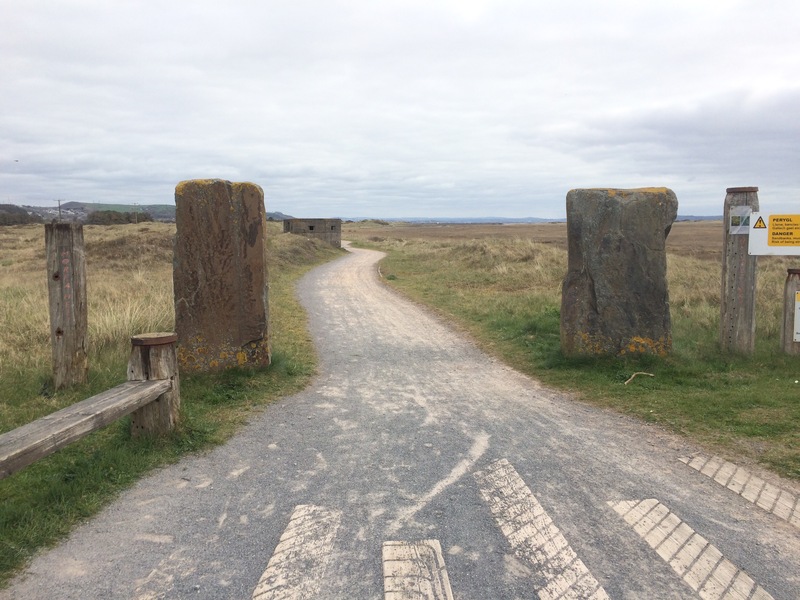 I didn’t walk right to Crow Point at the end because I had too far to walk today, but instead walked halfway along American Road, an old track at the back of the burrows that was once used by the American military. 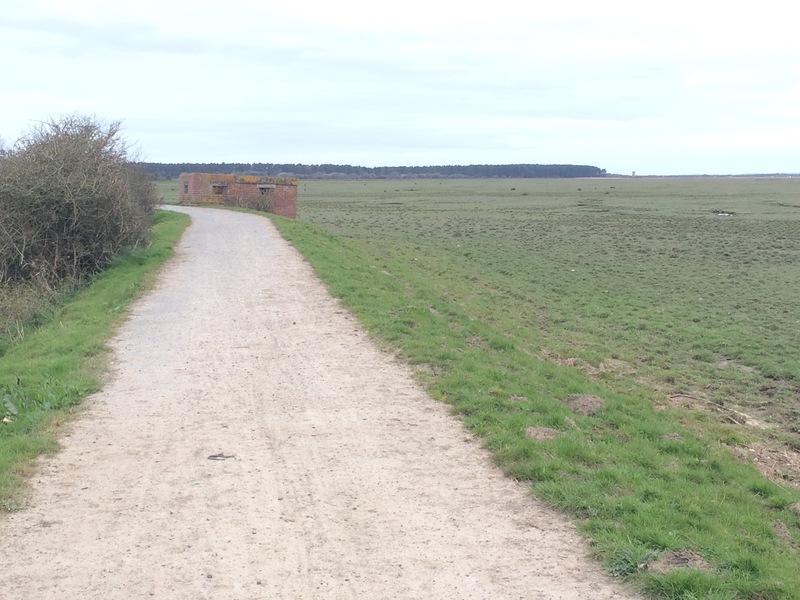 In 1942, this section of coastline became an Assault Training Centre to prepare 10,000 US troops for the D-Day landings. 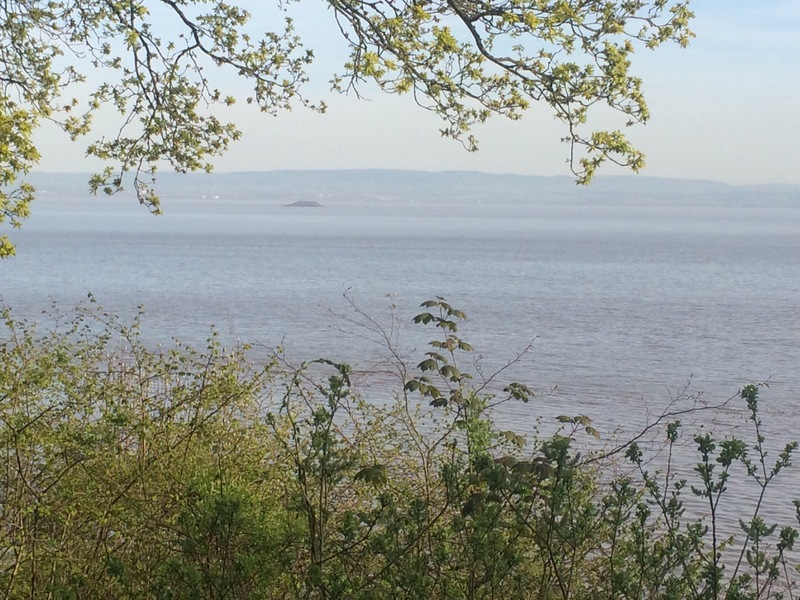 Today it was very peaceful in the unexpected sunshine and I only saw dog walkers. I cut back across Braunton Great Field into the town of Braunton and stopped at the small museum to check out the WW2 history. I could also have gone to the British Surfing Museum. I had time for a nice coffee while I waited for a bus to Barnstaple. 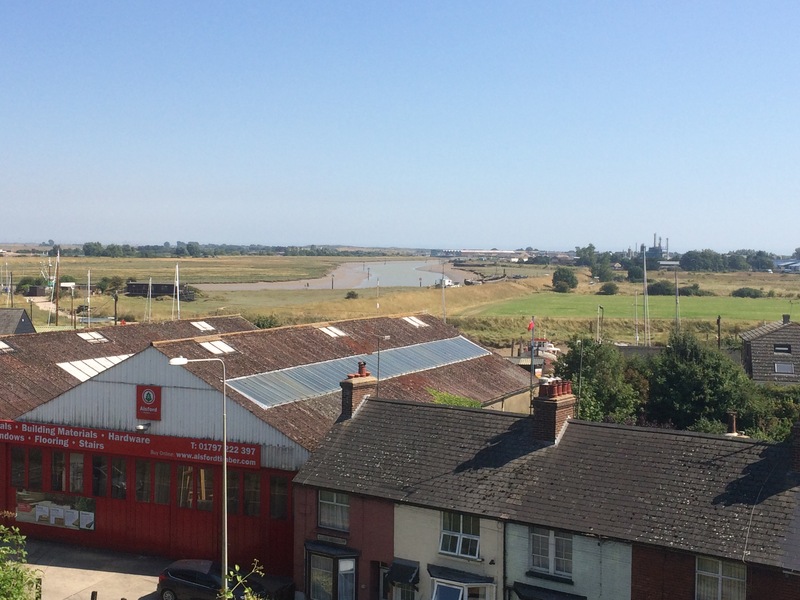 I was able to relax and enjoy a good view of the River Taw from the top deck. 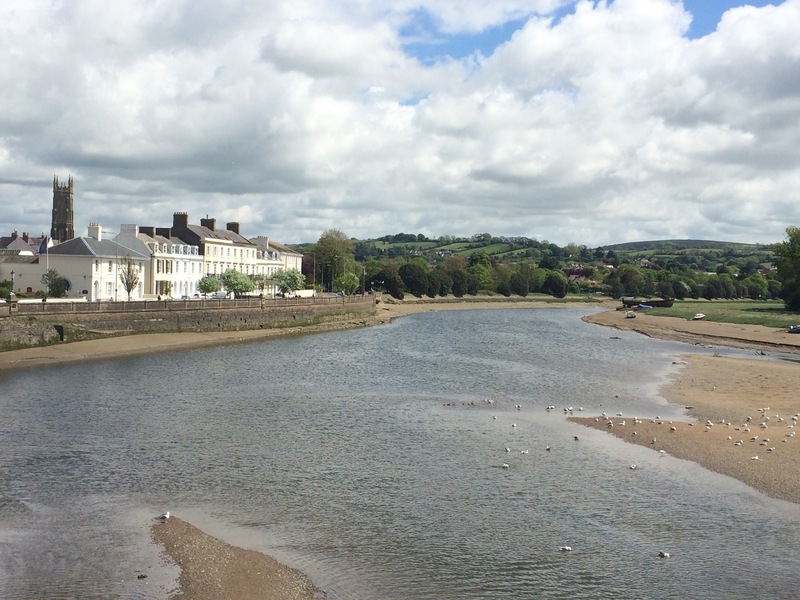 The bus station in Barnstaple is right by the Long Bridge over the River Taw, although, confusingly, there is now a much longer bridge for the road bypass. 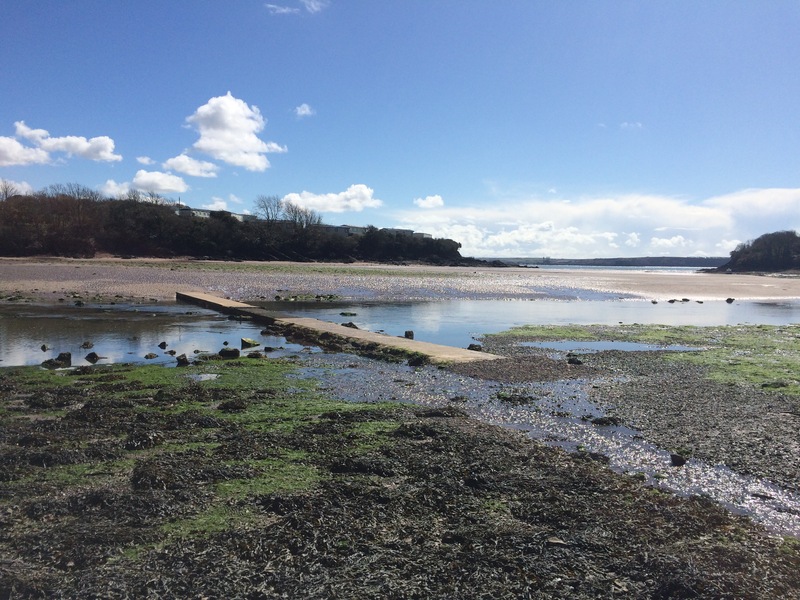 I followed the Tarka Trail along the South shore of the River Taw. 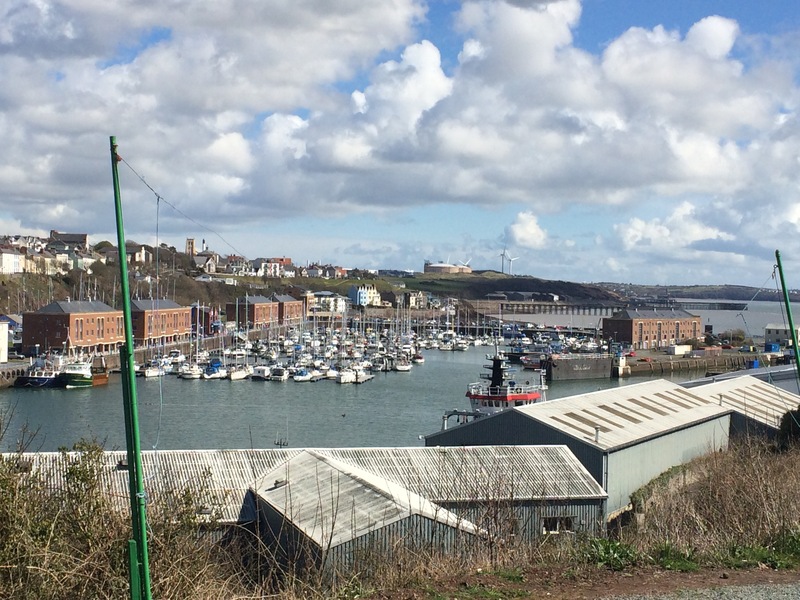 In the mid-1800s, Fremington Quay was the most important between Bristol and Land’s End. 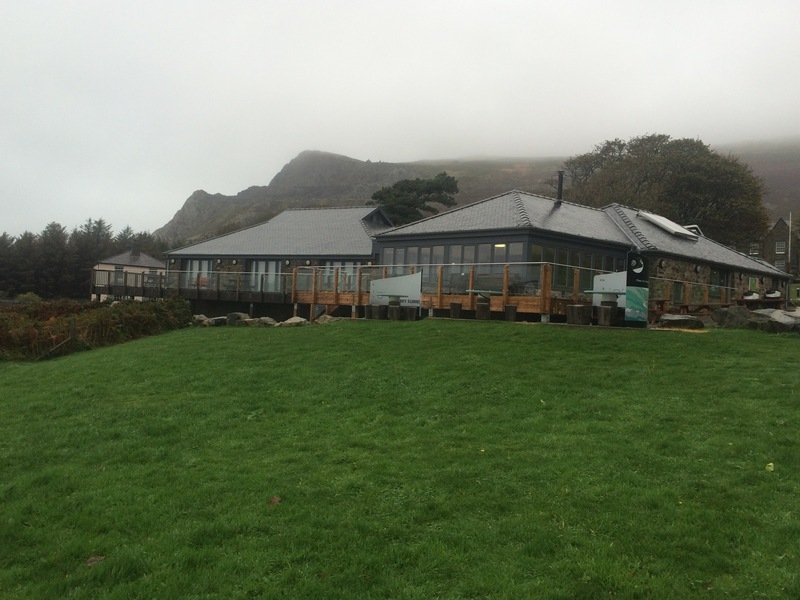 Now it just has a cafe with lovely homemade cakes. I realised I hadn’t been eating enough cream teas so here was the perfect opportunity. In the interests of science I tried one scone the Devon way (jam on cream) and one the Cornish way (cream on jam). I can safely say that both were equally delicious. 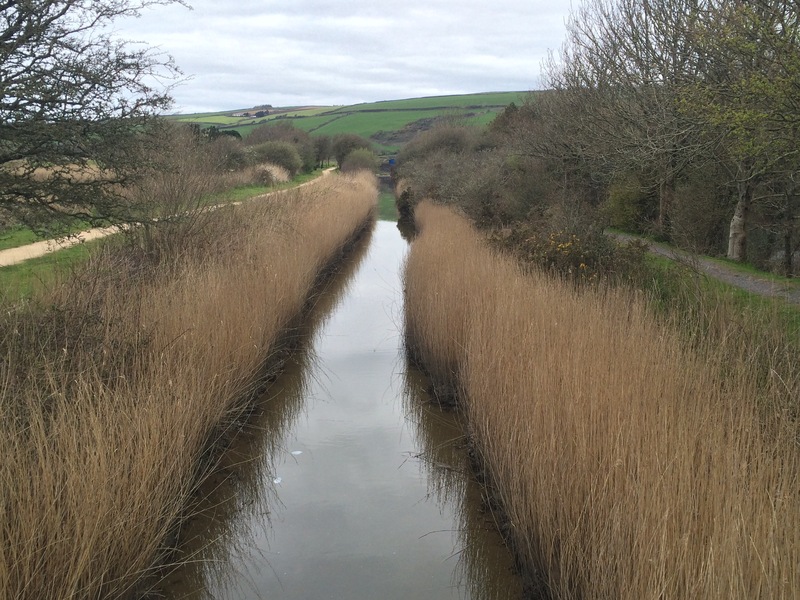 The Rivers Taw and Torridge meet at Appledore, opposite Braunton Burrows. 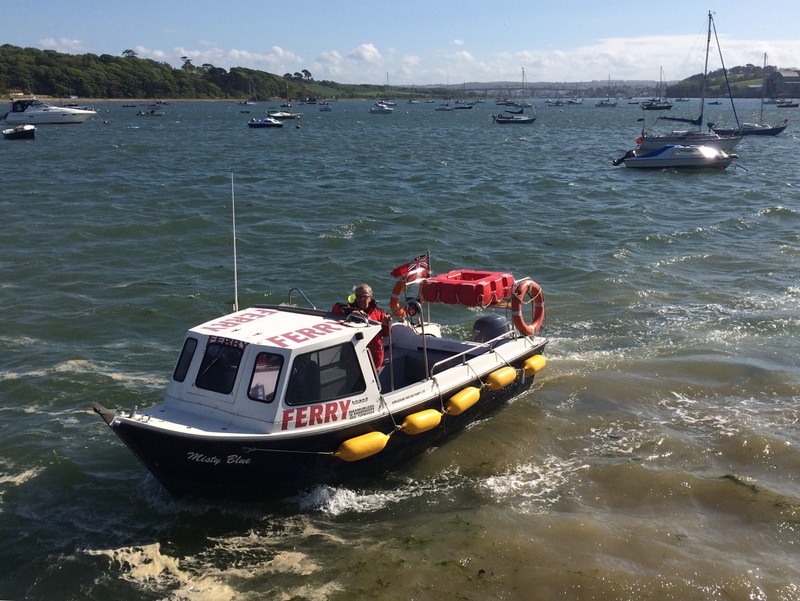 At Instow, for £1.50, I could catch a ferry across the Torridge (only around high tide). I had timed it perfectly. 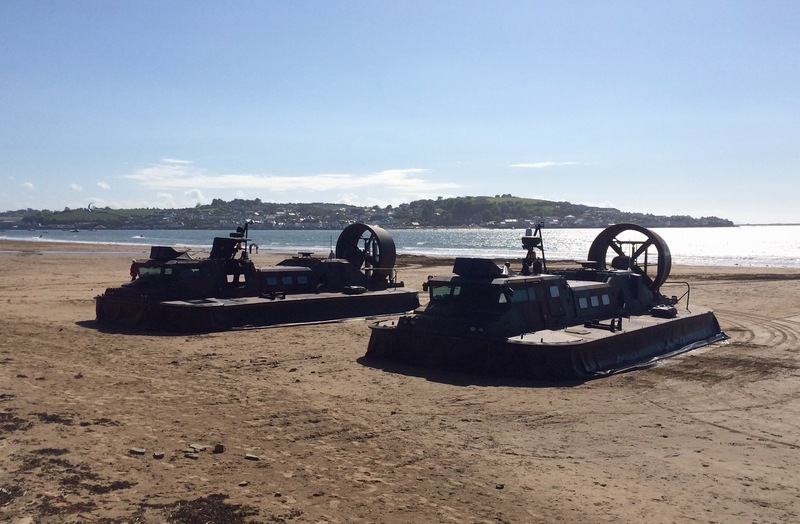 First though I had to walk past the 2 RM beach landing craft parked on Instow Sands. 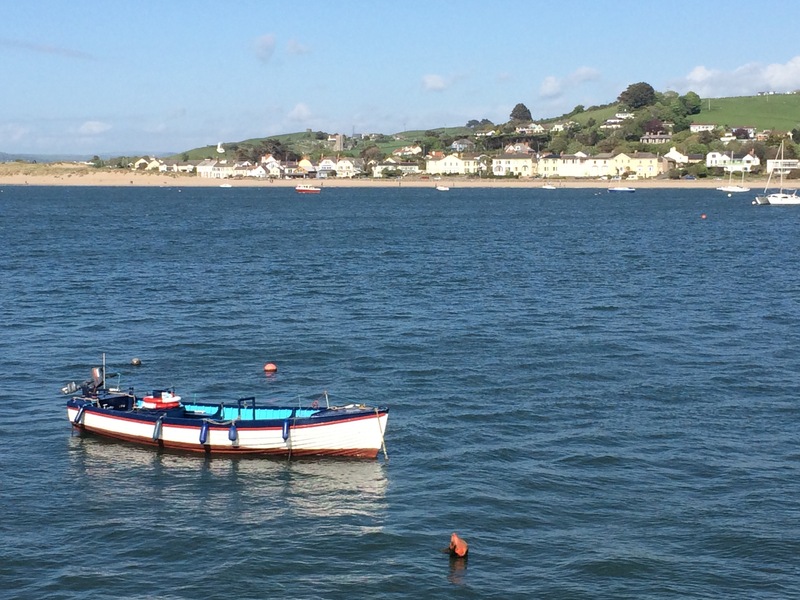 Instow and Appledore both seemed like Nice towns, prettily painted and well kept. 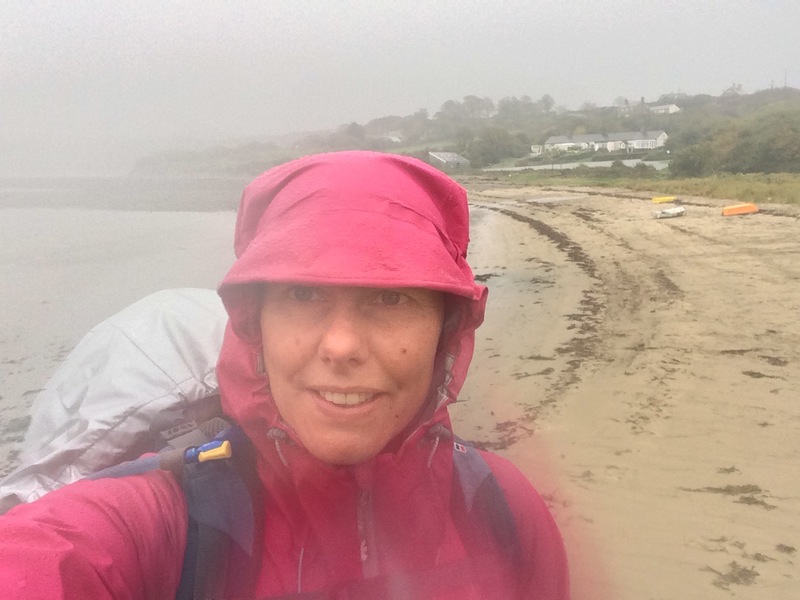 I had to walk up the hill out of Appledore to my campsite but, fortunately, I was able to use my bus ticket to get back into town for dinner at the pub. It was quiz and curry night at The Beaver. 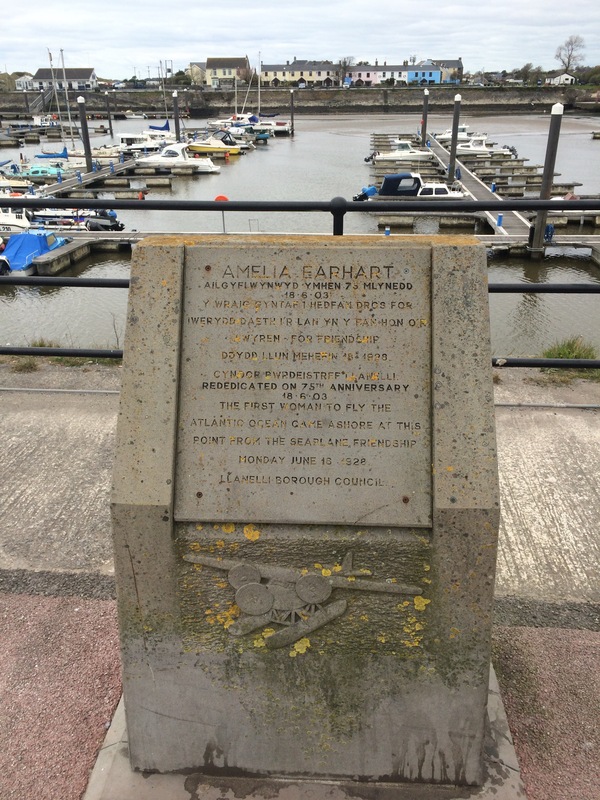 Appledore had some famous residents! I was up early and keen to leave. I had discovered there was a bus from the end of the road into Carmarthen, which would save me a road walk. I caught the bus. 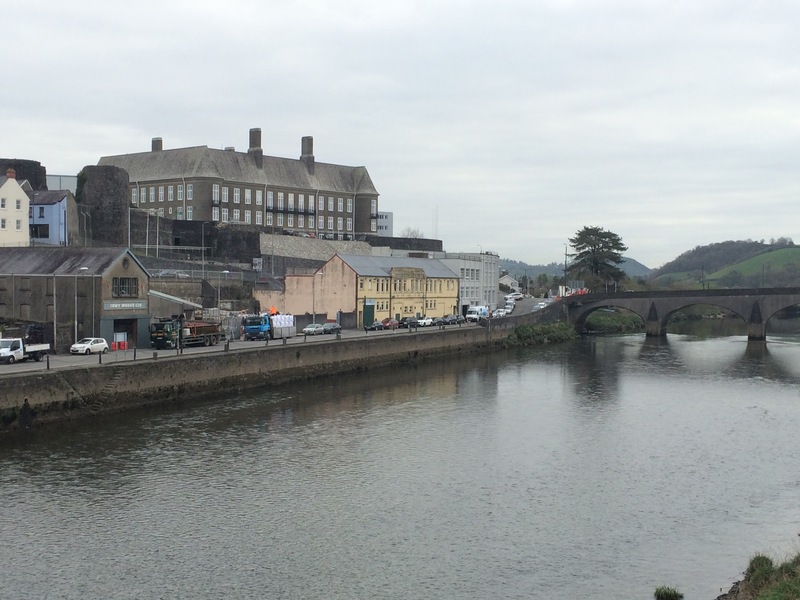 Driving into Carmarthen I was struck by the amazing sports facilities – a running track, rugby pitches, indoor rugby training facility and more. 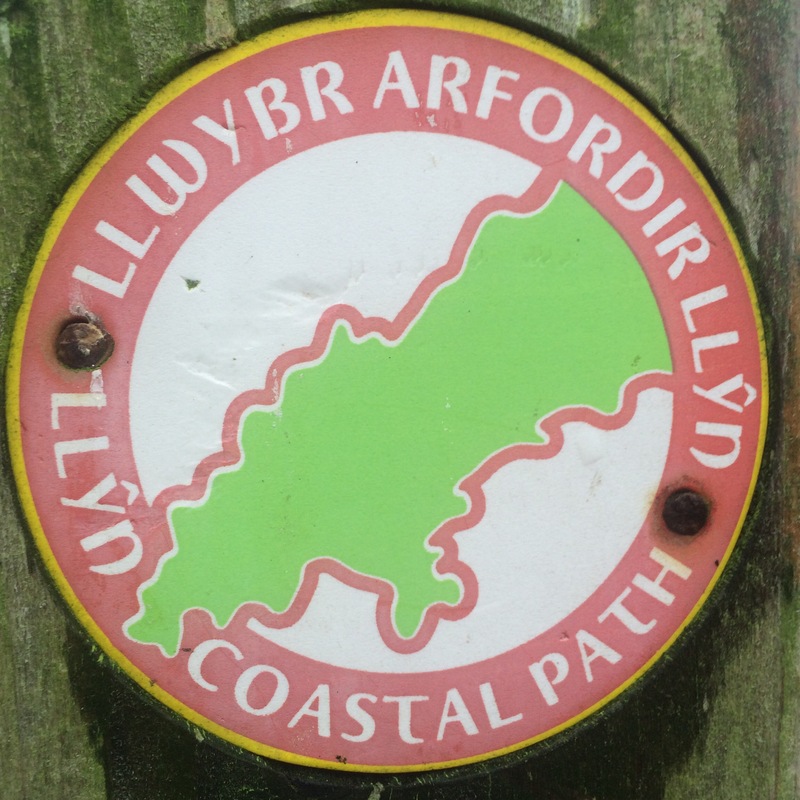 I had intended to catch a train from Carmarthen to Kidwelly as the train line runs next to the coast, whereas the path takes you inland (presumably to avoid the train). I had a long enough gap between bus and train to get a coffee and a bacon and egg sandwich for breakfast. 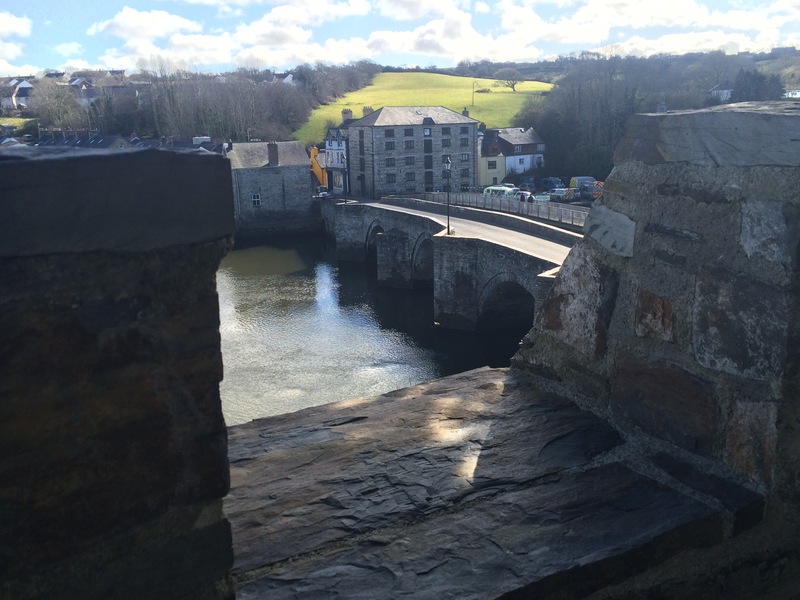 I contemplated hanging around in Carmarthen for a couple of hours and getting the next train (they come at 2 hour intervals) but the man in the cafe suggested there wasn’t much to see in Carmarthen, just the Roman amphitheatre, which apparently takes 3 seconds. 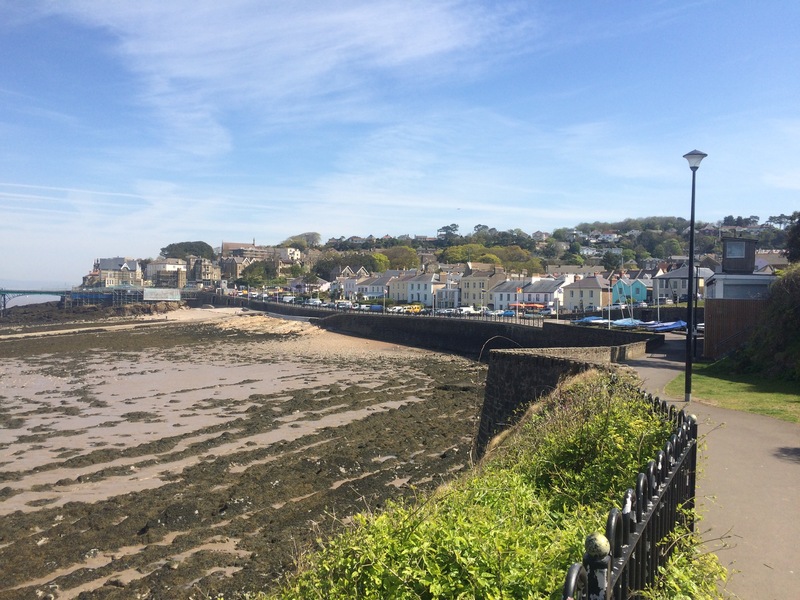 However, when I said I was heading for Llanelli he suggested I stay in Carmarthen. I caught the early train and watched the Afon Tywi go by out of the window. 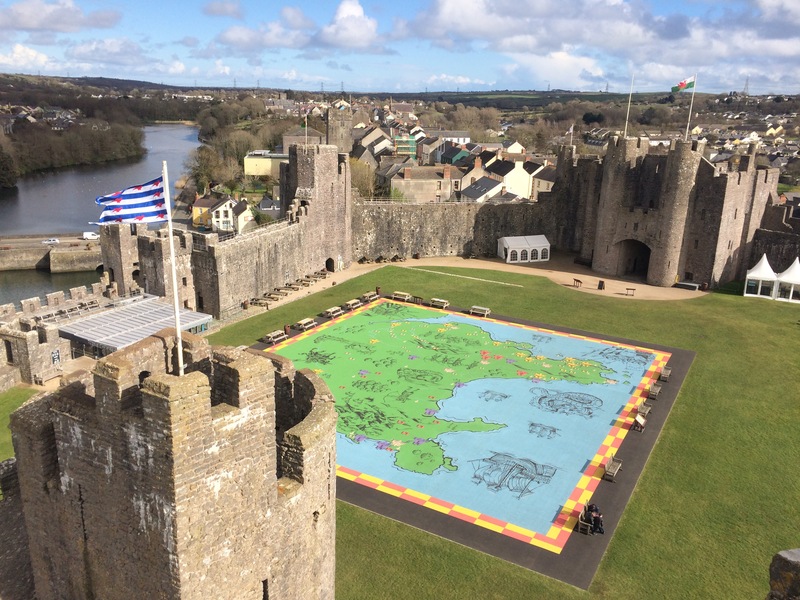 Kidwelly is a small town “dominated by its castle”. I couldn’t see the castle, I think it was hidden amongst the houses and, having seen enough castles recently, I didn’t bother to hunt for it. My walk began by following the 3-mile long Kymer’s Canal. 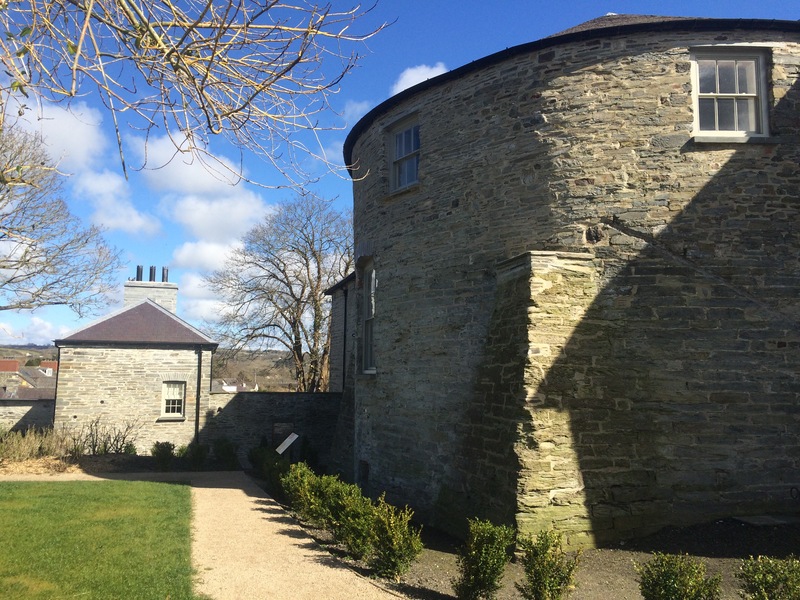 It was built in 1768 to connect Kidwelly Quay with the collieries in the Gwendraeth Fawr valley and was Wales’ earliest industrial canal. It looks very small now. 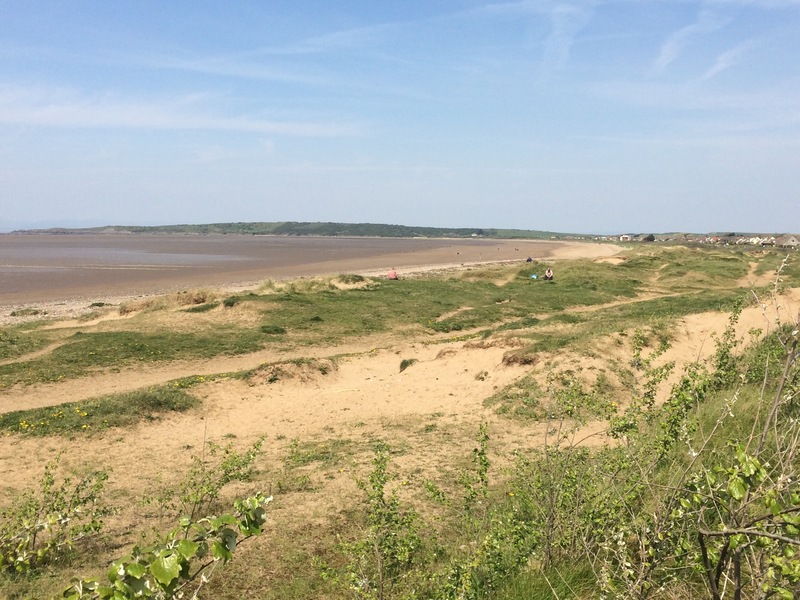 I walked passed Pembrey airfield, through Pembrey Forest and popped out on Cefn Sidan Sands; 8 miles of golden sand and fantastic views of Carmarthen Bay and the Gower peninsula. 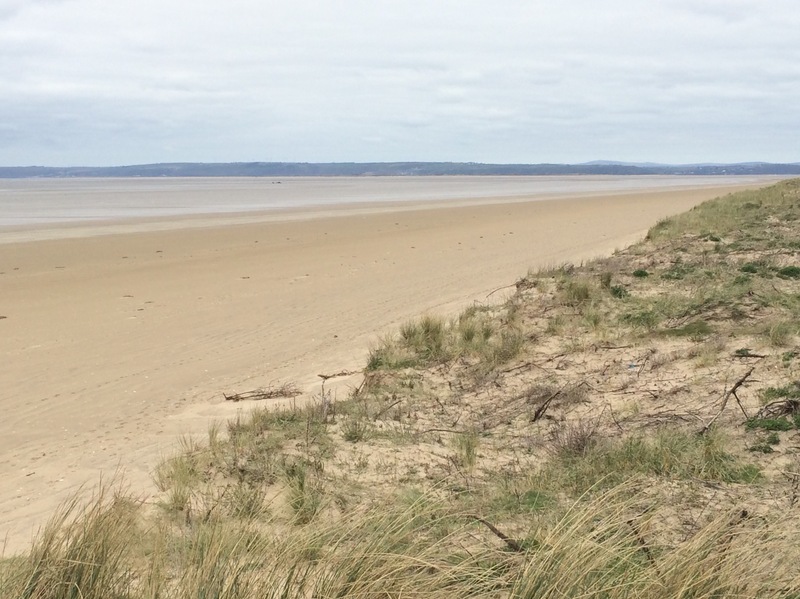 At the end of the beach is Pembrey Country Park, on the site of the former Pembrey Royal Ordnance Factory (which apparently suffered the first bombing raid of “The Blitz”). 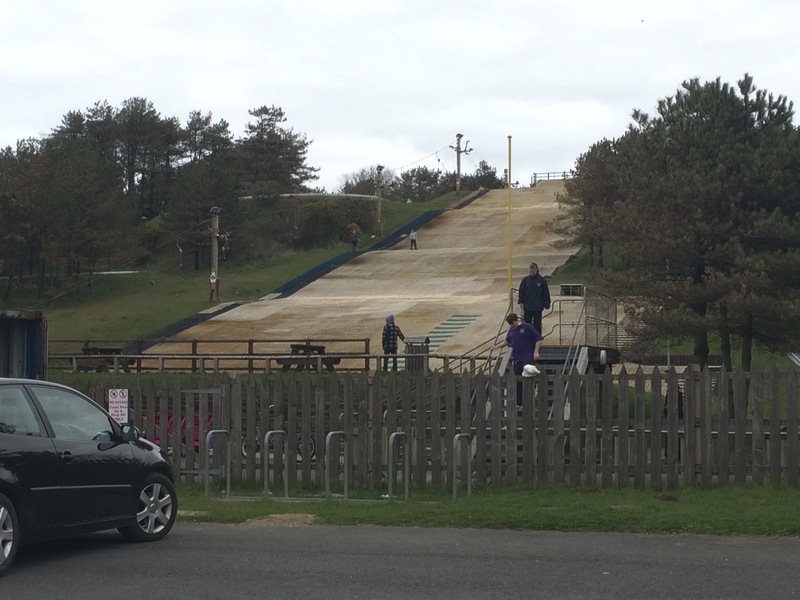 It provides lots of leisure activities, from Segway to skiing! 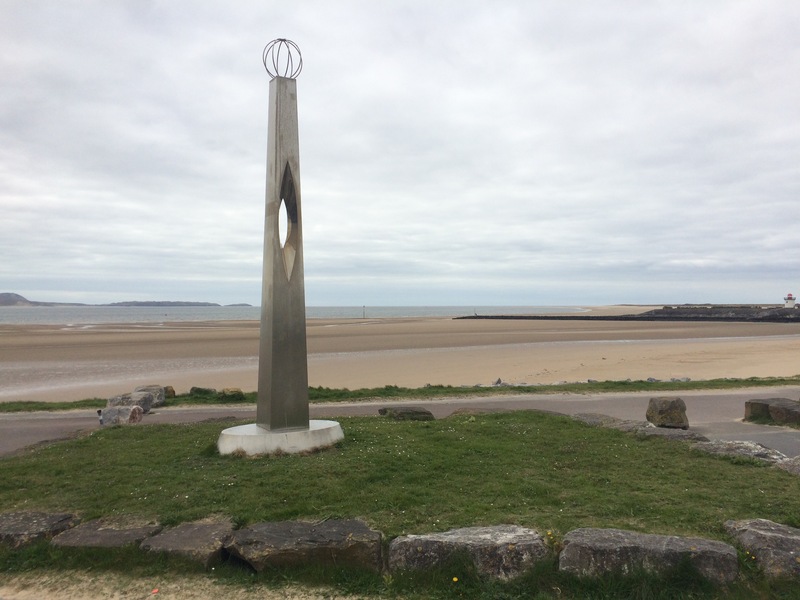 The next 21 km, from Pembrey to the Loughor Bridge, would be through the Millenium Coastal Park. 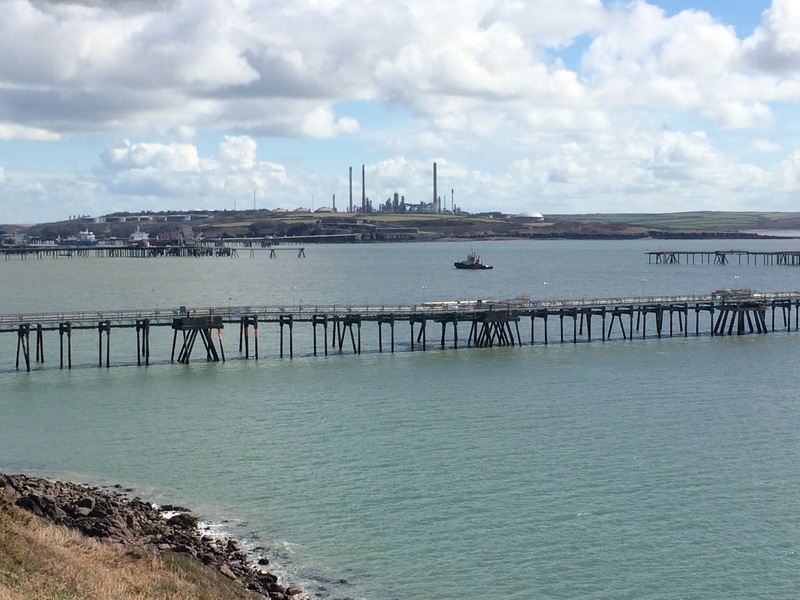 This park seems to have been created to fill the gap left behind by all the heavy industry that used to be on the North bank of the Loughor Estuary. 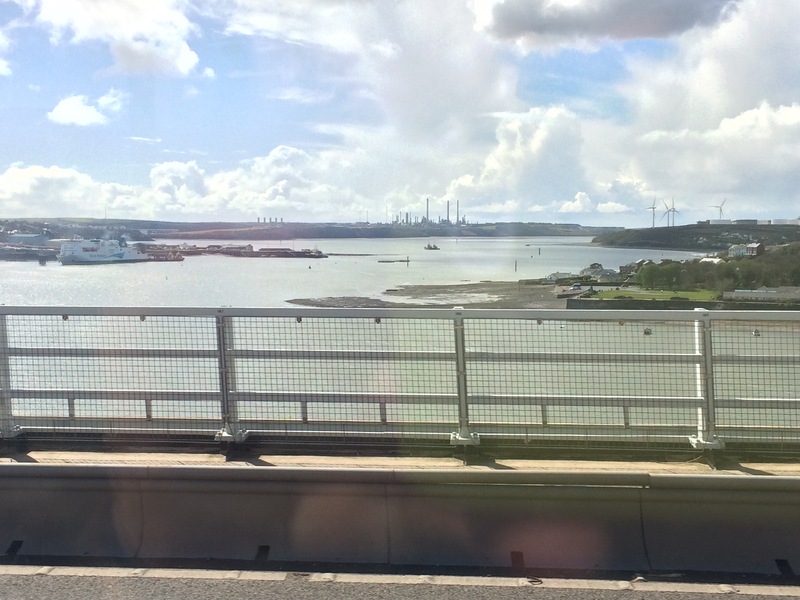 I made my way past Burry Port (built to take over the coal export duties from Kidwelly and Pembrey in the 1830s) and into Llanelli. 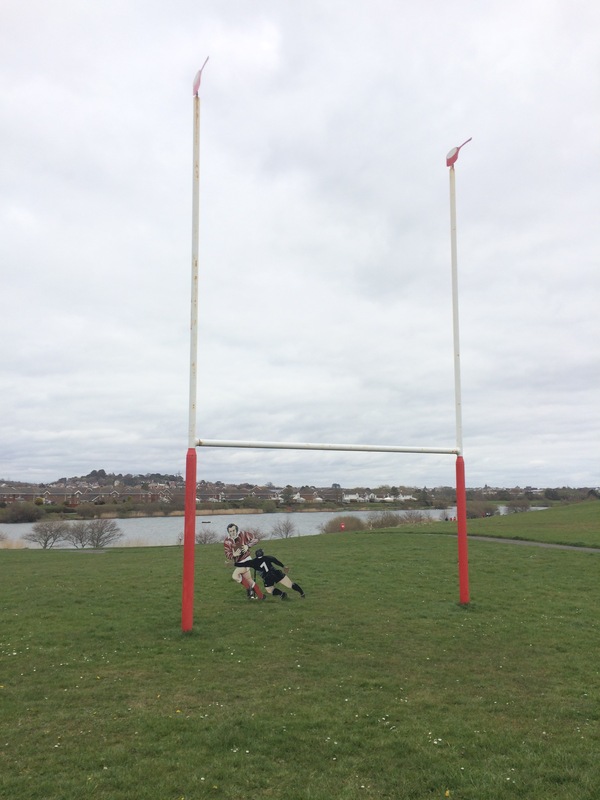 I stopped to admire the rugby posts, complete with model of Phil Bennett evading an All Black, that have been sited to commemorate the Scarlet’s old ground, Stradey Park (now a housing estate). An old man started talking to me about it and was impressed I knew of Phil Bennett. 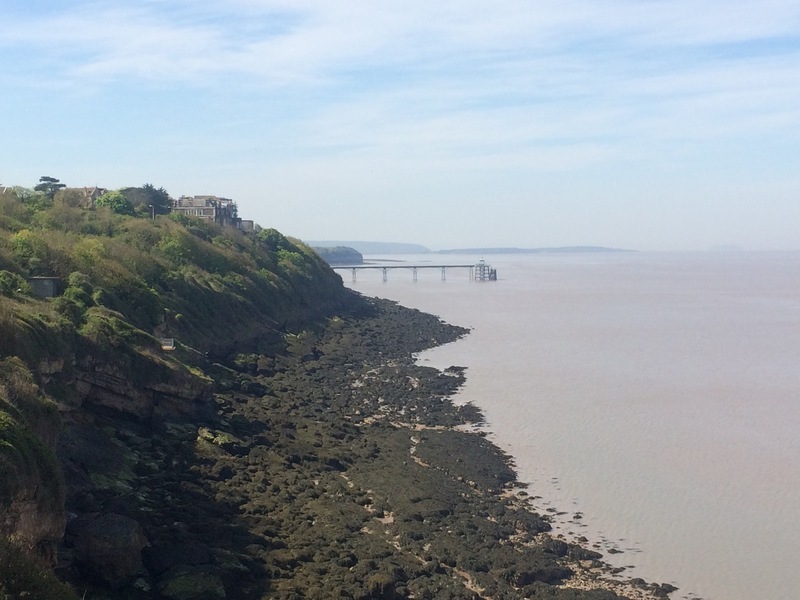 He loved Llanelli a lot more than the man in the cafe this morning; he told me he has a caravan at Wiseman’s Bridge but after a few nights there he has to come home because he misses it. 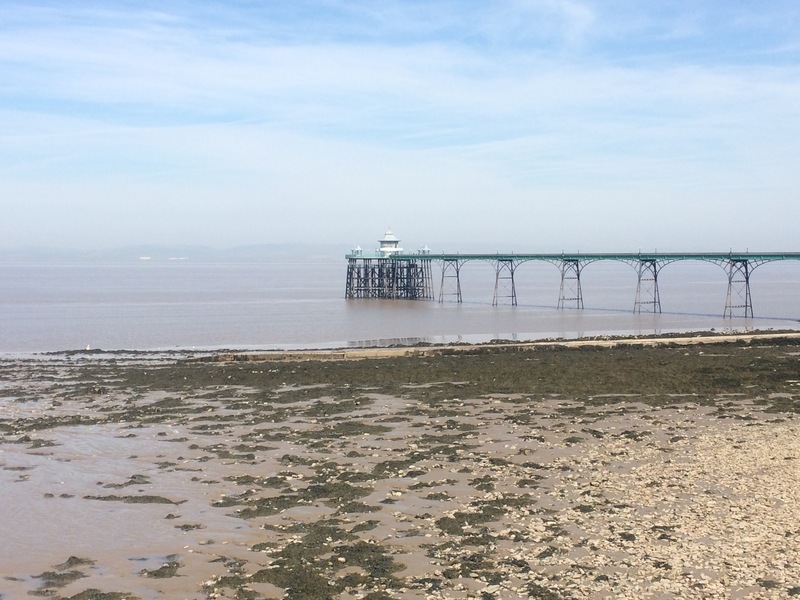 Ironically, the old man had initially stopped me to ask why I wasn’t cold (wearing only shorts and a t-shirt) and, after 20 minutes talking to him as the wind picked up, I was now freezing. 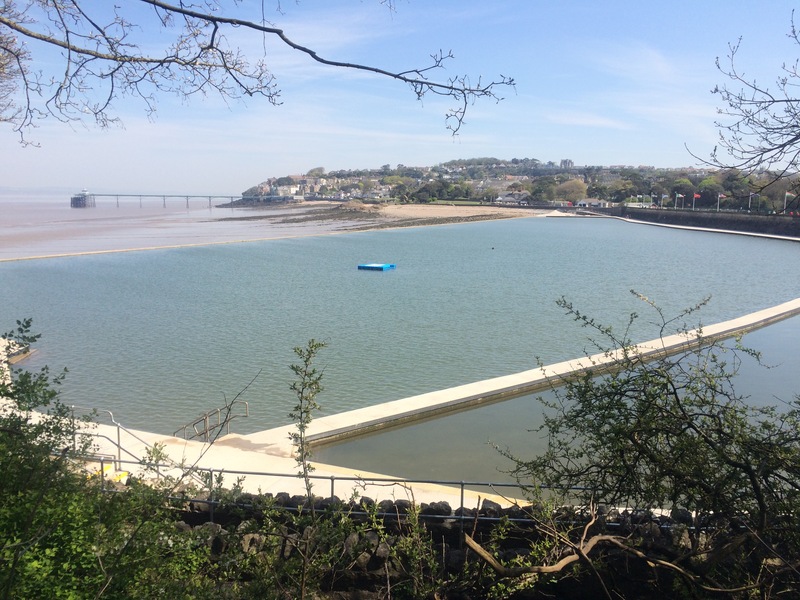 I only had a mile to go, past the Water Park (on the site of the old Llanelly Steel Works) and into town. 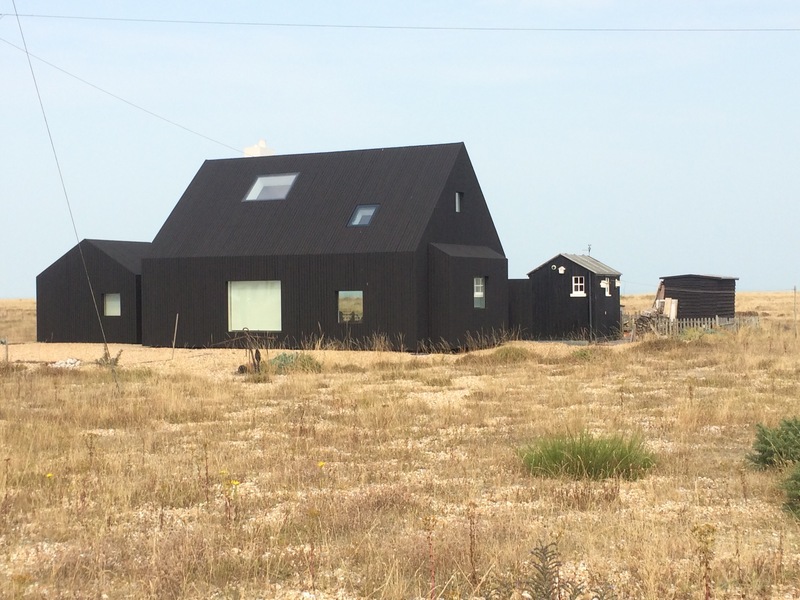 How pleasant to be staying somewhere clean. I didn’t go out for the evening as I was able to get a homemade curry at the guest house. 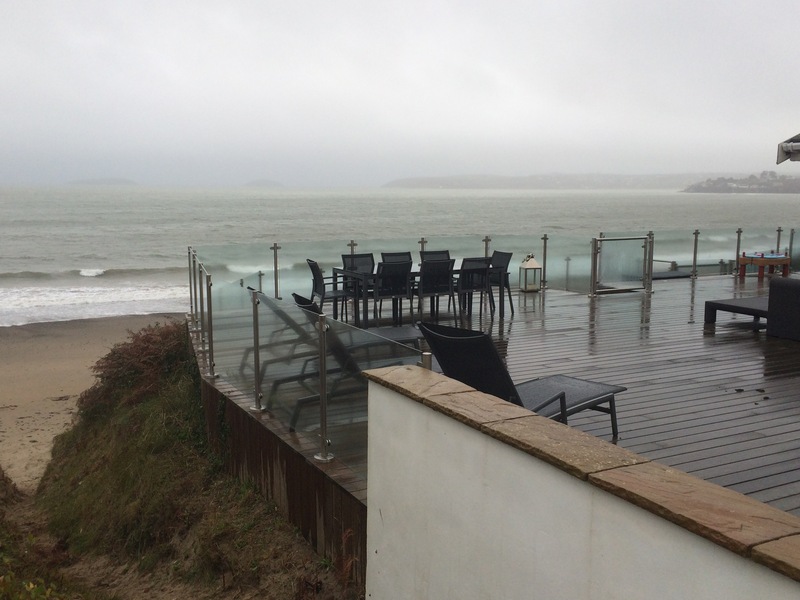 The heavy rain that started yesterday afternoon carried on all through the night and was still going as I ate my Welsh breakfast and delayed departing. Always nice to see the upbeat tv weather forecaster proclaiming a warm, sunny day across everywhere except SW Wales and NW England. Oh well, out into the rain I went fully suited up. 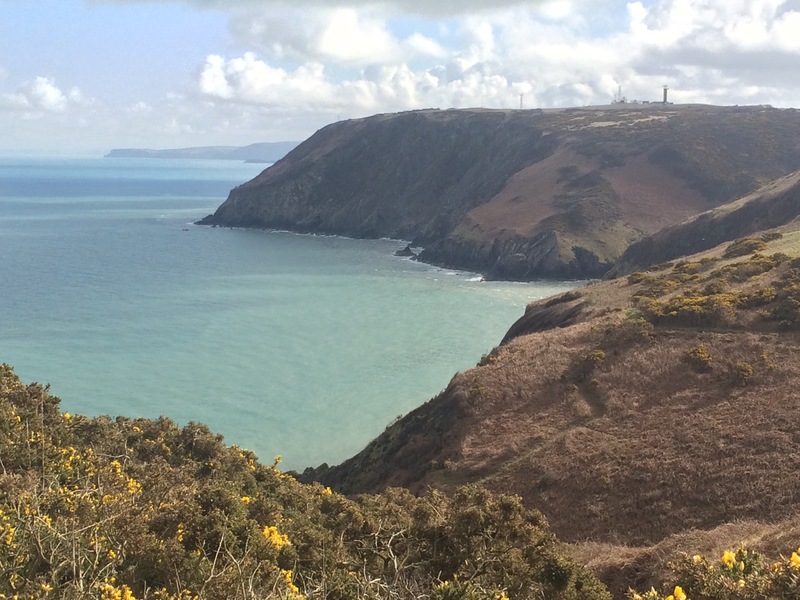 Finally I was up on the cliff path heading towards Dinas Head. 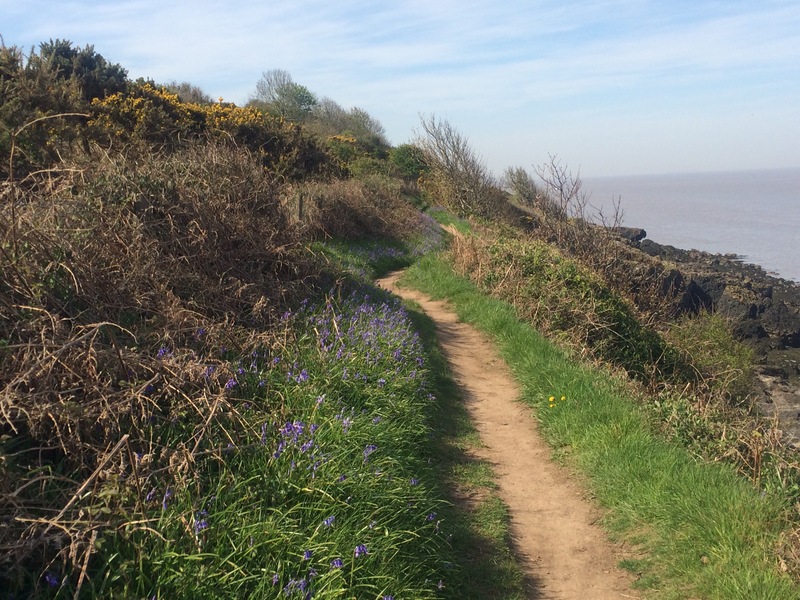 The path was incredibly muddy and I found myself slip-sliding at a snail’s pace. 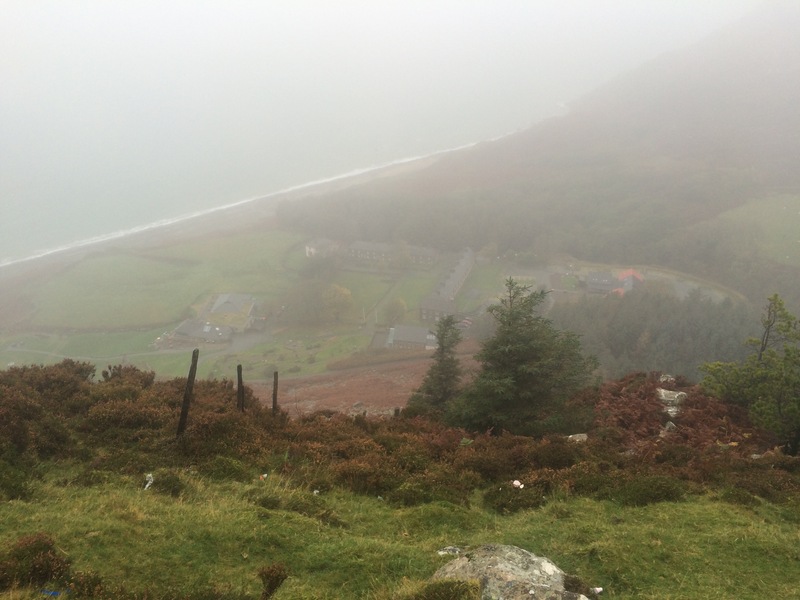 The views weren’t great, there was no wildlife about and it wasn’t long before I was soaked to the skin. 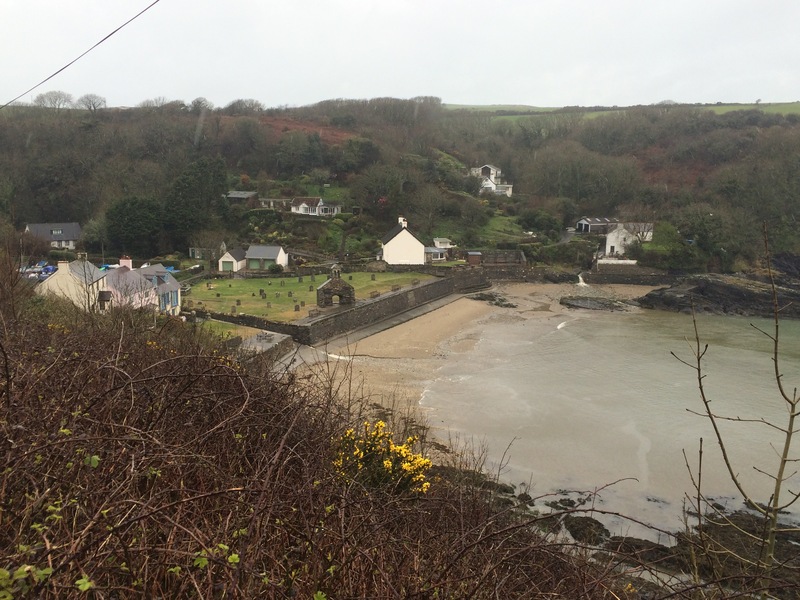 I hit the road into Cwm-yr-Eglwys, yet another quaint little village nestled in a cove with a beach. This one had a ruined church, St Brynach’s, that was destroyed in the Royal Charter storm of 1859. 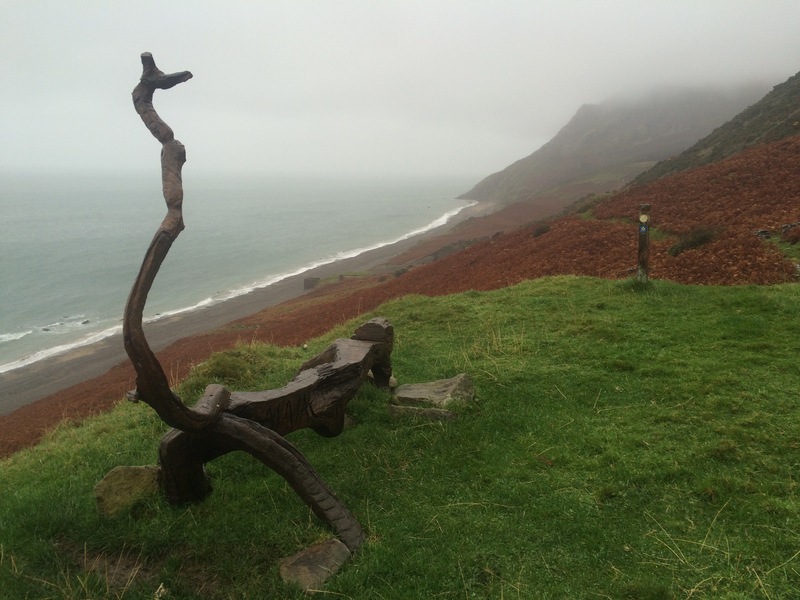 The Royal Charter was one of 114 ships lost off the Welsh coast in that storm. 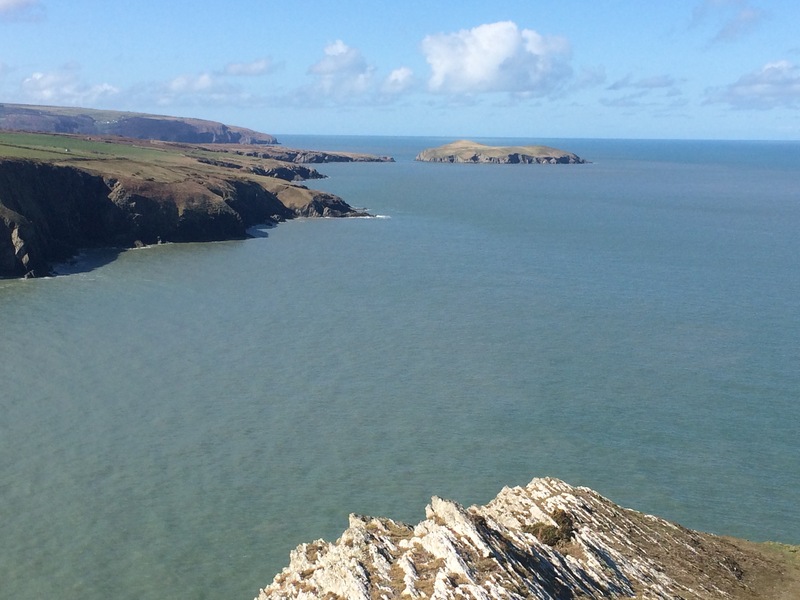 I decided there was no point walking around Dinas Head as it would just be a trudge up a muddy cliff top with no views to admire. 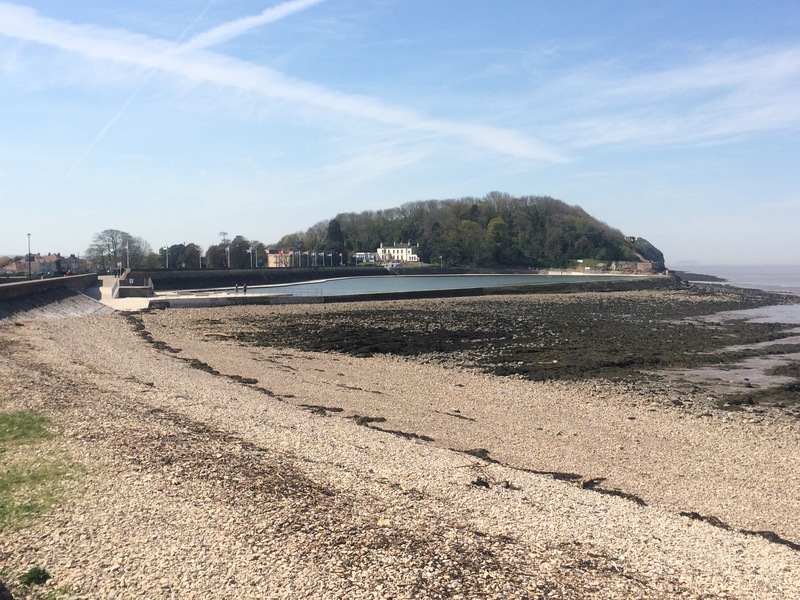 Instead I took the tarmac’d shortcut across the ‘neck’ of Dinas Island (not really an island) to Pwlldwaelod – a mirror image of Cwm-y-Egwlys except with a pub instead of a ruined church. A good place to stop for a coffee and reevaluate my day. 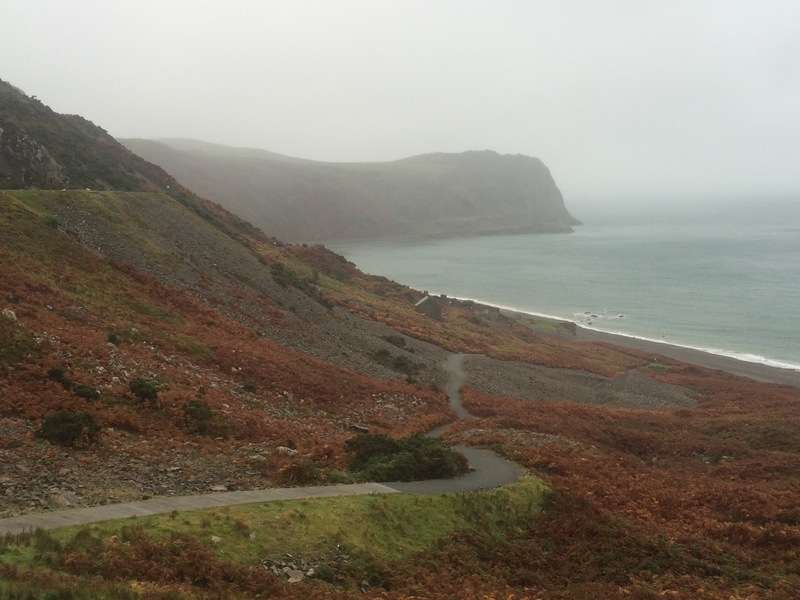 To be honest I wasn’t fancying another 6 miles slip-sliding along a cliff path. I took stock and found I could head less than a mile inland to Dinas Cross and catch a bus to Fishguard. Sorted. Bus drivers are great. This one stopped to let me off at the top of the hill on the way down into Fishguard Lower Town so I could go and look at the Old Fort at Castle Point. 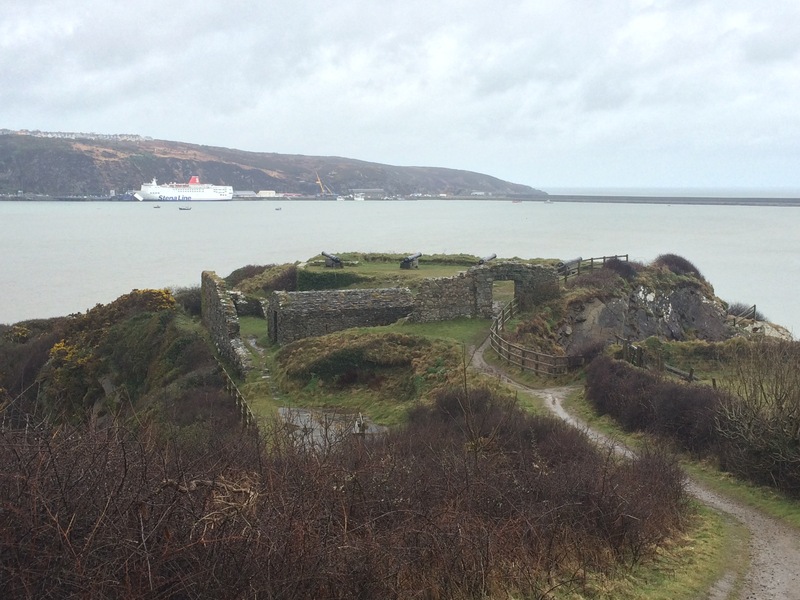 The fort was built in 1781 in response to the French Revolutionaries’ attempt to invade Fishguard four years earlier. The French seriously underestimated the size of the forces ranges against them (apparently the French spies mistook women wearing Welsh national costume for soldiers) and unconditionally surrendered (how unusual for the French!). Crisis averted but the prosperous town decided it needed to protect its port and so built a fort and armed it with a militia (3 invalid gunners from Woolwich – should be enough to take on the French). What a story. I thought the best part was that when the French landed the local cobbler, Jemima Nicholas, marched out with a pitchfork, captured 12, and went back for more! 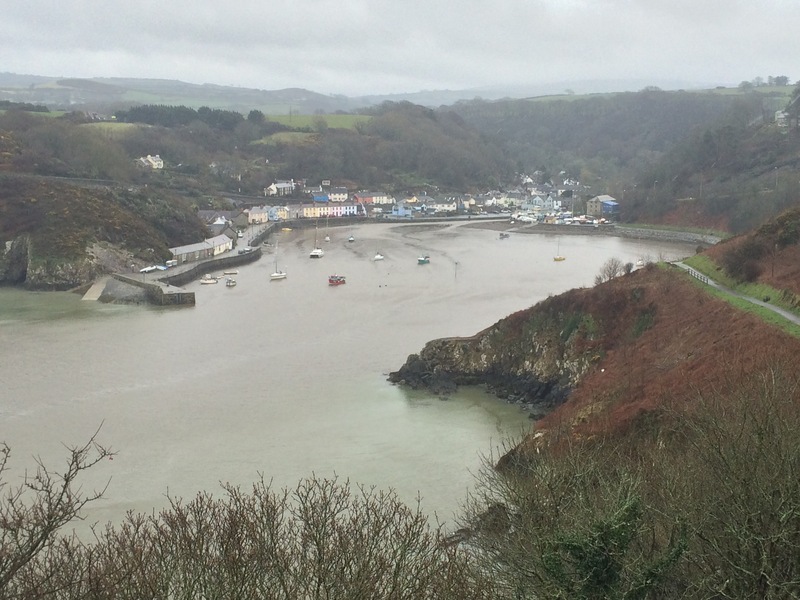 Fishguard Lower Town is nestled in a natural harbour and from here you can take the lovely Marine Walk up and around the small headland to face Goodwick (there’s no ‘w‘ in Good-ick) and the port. 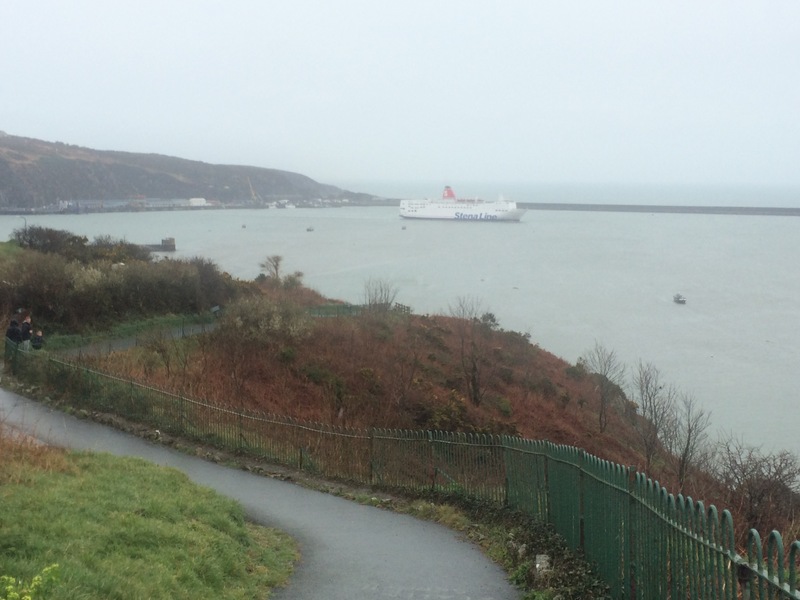 Fishguard ferry terminal is actually in Goodwick and was built by the Great Western Railway company in 1902 to try and attract transatlantic liners. 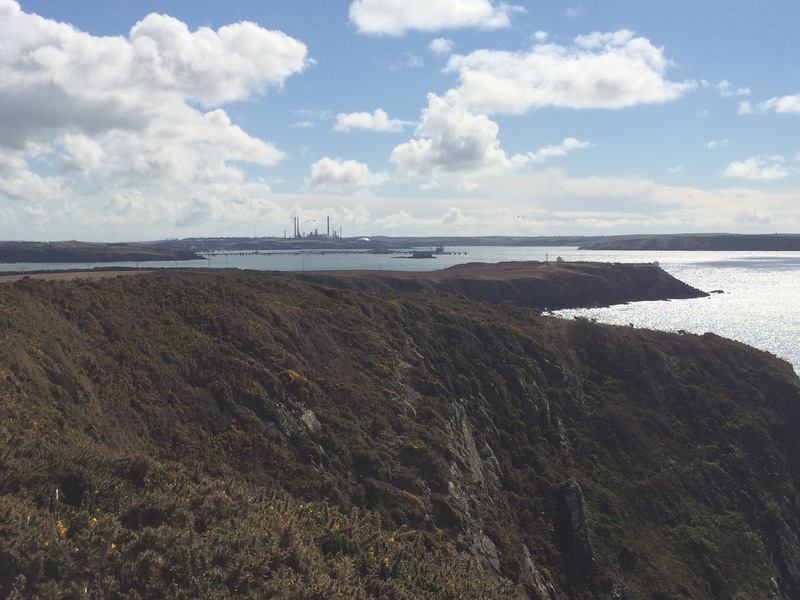 In 1909 the Mauretania dropped and, until The First World War, Fishguard was a regular stop for Cunards flagship liners, the Mauretania and the Lusitania. After WW1 Cunard moved its operation to Southampton. 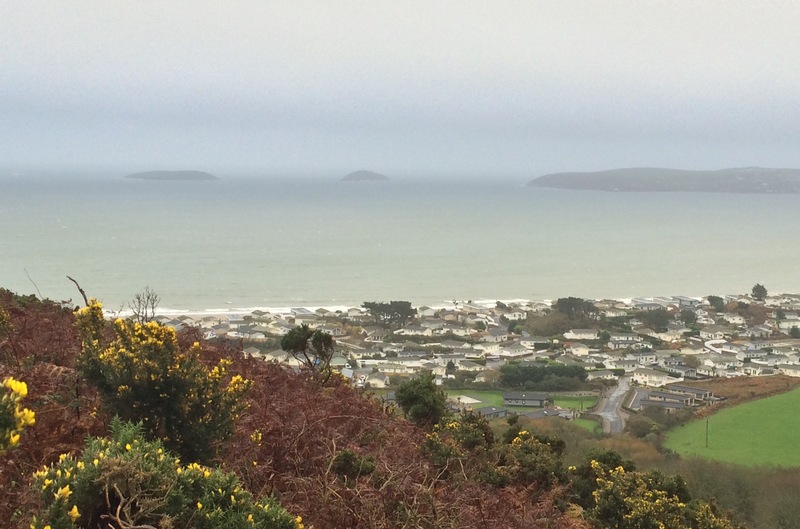 Goodwick’s other claim to fame is that in 1912 it was the take-off point for Denys Corbett Wilson when he became the first person to fly from Britain to Ireland. It took him 1 hour 40 minutes in his Beriot XI. 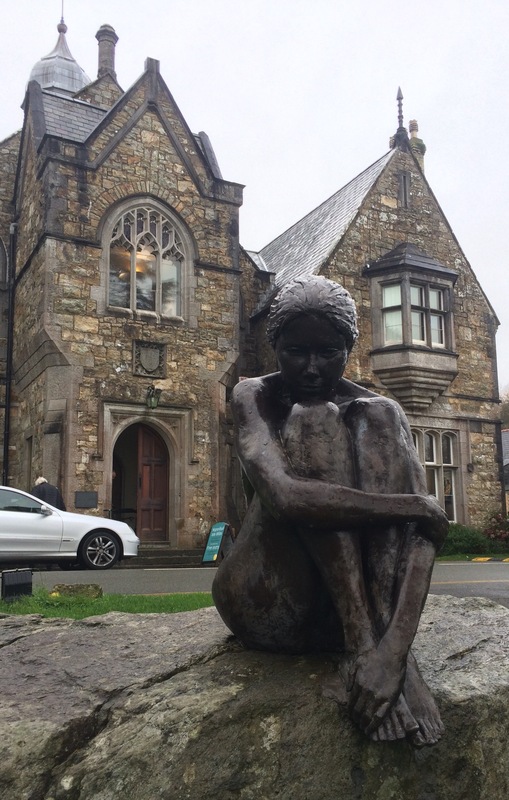 I had a nice evening chatting in the bar to Kylie and an American lady who was visiting Ffald-y-Brenin Christian retreat in Newport. 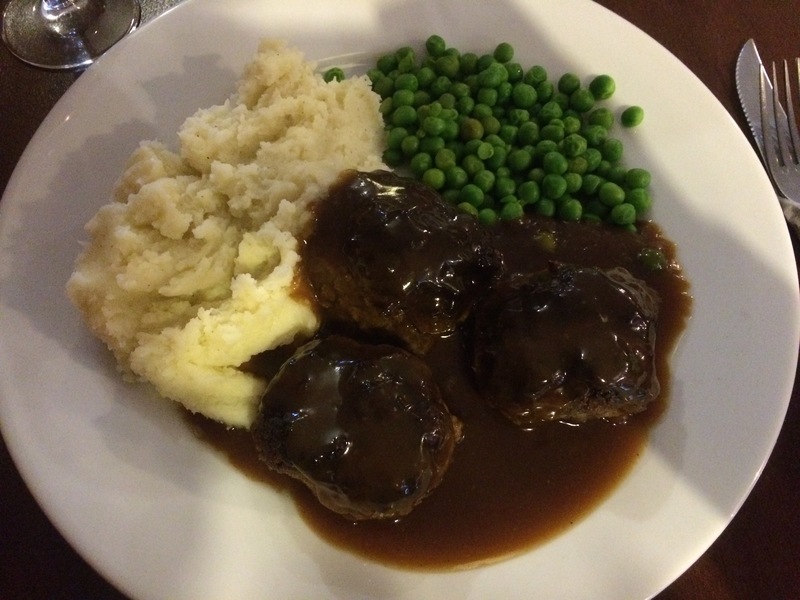 It seems every restaurant has faggots on the menu (a local dish here and in the Midlands) so I decided to try them this evening. Not bad actually. Another sunny day was promised so I put my shorts on. Naturally this put me at quite a juxtaposition with most other people I saw all day who were wrapped up in hats and coats. 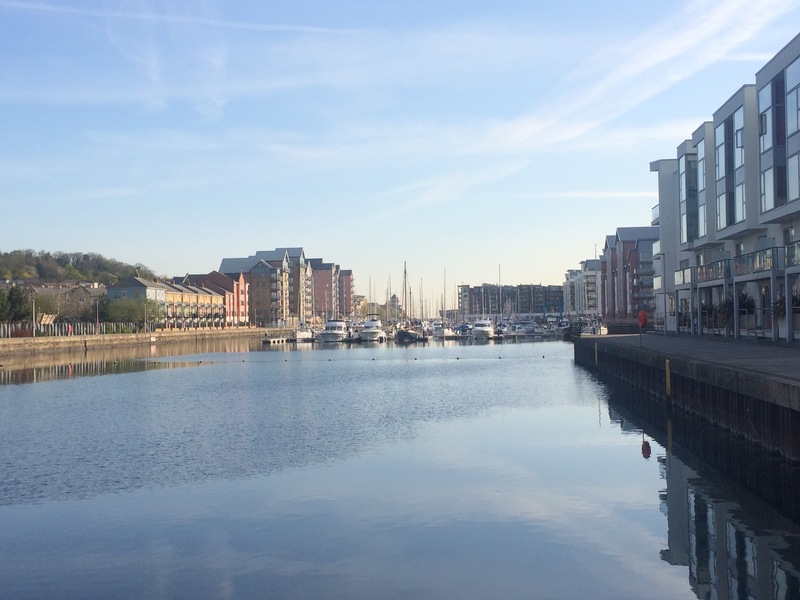 My cold, goose pimples skin enjoyed the extra dose of vitamin D.
My first big Welsh breakfast this morning to set me off. 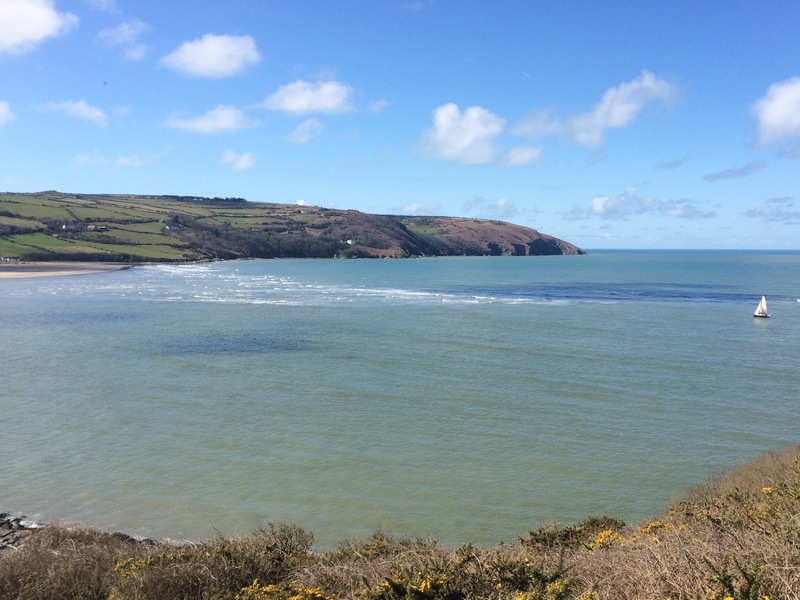 I caught the bus back to Aberporth, which meant missing out 5 miles from Llangrannog. 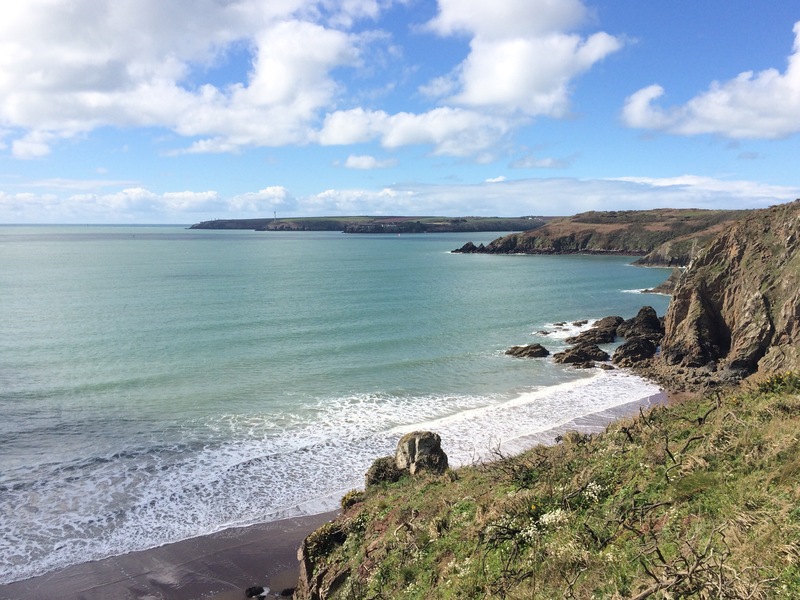 There were a few bonuses to this: 1) I can get a bus rather than a taxi, 2) some walkers I met advised me the section between Penbryn and Tresaith is the muddiest bit, 3) hopefully I’ll reach Cardigan early enough to do a bit of sightseeing. 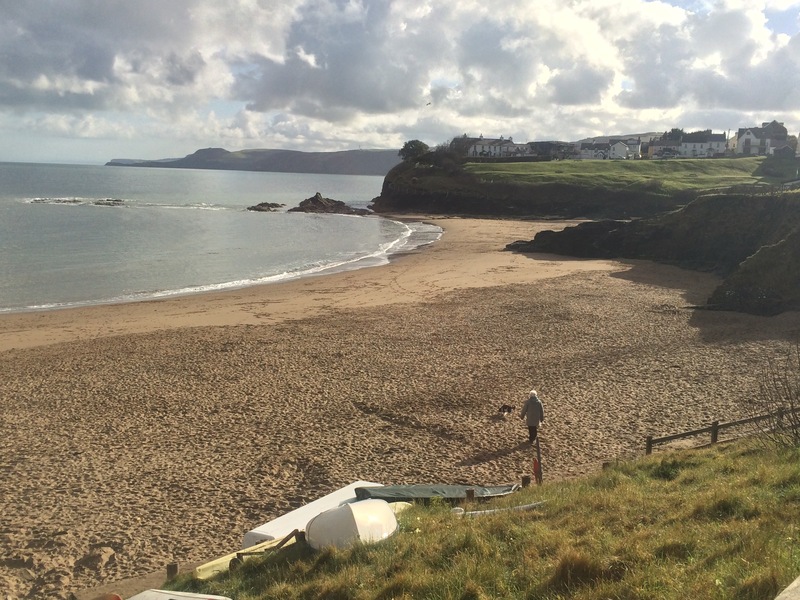 Aberporth beach was sandy and deserted. The town was very quiet. 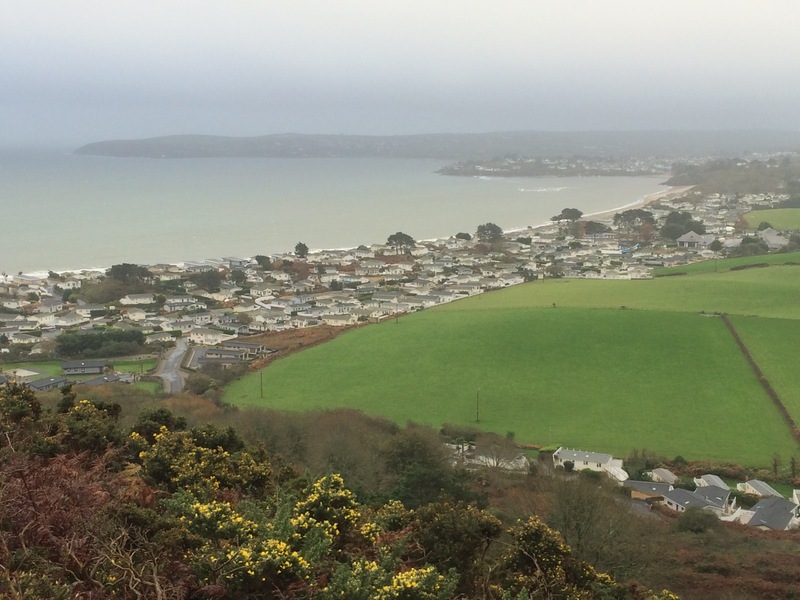 I realised that it hadn’t woken up yet when I ascended the steep hill up to MOD Aberporth; I saw several ladies putting their rubbish out, all in dressing gowns (it was almost 10 am!). 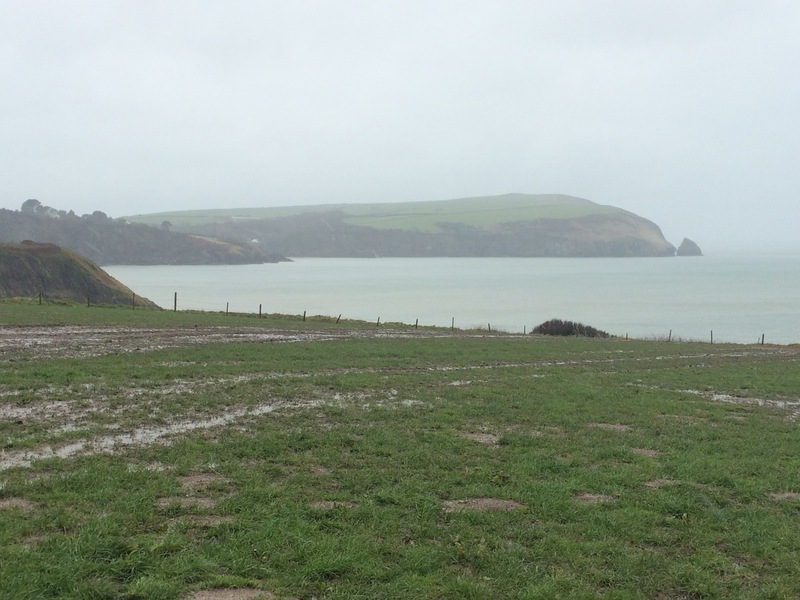 MOD Aberporth is used by QinetiQ to test Unmanned Aerial Systems and air launched munitions. 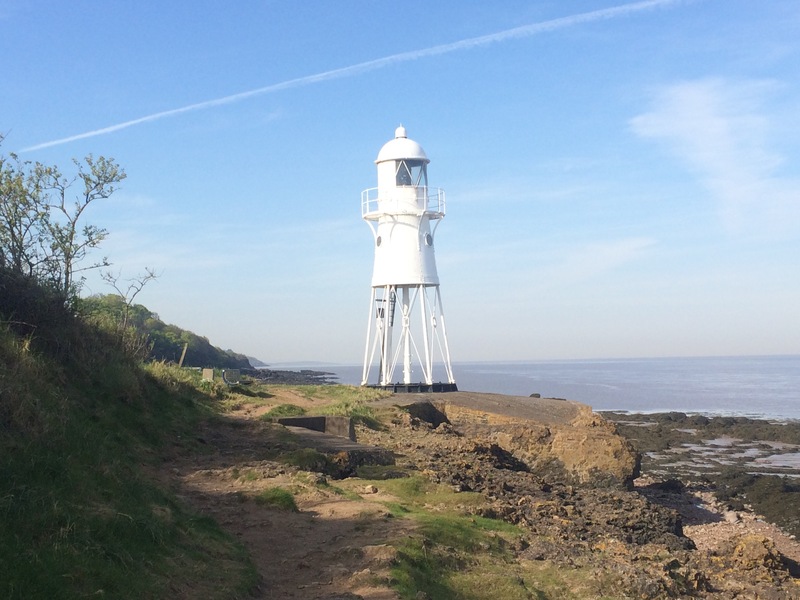 I skirted around it and headed into the cliff top. It reminded me of Durham, bisected by lots of small, steep gulleys with clear streams. 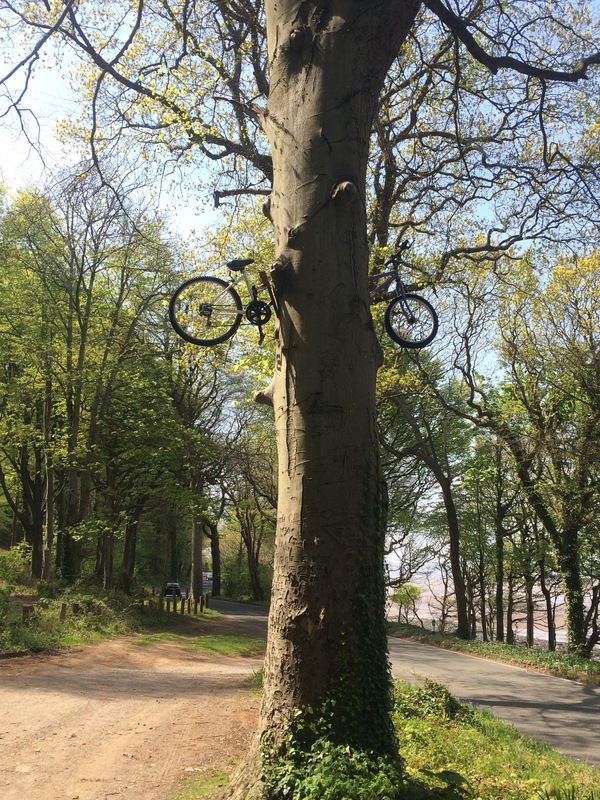 Good job I like ups and downs! 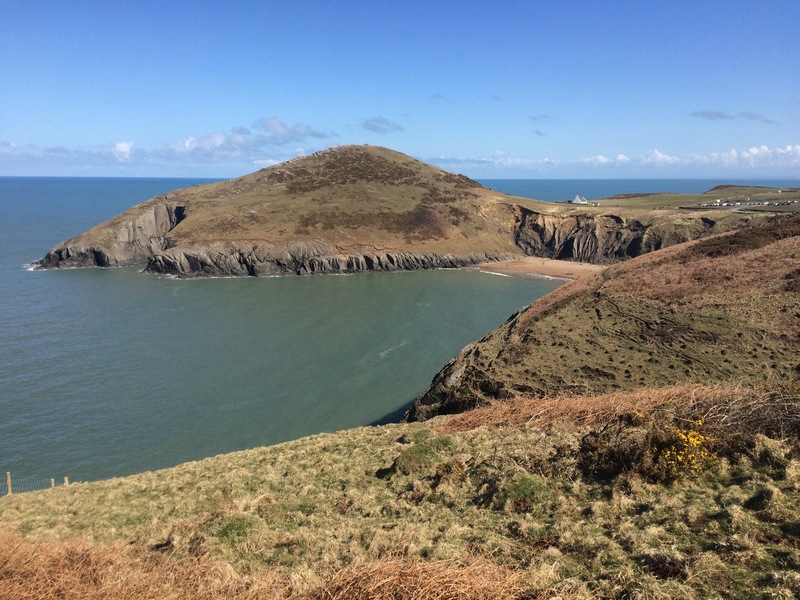 The conical hill, Foel-y-Mwnt, sticks out like a beacon. 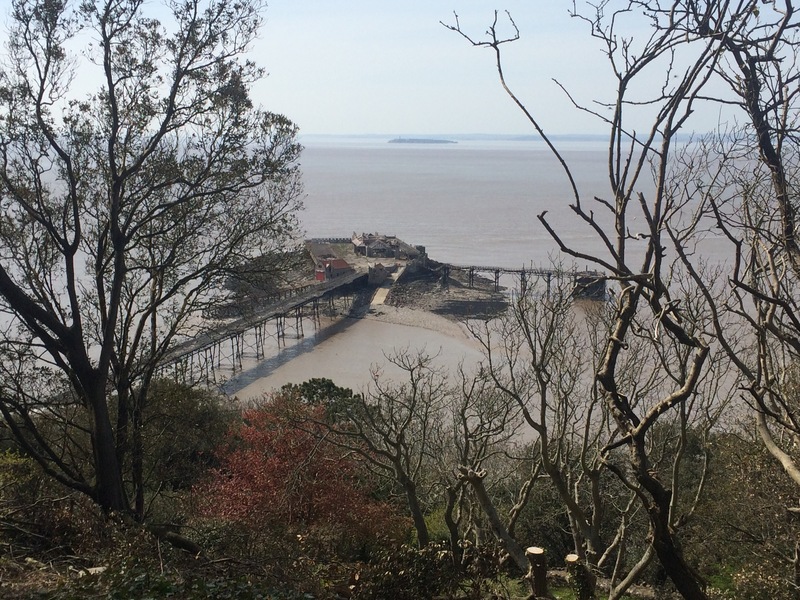 It was shaped by an ice age glacier and demands to be climbed. 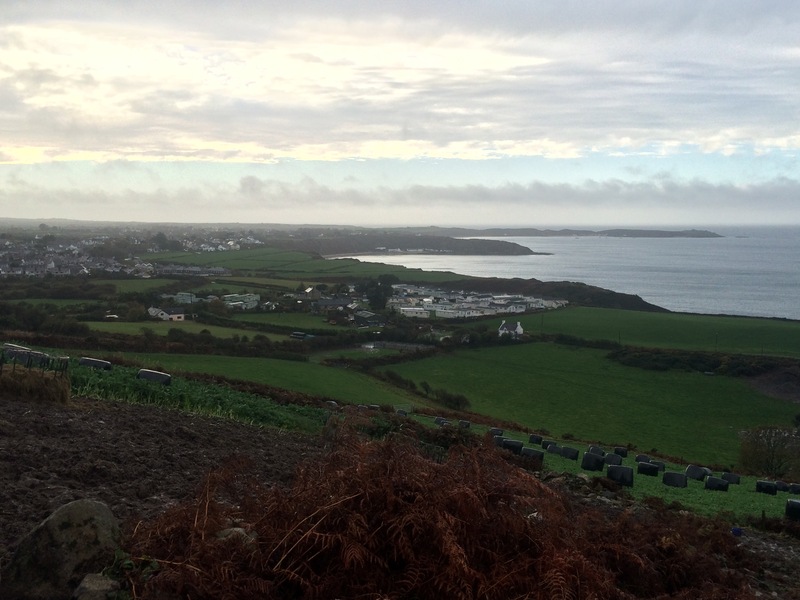 From the top I got the best view of Cardigan Island. 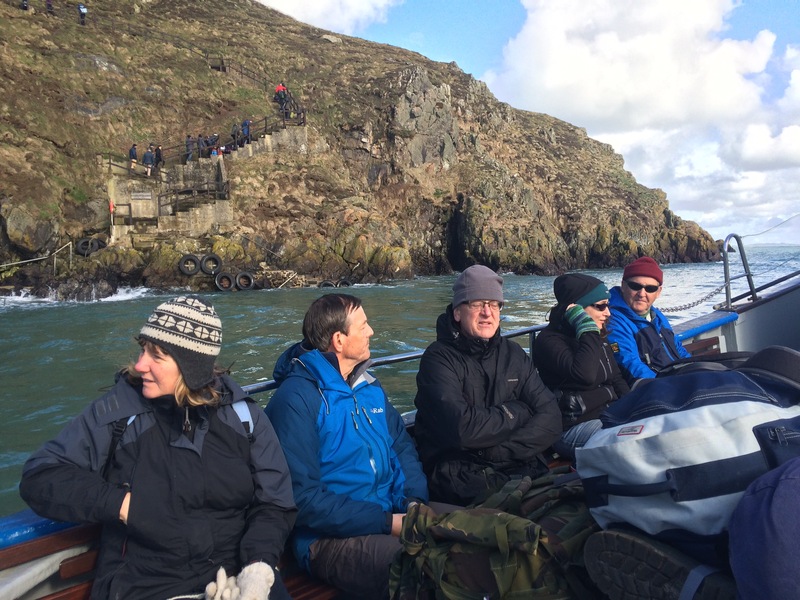 I couldn’t see any of the dummy puffins that have been put on Cardigan Island to try and entice real ones back to nest. The population was wiped out by a plague of rats accidentally introduced by a shipwreck. 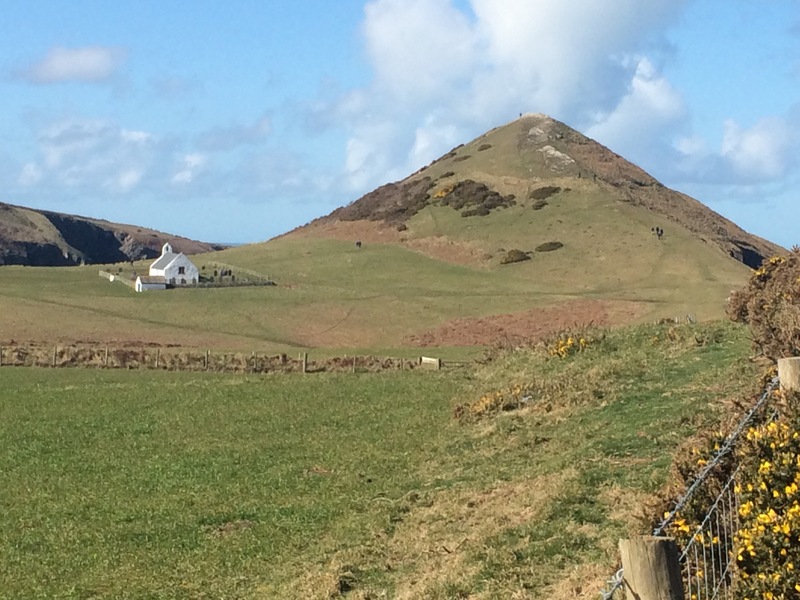 At the base of Foel-y-Mwnt is the pretty little Church of the Holy Cross. 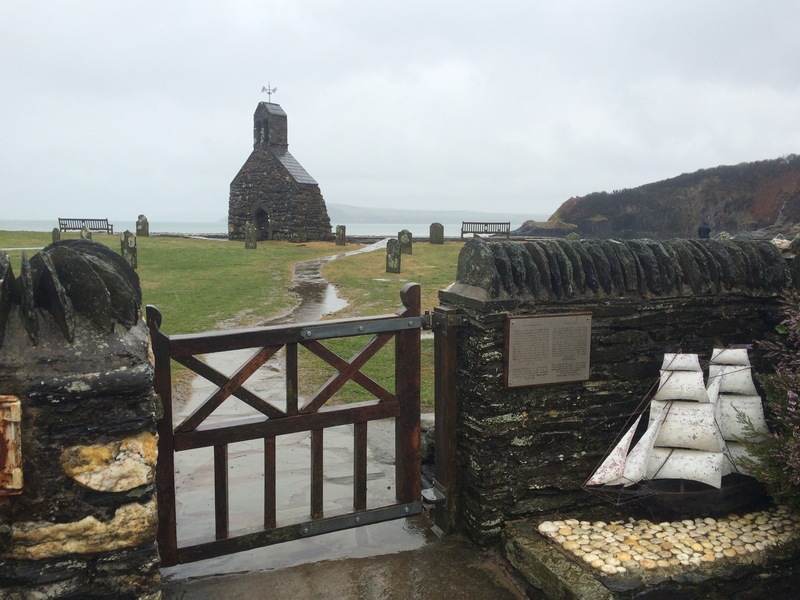 A tiny 13th Century building at the start point for pilgrims embarking for Bardsey Island from Mwnt beach. 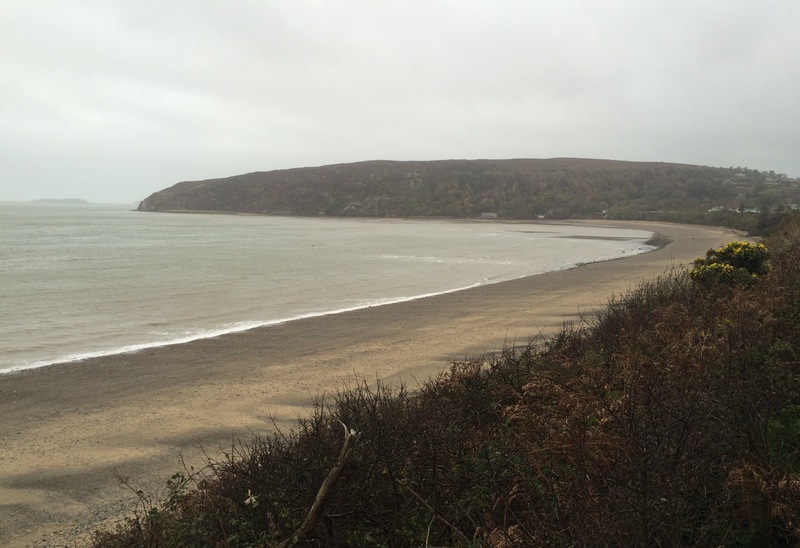 I stopped for a quick instant coffee at Mwnt beach hut (the owner was also wearing shorts). 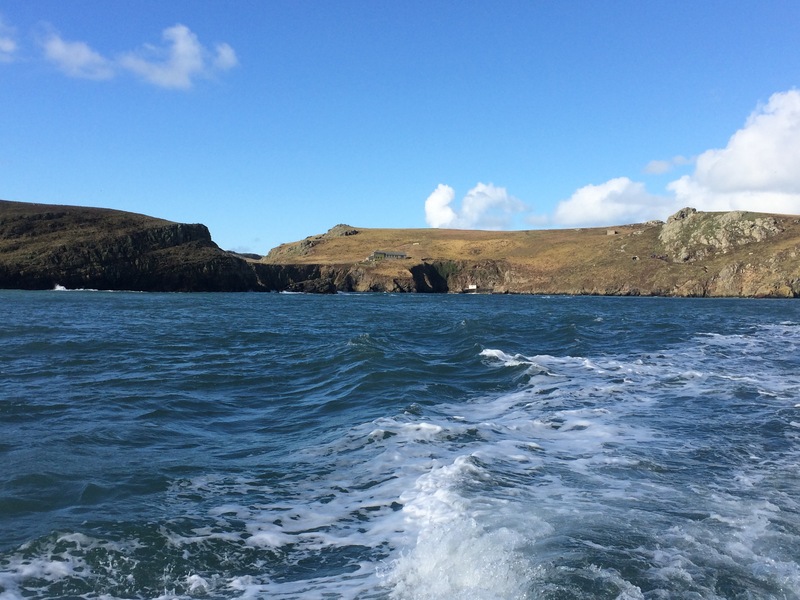 Then it was around the corner at the mouth of the Aber Teifi. 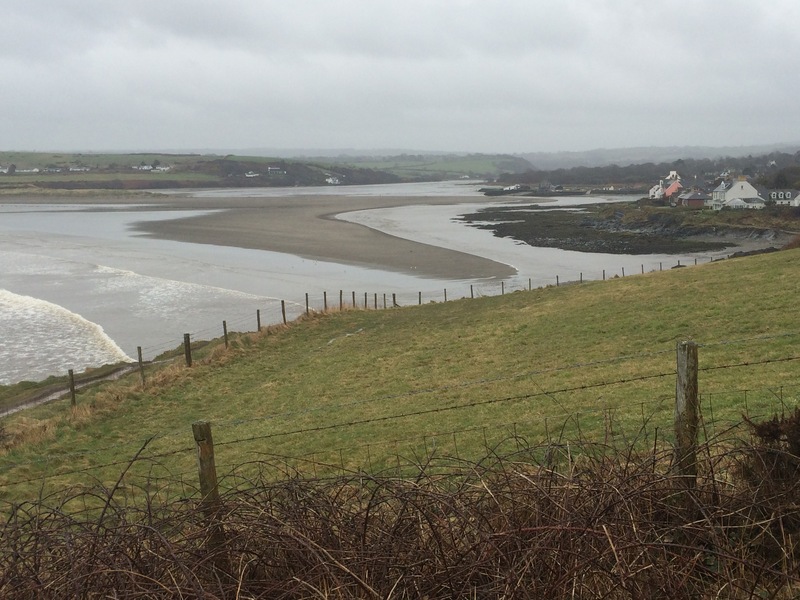 Gwbert sits right at the entrance to the river, looking across at Poppit Sands. There were a few big houses here. 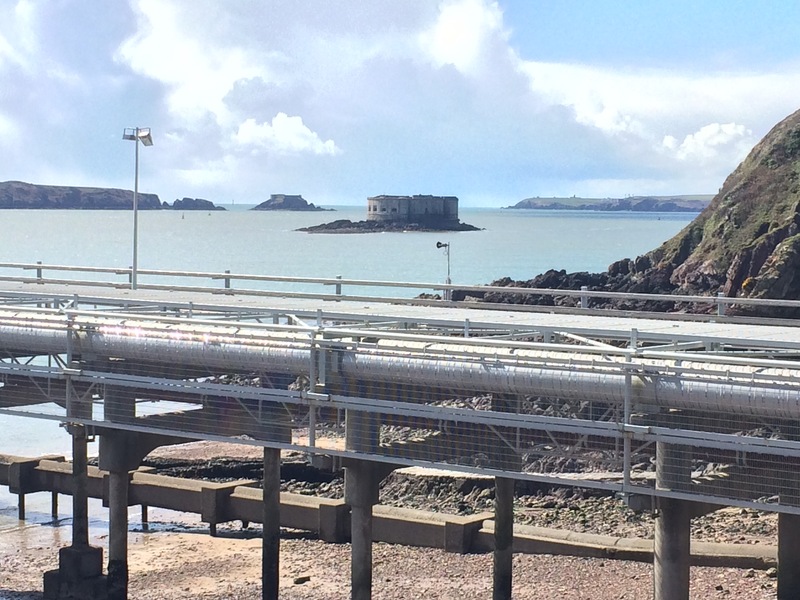 As I approached Cardigan (otherwise known as Aberteifi) I passed a sewage treatment works. Nothing unusual about that; however, just below it, hidden in the trees by the water’s edge, was a camp. 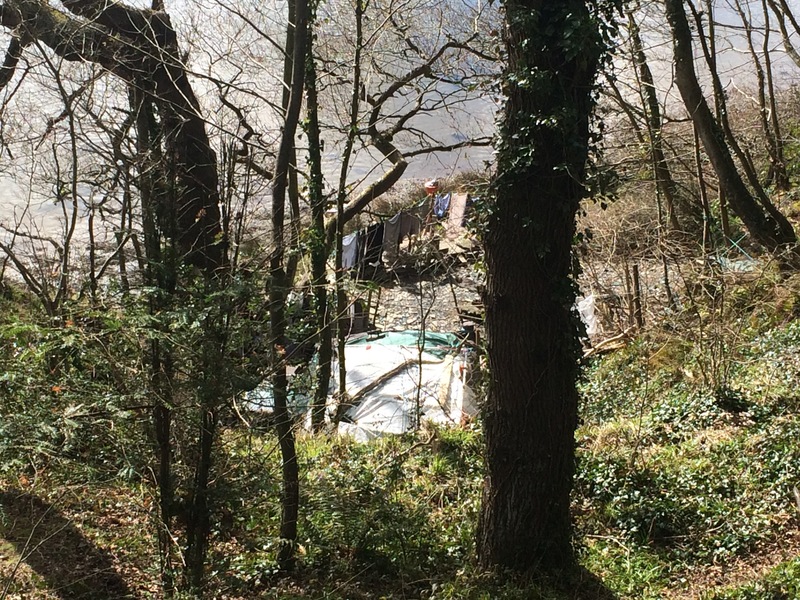 This was clearly someone’s permanent home as I could see a chimney emanating from the tarpaulin, washing on a line and even a swing seat made from crates. I found the path down to it, marked by a hand rope tied to the trees. I started to walk down but a man emerged from the tent and I suddenly felt like I was trespassing. I doubt he pays council tax. 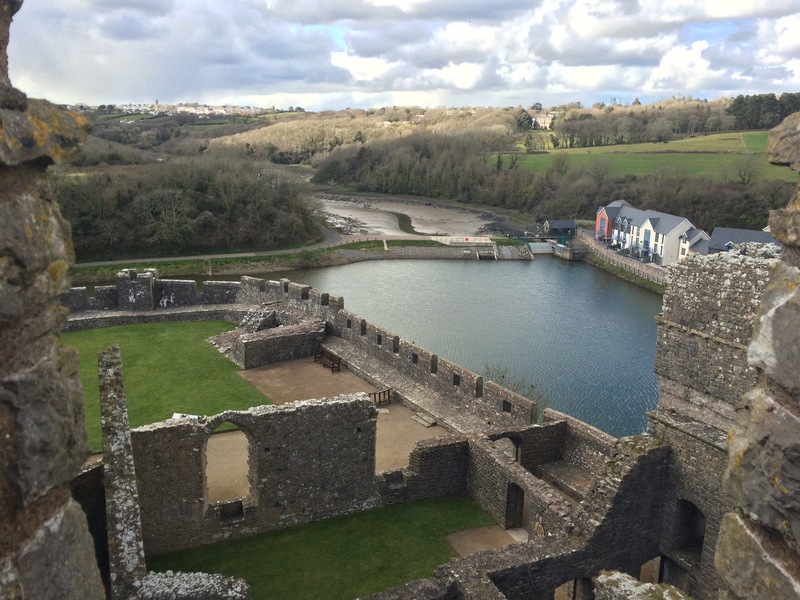 I made it to Cardigan in time to take a look around the castle. 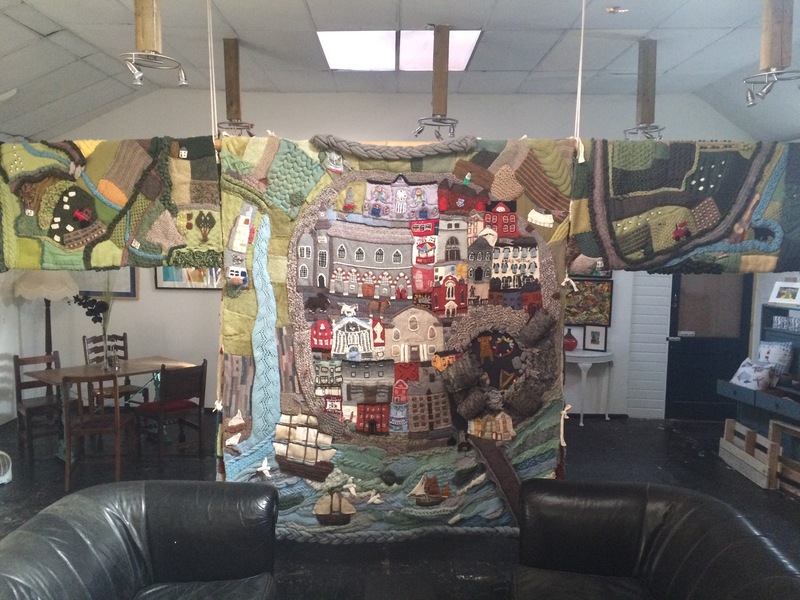 Cardigan has an important place in Welsh history as for many years it was on the threshold between Welsh and English kingdoms. 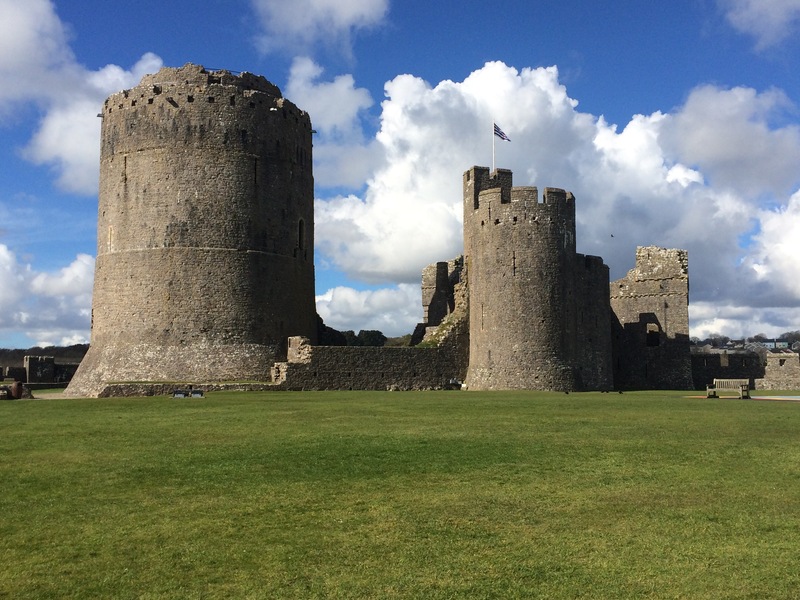 The first stone castle was built by Rhys Ap Gruffydd, Prince of Deheubarth, around 1165. 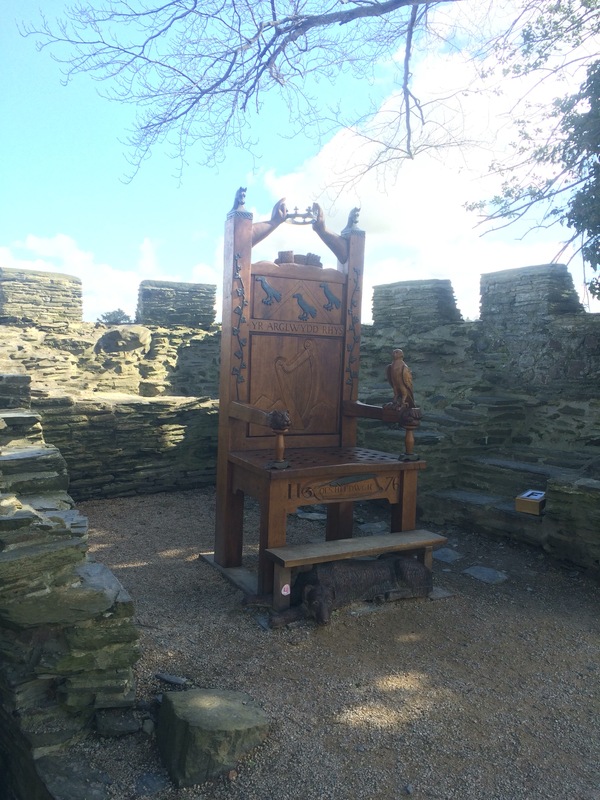 He united some of the Welsh kingdoms and made Cardigan the centre of his court. 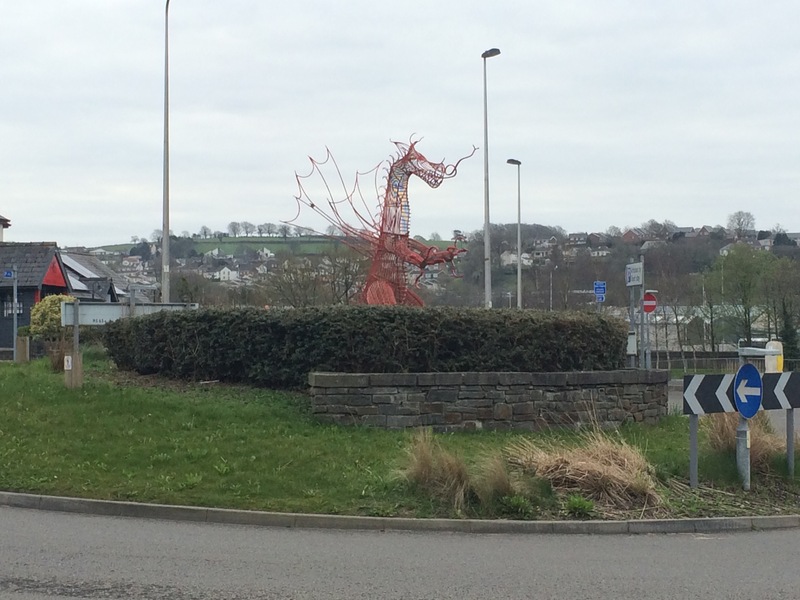 The town seems most proud of the fact that, under Rhys, it was the birthplace of the Eisteddfod in 1176. Cardigan was ruled by the English for many years (the castle was sold to the English when Rhys died) but it seems very Welsh now. 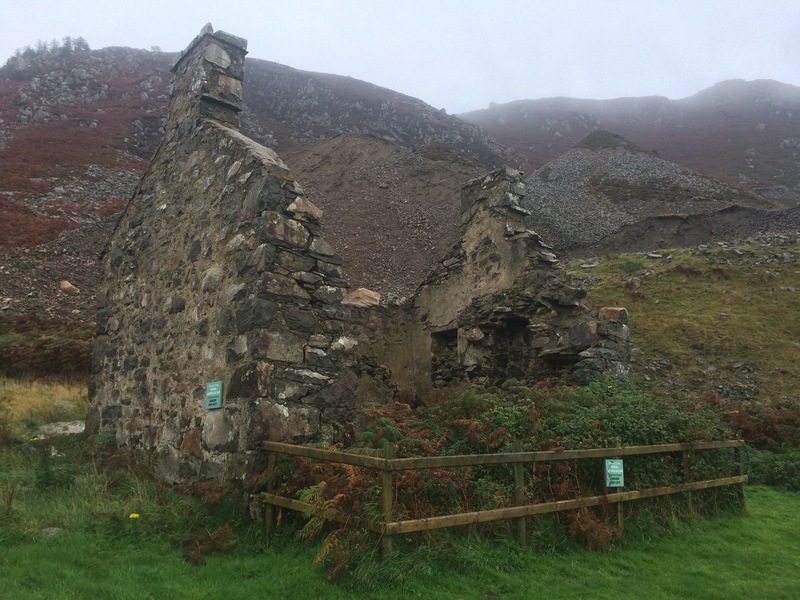 There’s not much of the castle left, indeed there’s a house in the middle of it. 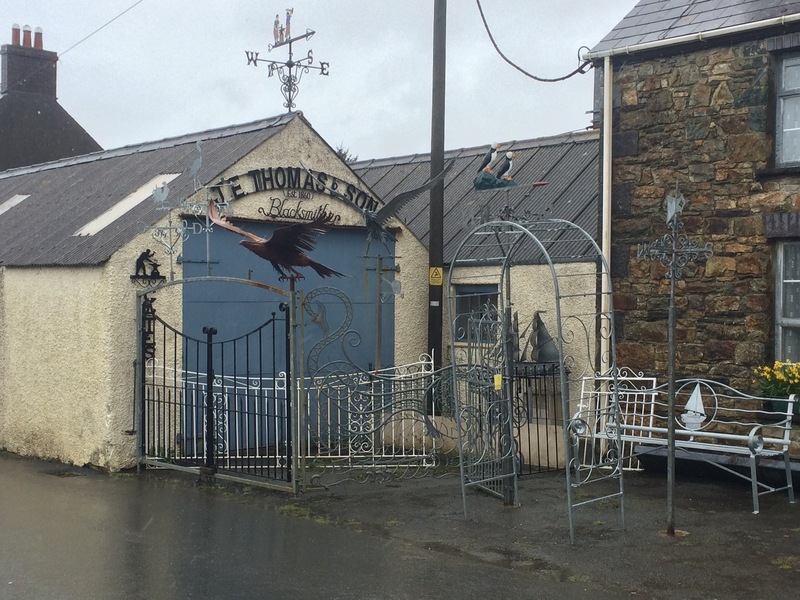 I wandered up the high street and, on the recommendation of the nice lady in the castle, I headed into Pendre Art shop. 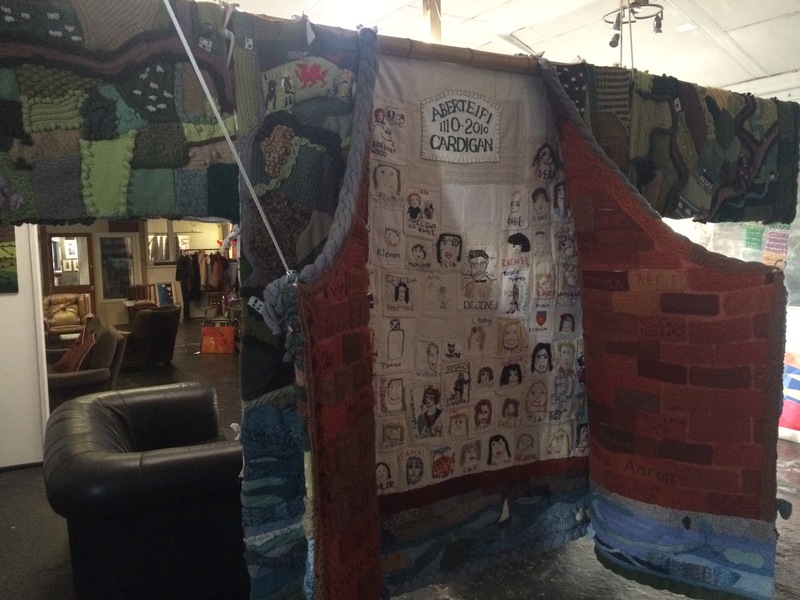 Here, tucked in the back room, is a giant cardigan knitted by the townspeople to mark the 900th anniversary of Cardigan. What a brilliant idea. I had an early dinner of delicious homemade pea, egg and ham pie in a cafe and headed back to my guest house for an early night. Another lovely breakfast and another rainy and windy day. 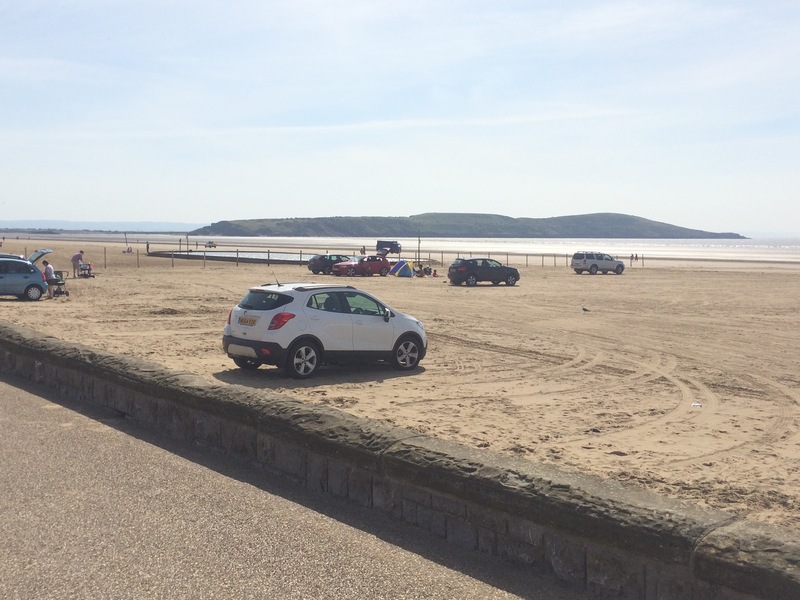 Steve and Jan drove me back to Abersoch. 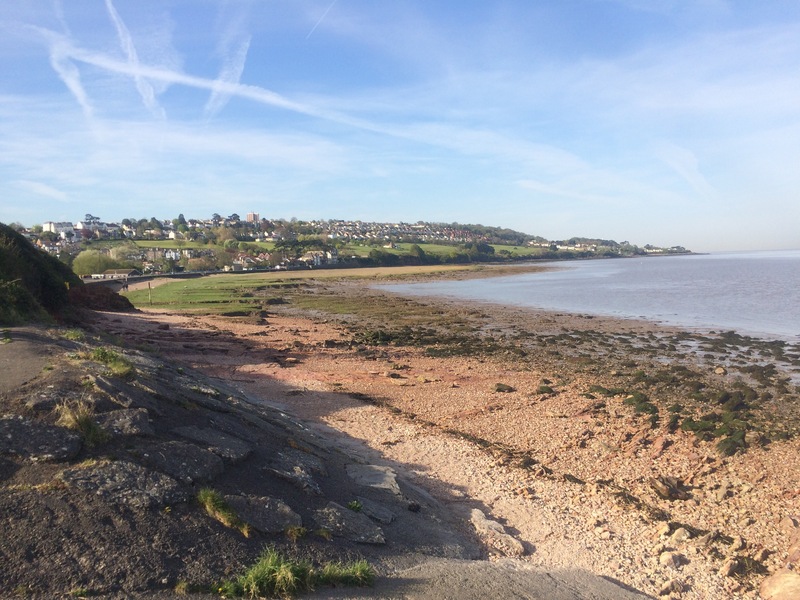 I walked along the other of the town’s beaches, along The Warren. 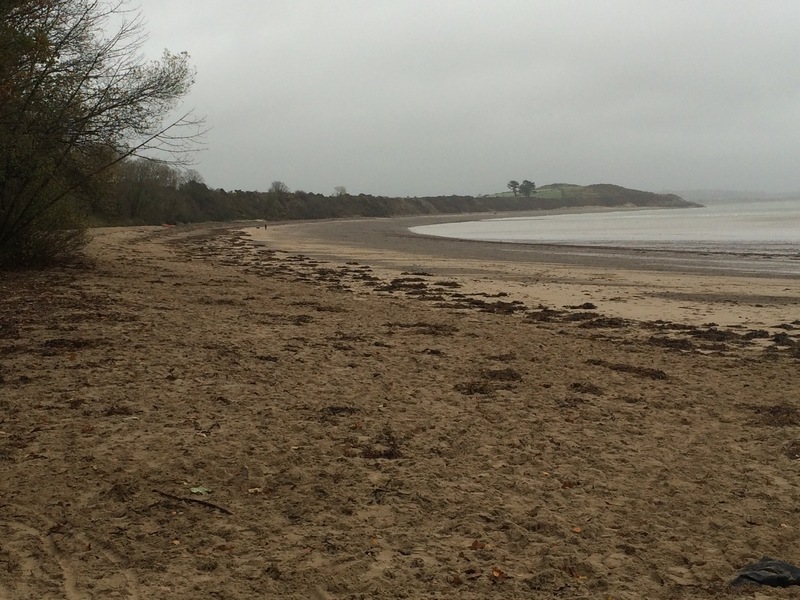 This was a really beautiful beach, with lovely golden sand, and behind it was the poshest caravan park I have seen. 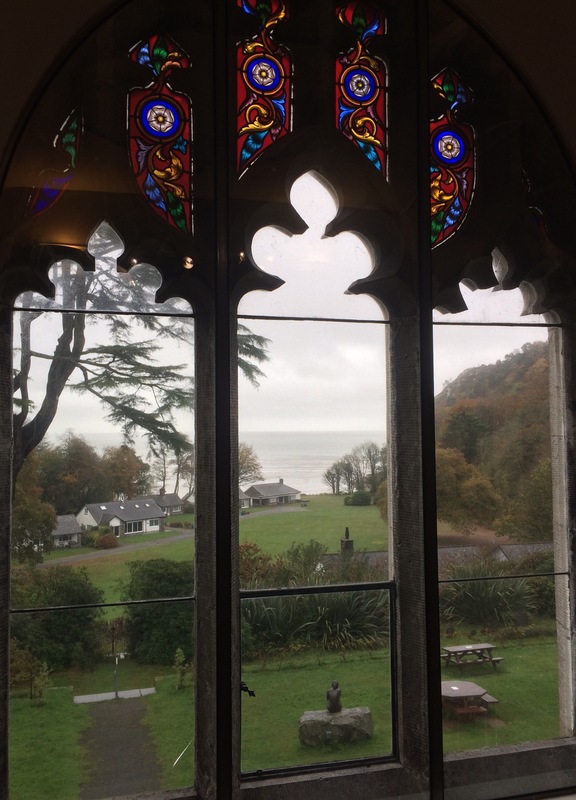 Some of the abodes were actually lodges and most had posh garden furniture and huge, tainted windows (and often a jet ski or motorboat parked outside). The development also had a health and fitness club and a couple of cafes. 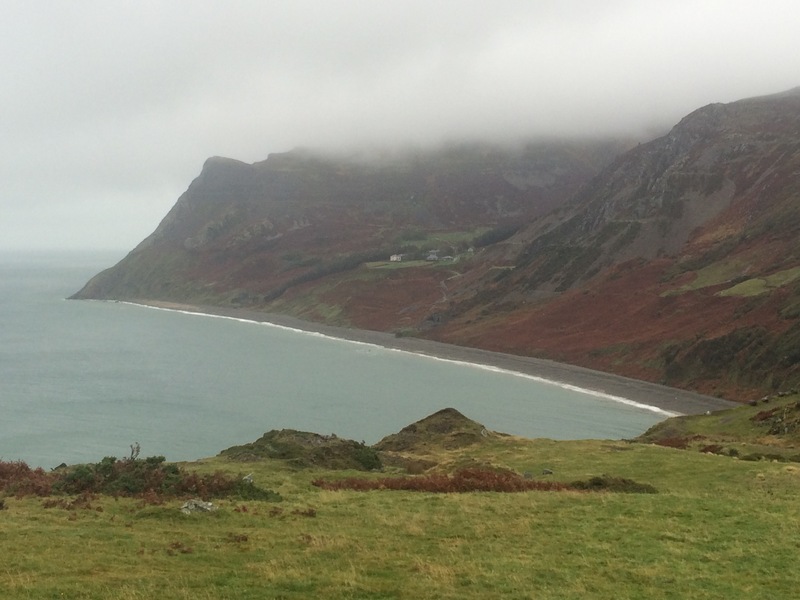 At the end of the beach I climbed the 132m high Mynydd Tîr-y-cwmwd. 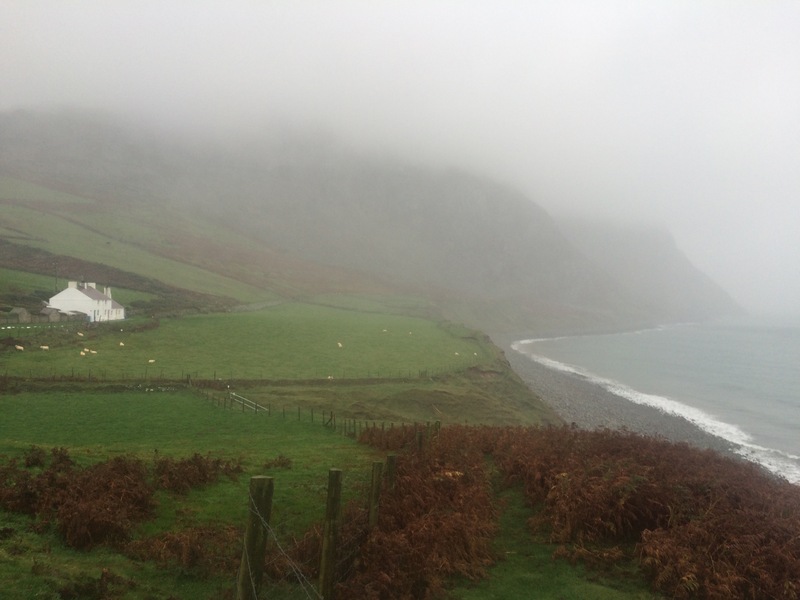 In good weather the views would be outstanding; today they were barely visible. 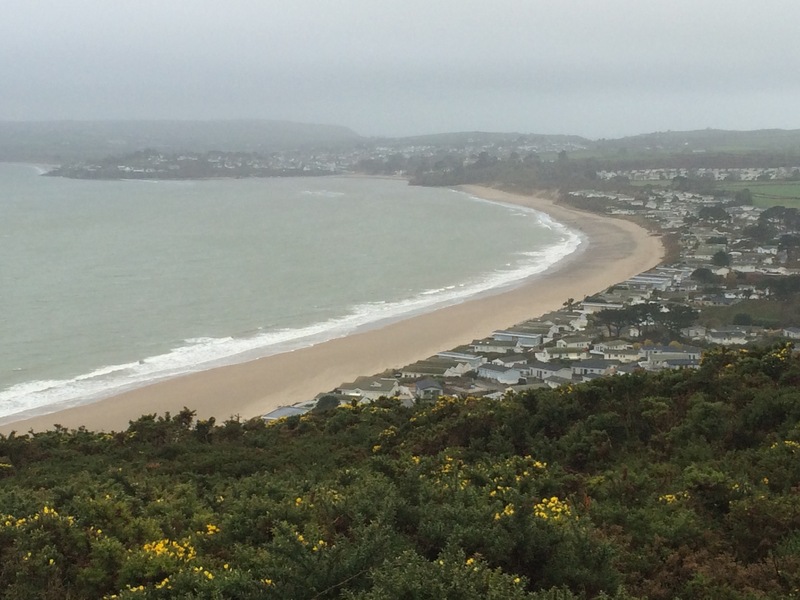 The walk down into Llanbedrog first passes The Tin Man on the cliff top. 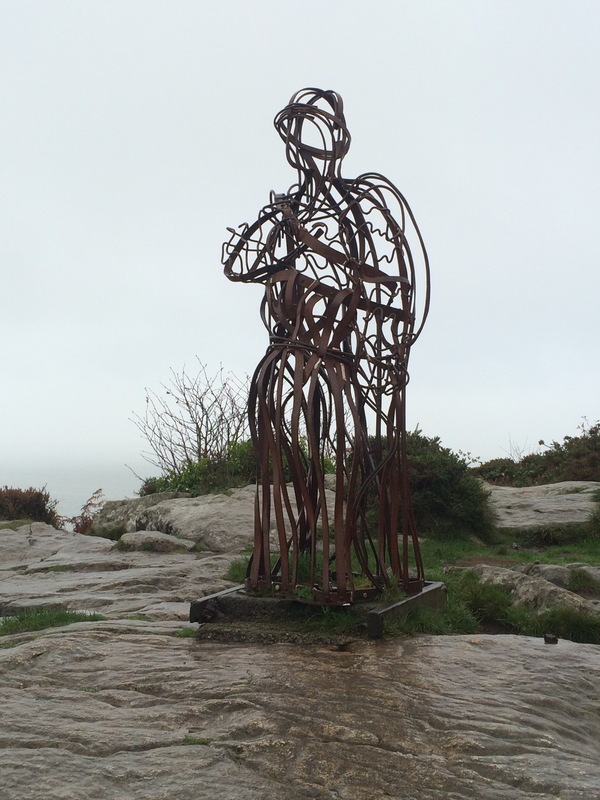 This is the 3rd statue in this place overlooking the town. 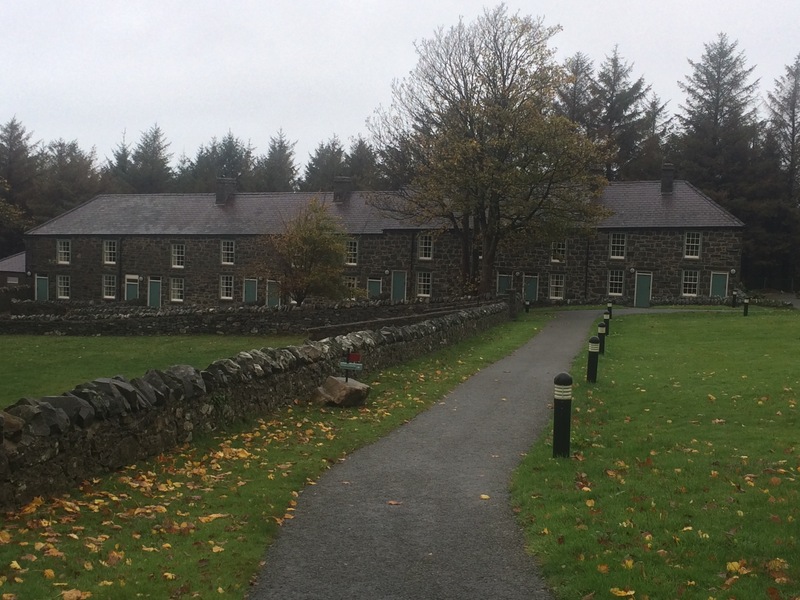 I headed down through the woods and grounds belonging to the Plas Glyn-y-Weddw, a dower house built in 1857 for Lady Love Jones Parry of Madryn. 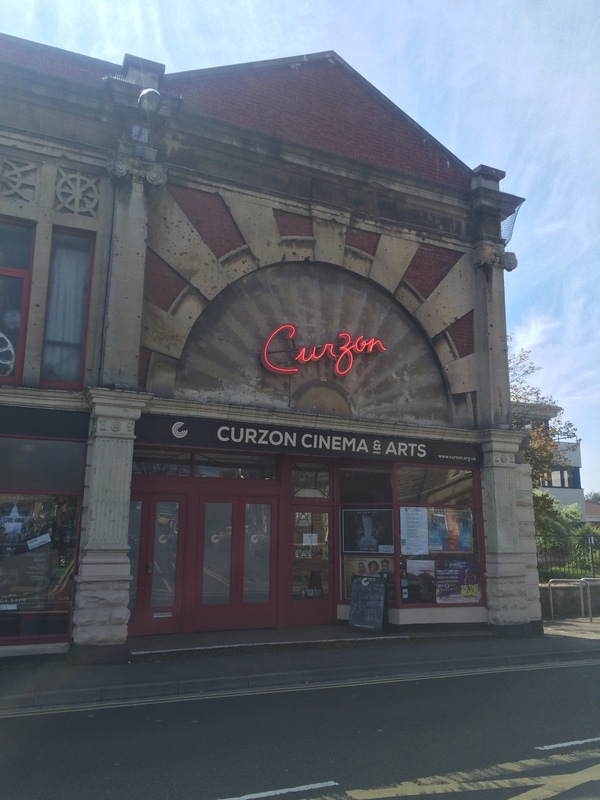 It is now an art gallery and cafe. I stopped to admire the paintings and get a coffee. 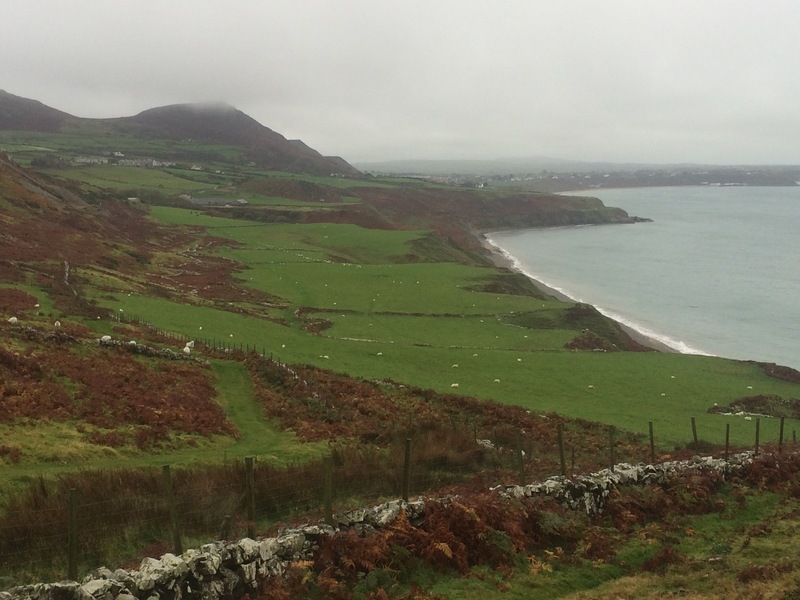 It was an easy walk into Pwllheli along the path that skirted Y Gamlas bay. 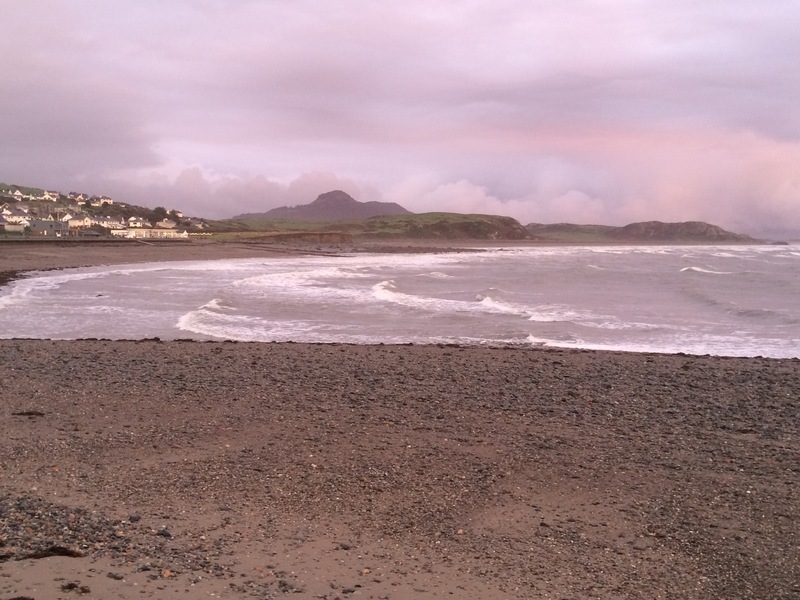 From Pwllheli the coast path mostly follows the road to Criccieth so, because I didn’t fancy a 2nd night in Pwllheli, I caught a bus to Criccieth. It hadn’t rained much all day, although the air was wetter than damp and there was a fair bit of mizzle (mist/drizzle). 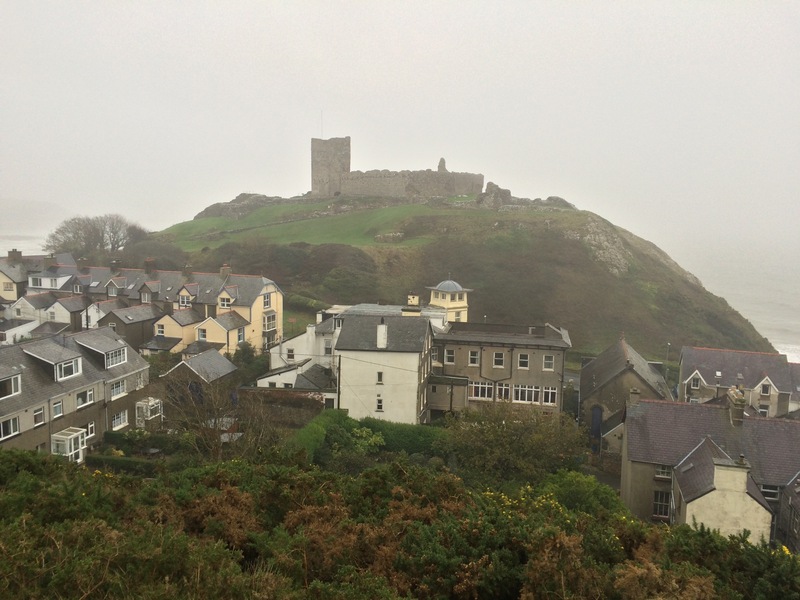 I arrived at my hotel, dumped my rucksack, and headed straight out to walk around Criccieth. The heavens opened and I got soaked! At least I got a quick look at the castle (which was closed) and the nice town. I liked the architecture and the cobbled footpaths opposite the castle. 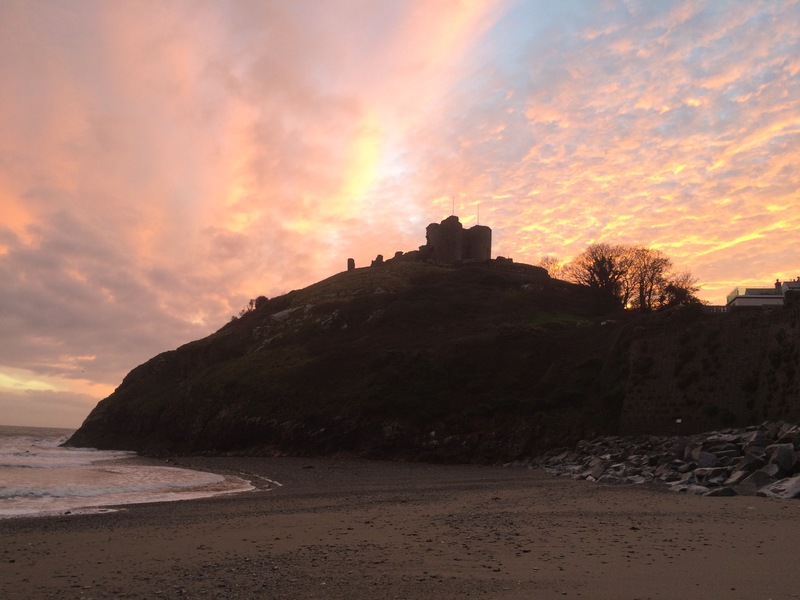 Criccieth Castle is perched on a small headland and was built by Llywelyn the Great. 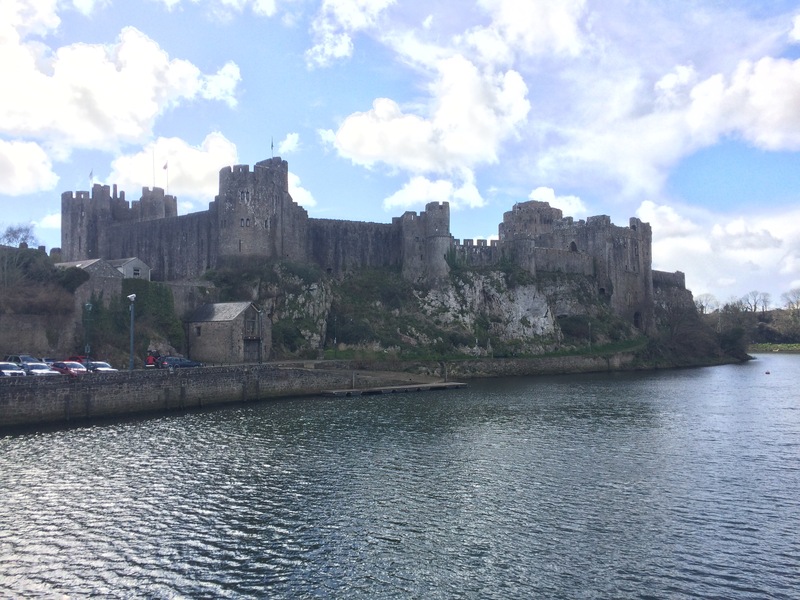 Fifty years after it was built King Edward I took the castle by force and later improved it. The town grew up around it. 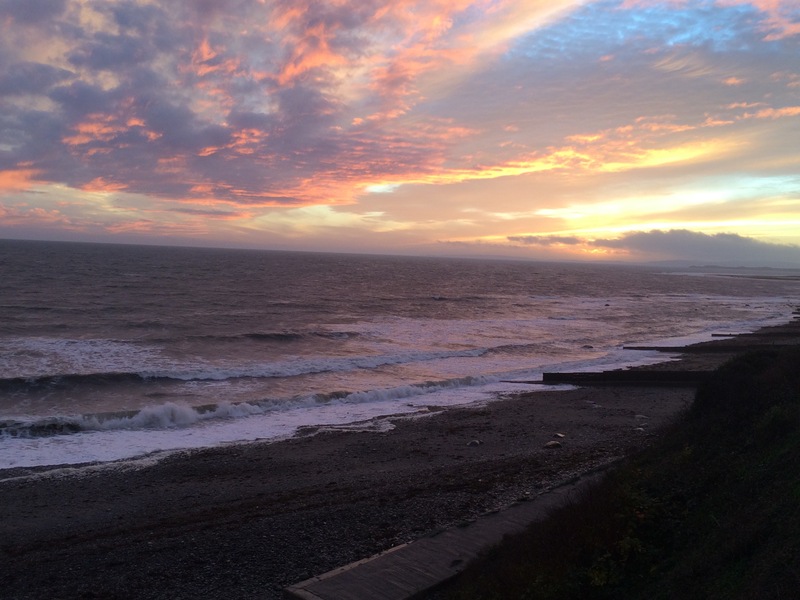 No sooner had I got back to my hotel than the sun came out in order to provide a sunset. I had to go out again to admire it! Steve and Jan had recommended The Spice Bank (an old bank turned into a restaurant) so I had a nice curry for dinner.